I was in the bathroom last weekend watering the lettuce I’m growing in the window when I got to looking at the way the light fell on the wall sconce. The glass body diffused the light while the golden base reflected it sharply. It was a nice contrast. 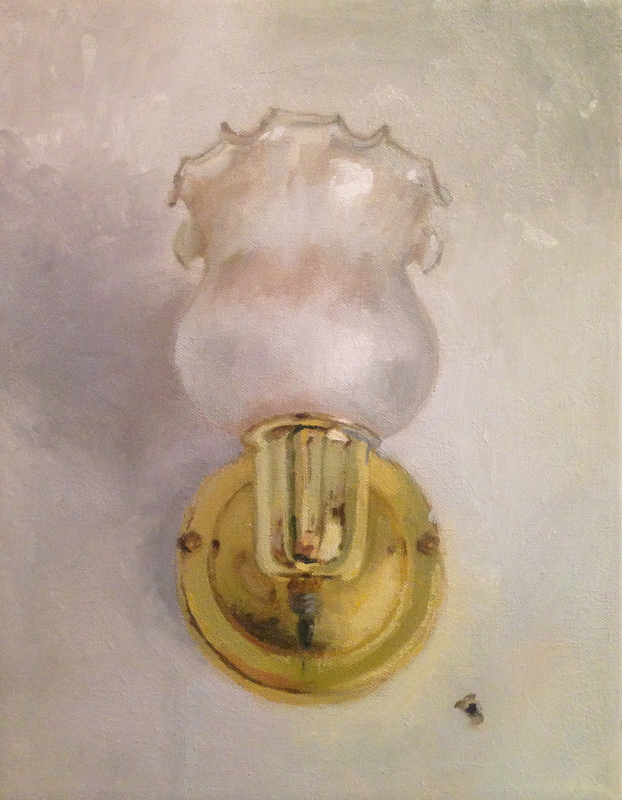 And since I haven’t done an oil painting in a while I thought the lamp would make a good subject for a new painting. Plus I have a lot of 16″x 20″ canvases that need to be used up. I grabbed one and got to work immediately. 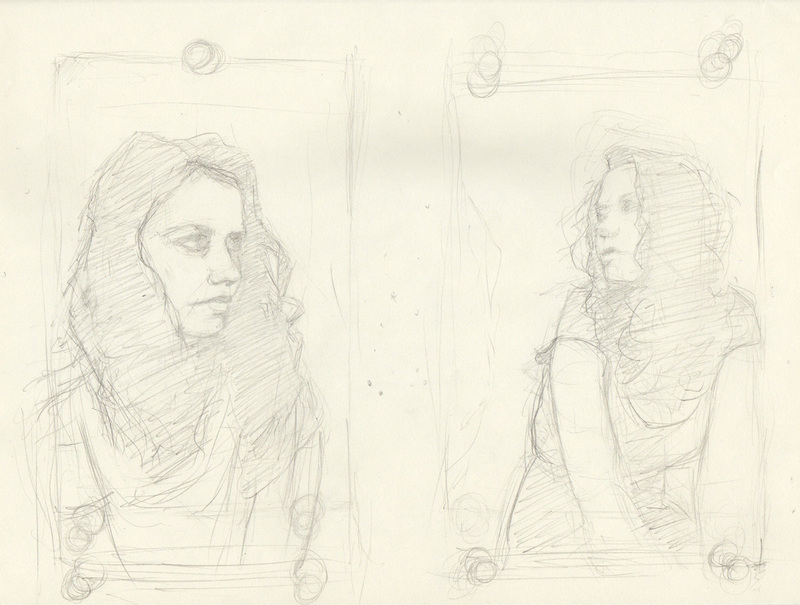 Last time I tried drawing in the bathroom I ran into a space issue with my easel. There was no reason to deal with that again so I just took a picture and worked from that. 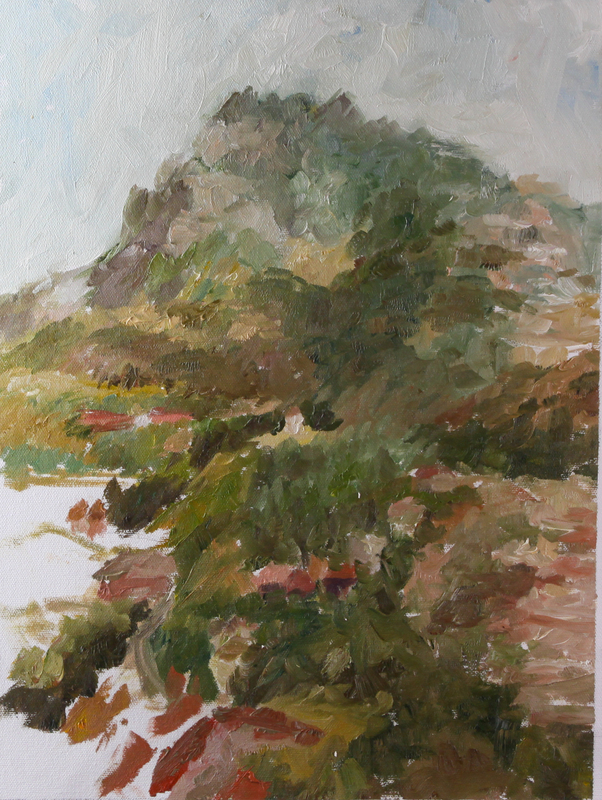 I kept the painting simple at the start to prevent it from becoming a replica of the photograph. After that I started every session by reminding myself not to get too focused about details. Keep the painting painterly. That was my motto. 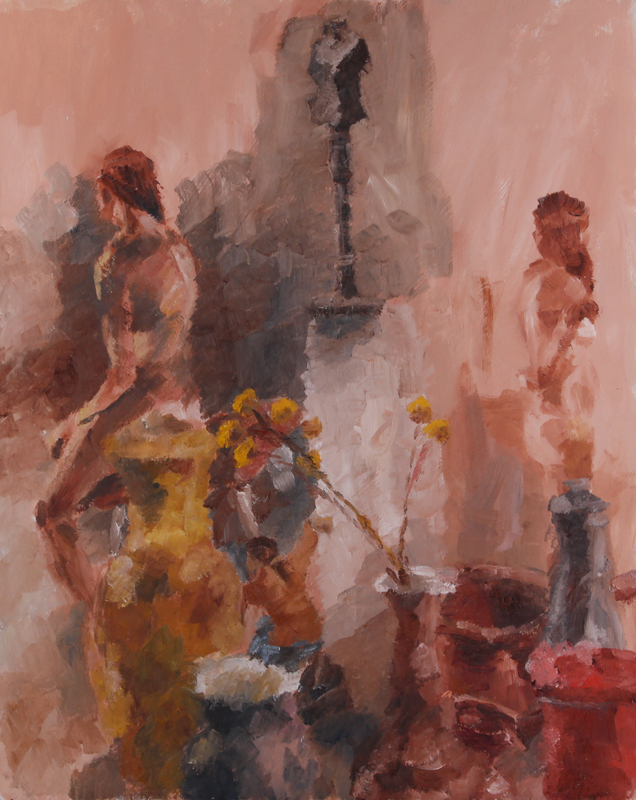 Recently I have been watching videos of how other artists paint and I’ve also spent a good amount of time looking over paintings at museums and galleries. Analyzing the work of other artists has helped me pick up a few tricks. 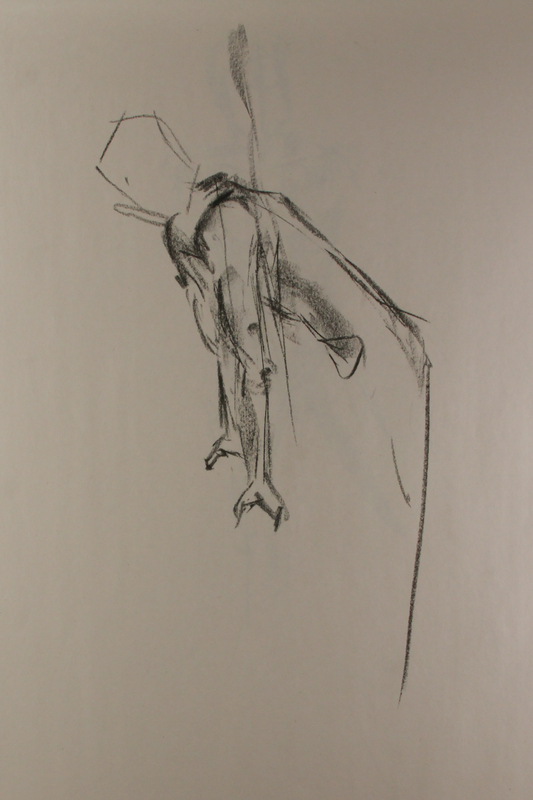 One revelation came while I was visiting the Museum of Art at UNH. 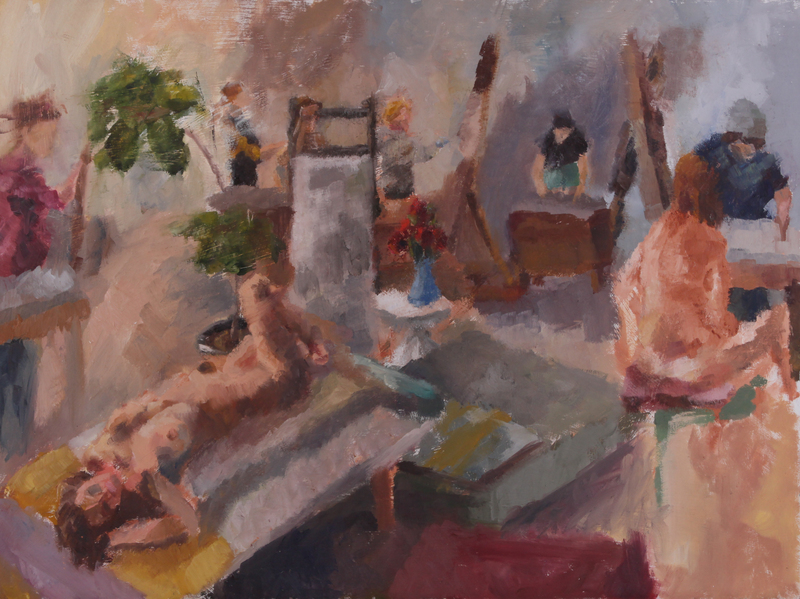 It was the end of the semester show where the professors present their recent works. 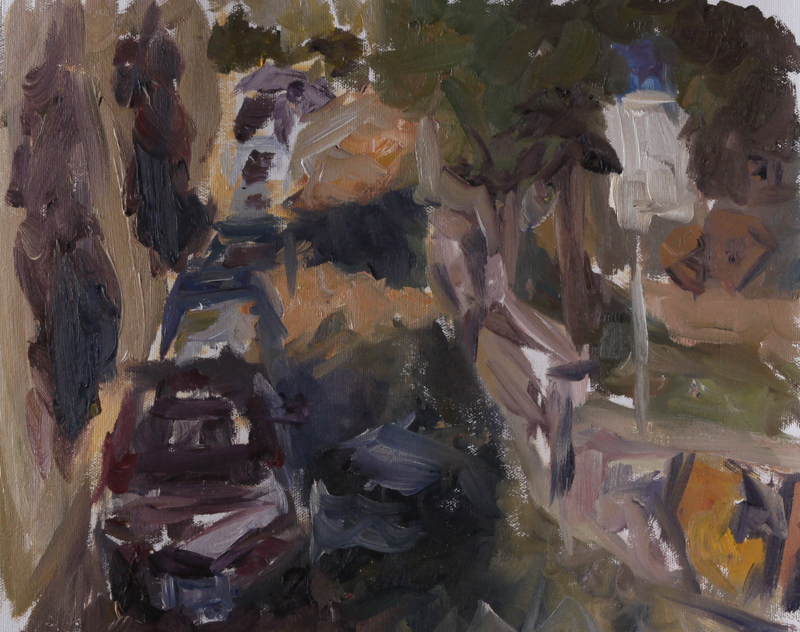 I stopped in front of a landscape painting by Brian Chu and checked out how he dealt with the background. 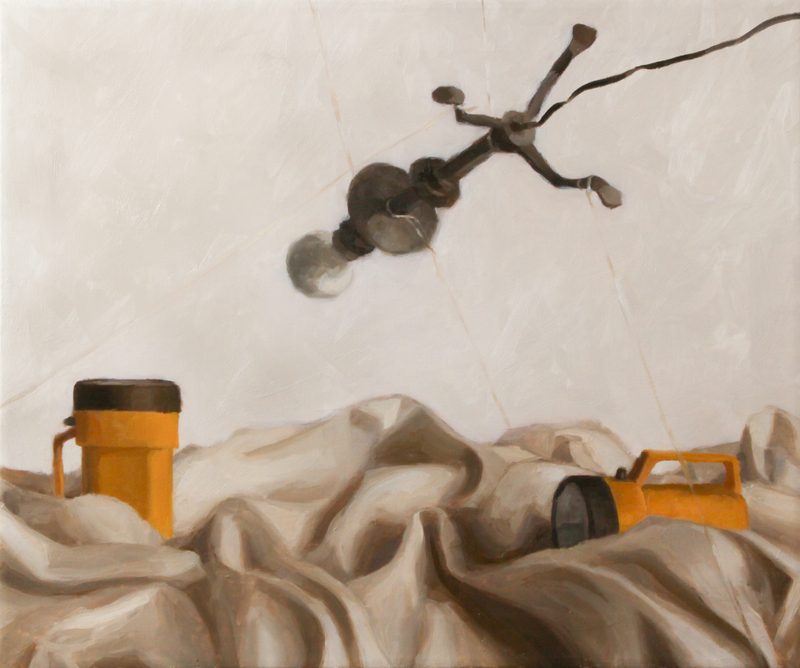 The majority of the painting was clouds and sky and though the clouds were the focus, Brian Chu put an immense amount of effort into the empty sky. It really made me realize the importance of backgrounds. 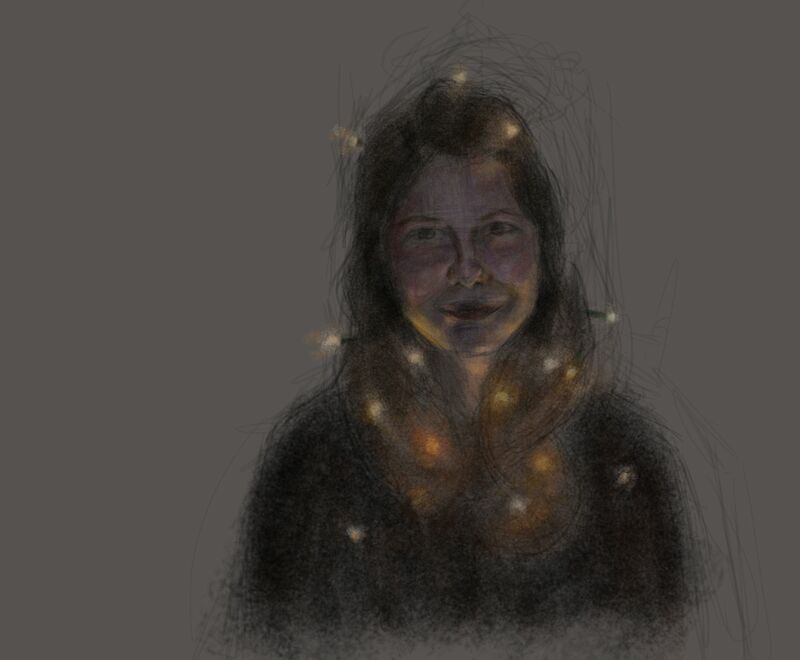 Keeping that in mind, I worked heavily into my background, making sure it helped my lamp pop forward. 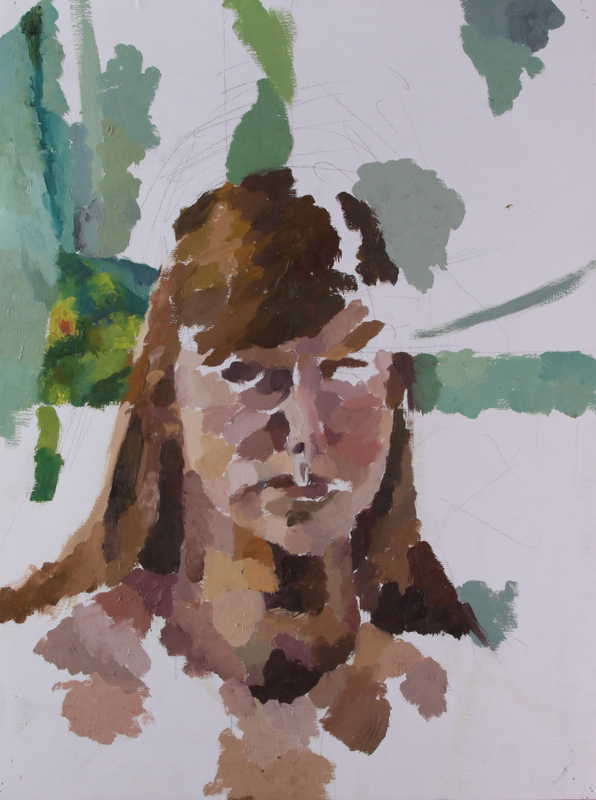 Like usual, I began the painting with large shapes of color and then broke them down. You can see how I distinctly divided the reflections in the gold base. Once I got the lamp base to a point I liked, I scraped it down. This prevented me from overworking it. I then left the painting to dry. Here you can see I focused on the background, smoothing out the large shadow shape and working in some overall darker tones. 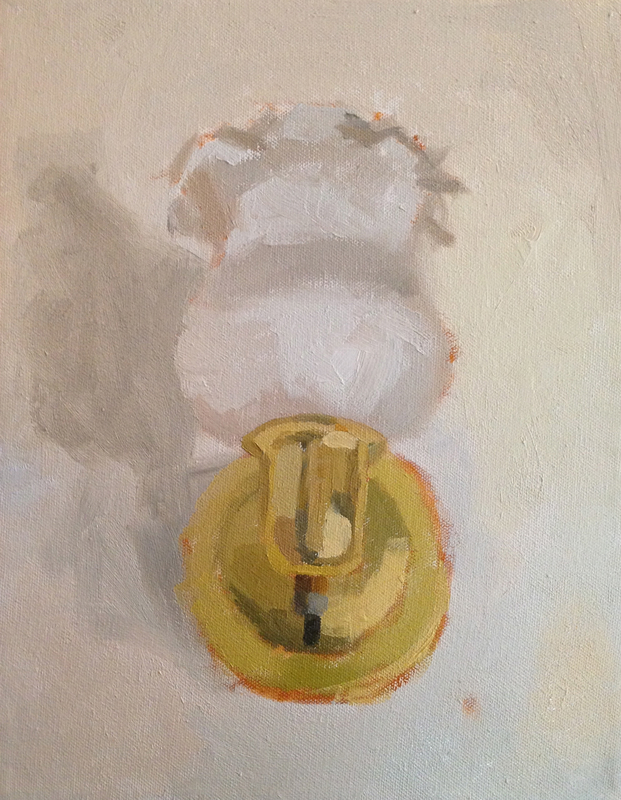 I realized I was painting the wall too light and it needed to be darker in order for the lamp to appear as though it was jutting from the wall. The body of the lamp was difficult to paint. I struggled to make it “turn” in space and appear rounded. The most difficult part was painting the crenelated top. The edges were a balance between darks and highlights and I fought to keep the shadows from getting too dark. I used my palette knife to scrape it down a lot. Throughout the painting I went back and forth between slapping on decisive strokes of paint and smoothing out the transitions between tones. If you compare the above picture with the previous one you can see this seesawing battle take place on the lamp body. By now you’ve probably notice the little winged dot below the lamp. That’s a hole in the wall with flaps of sheetrock. It wasn’t the easiest thing to paint, but I think I got it down okay. It pulls together towards the end. 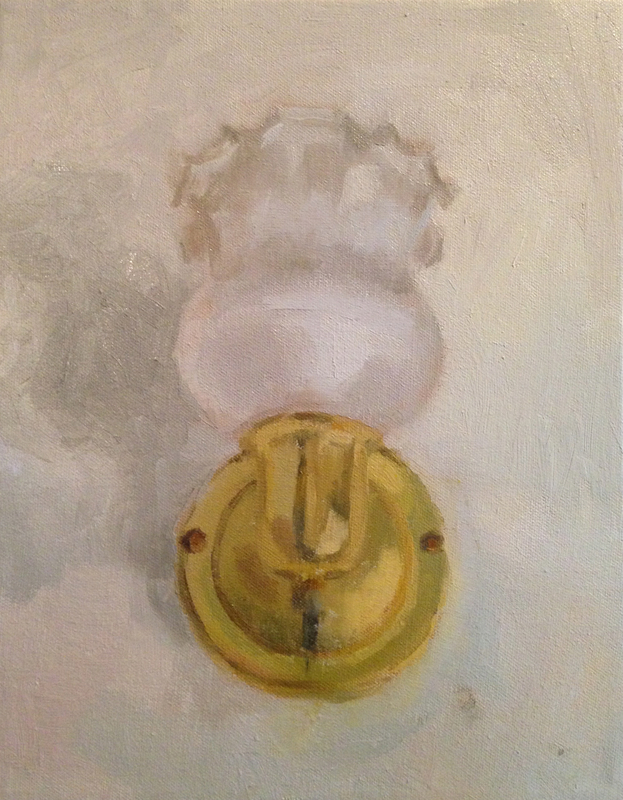 But I included the hole because it gives the painting an extra bit of character. It helps prevent the lamp from just being a lamp. The hole gives the viewer a little more information about where the lamp could possibly be and the physical state of that location. To give the painting more depth I darkened the lamp shadow considerably. 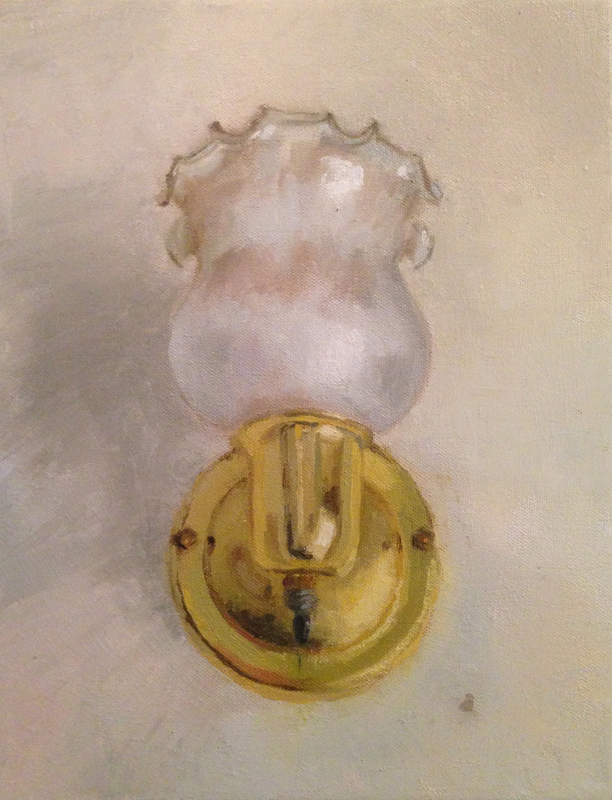 While the lamp base gives off the overall appearance of being gold, I used mostly green and brown to paint it. I would mix the green with a decent amount of white until it was quite light and then I would mix in some brown to give it the yellow color it needed. 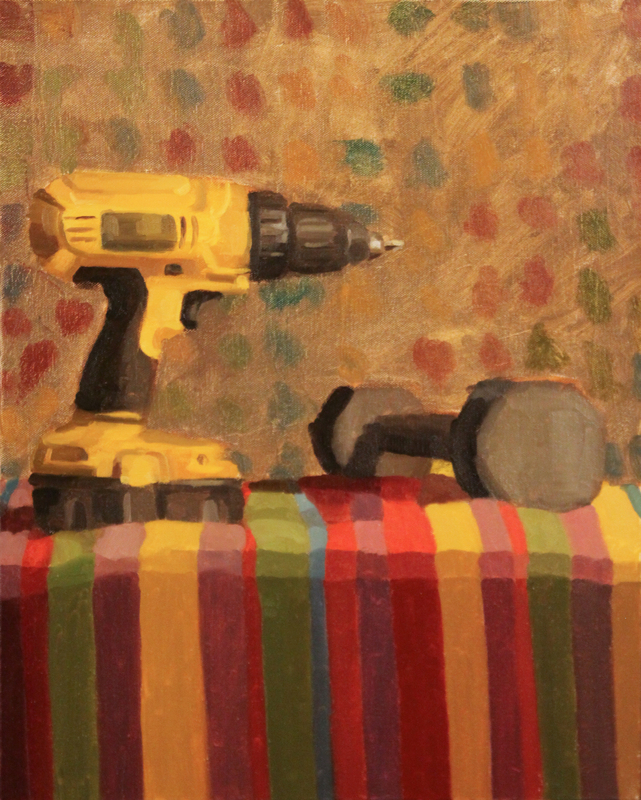 Of course, I used cadmium yellow when this combination could not get me the proper color. Painting the base demanded that I measure and remeasure. The slightest inconsistency or straight edge ruined its roundness and threw the painting askew. 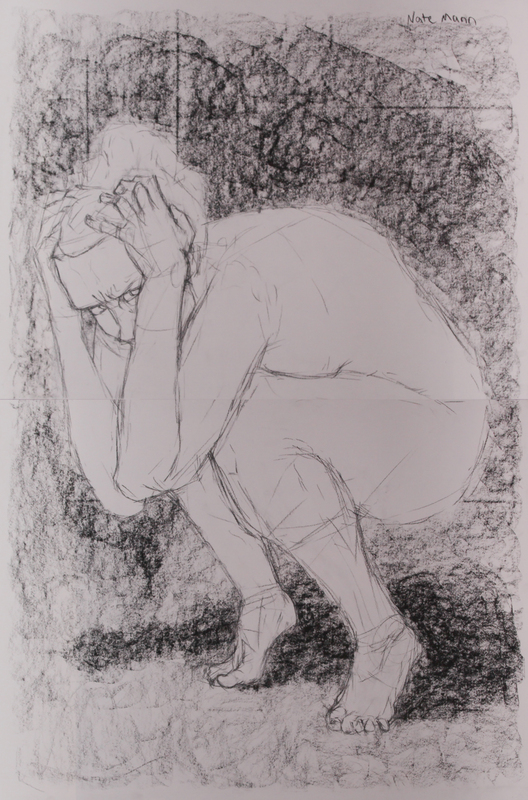 I stepped back often to see where I was going wrong and where I needed to make adjustments. Here you can see I added white to the right side of the hole and that helped sell the idea that the sheetrock was being pulled off and away. Also, I’d like to mention here how much I like the reflected yellow light right above the hole. For some reason I got so happy when my eye caught that detail and I joyfully included it in the painting. It does a good job of demonstrating the reflectivity of the lamp base. And done! I think. While writing this post I noticed a few things I’d like to fix, but I probably won’t go back and adjust them. I’m ready to move on. And now as I stare at it, it’s starting to look wobbly and funny. Oh dear. I don’t often name my paintings, but I thought of one for this painting while I was working on it. I think I’ll call it View from the Toilet. Cause after all, that’s what it really is. I would like to talk about what I’ve done. 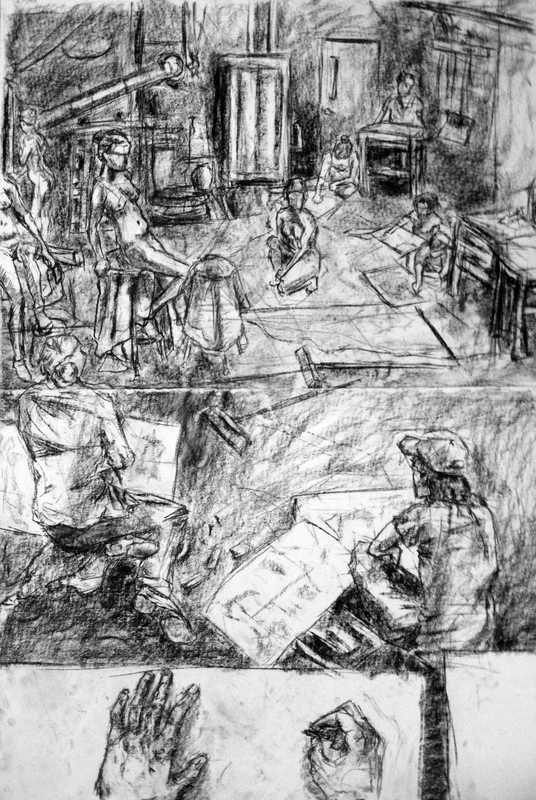 In 2009 I took my first college drawing class as a business student. 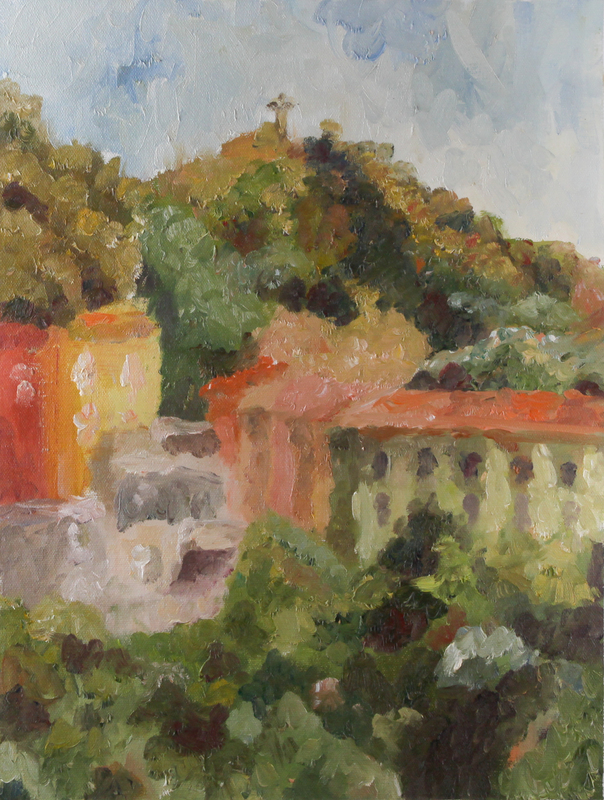 In 2012 I went to Italy to study painting. 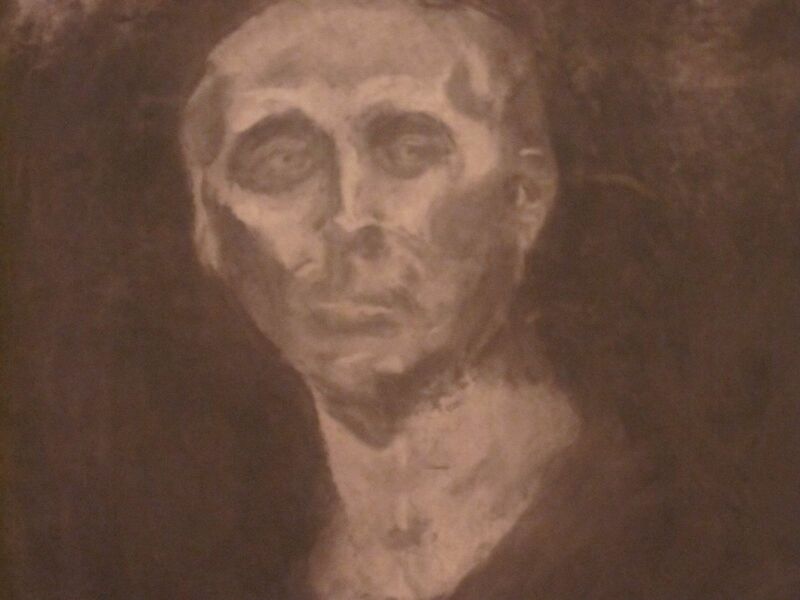 In 2013 I graduated with a degree in art. Not business. Now 2015 is a couple months away and all I do is art. It’s my free time. It’s my work time. 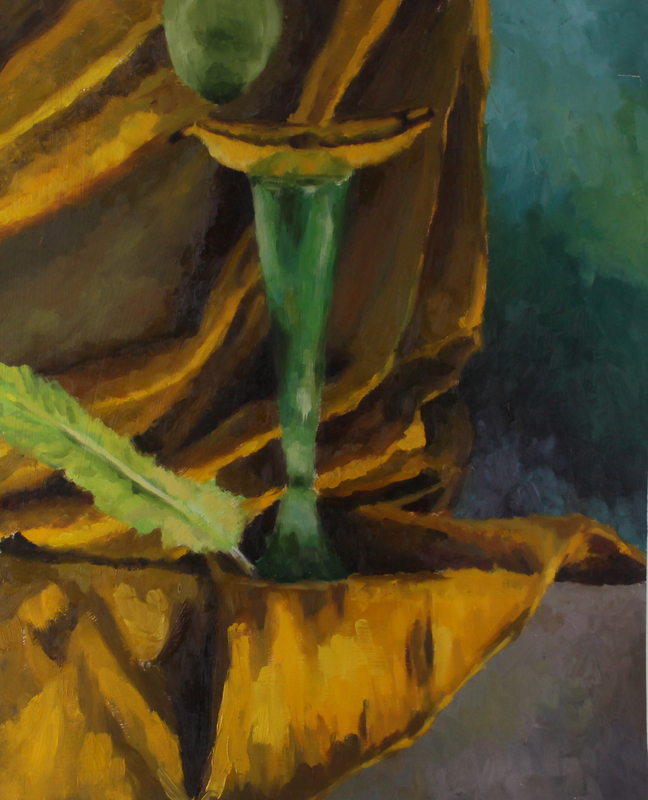 Though I am pursuing a Master’s for English teaching, I include art in every project I do. It’s an obsession. In a few short years I’ve changed dramatically. I’m going to explore those years. I’m gonna show you all the art I’ve created since I took that first drawing class. First, let’s look at my most recent painting. There may be a few of you that don’t want to look through all the photos in this post. I understand that. So I’ll plop the goods down first. 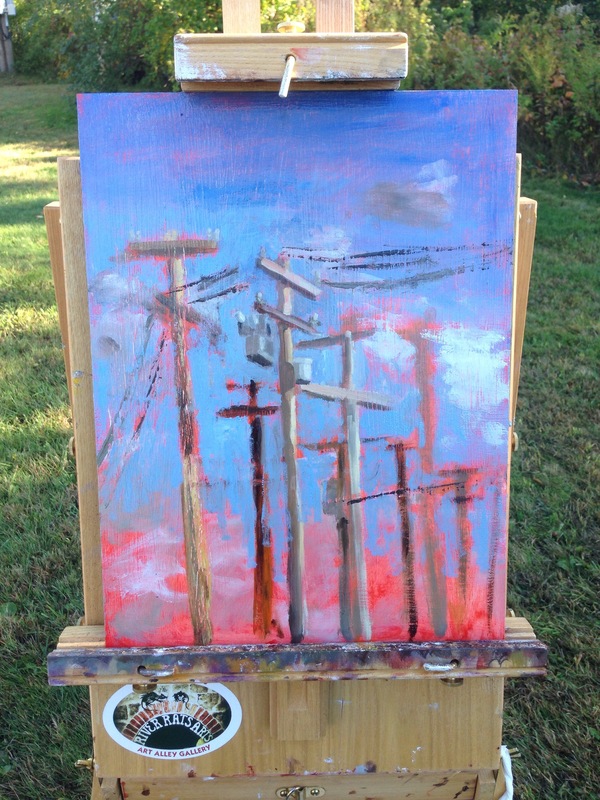 My girlfriend and I were walking towards the entrance to the campus nature trails and we passed by a cluster of telephone poles. 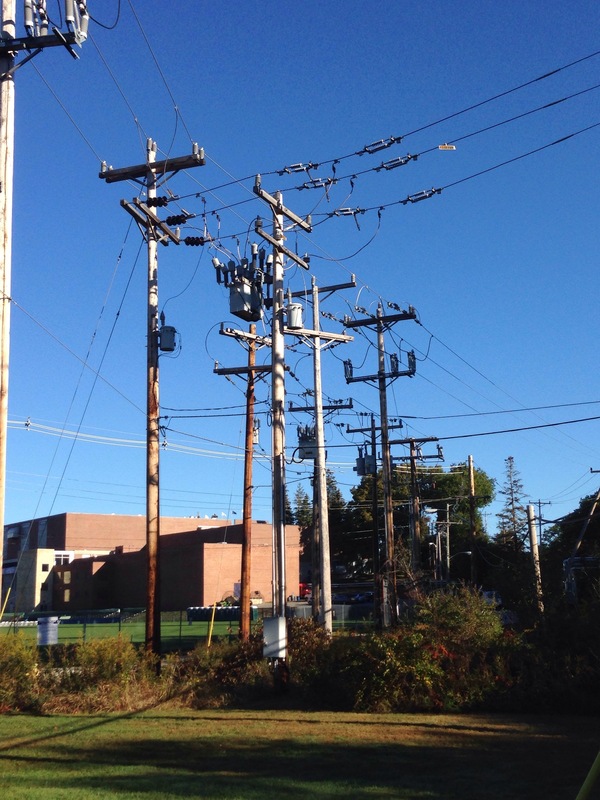 You would think there’s nothing special about telephone poles, right? To me there was a spark. I had a moment. I froze, let go of my girlfriend’s hand, and shaded my eyes from the afternoon sun. 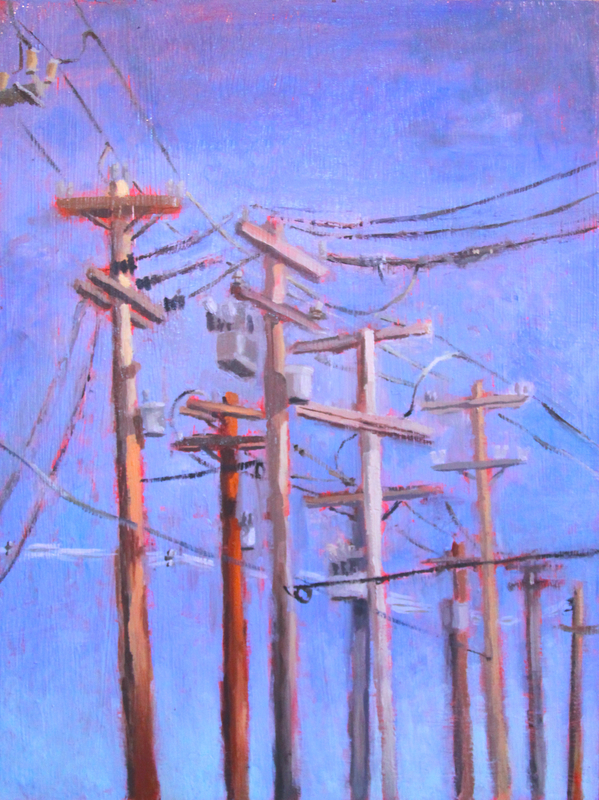 Telephone poles. Lines of cabling. 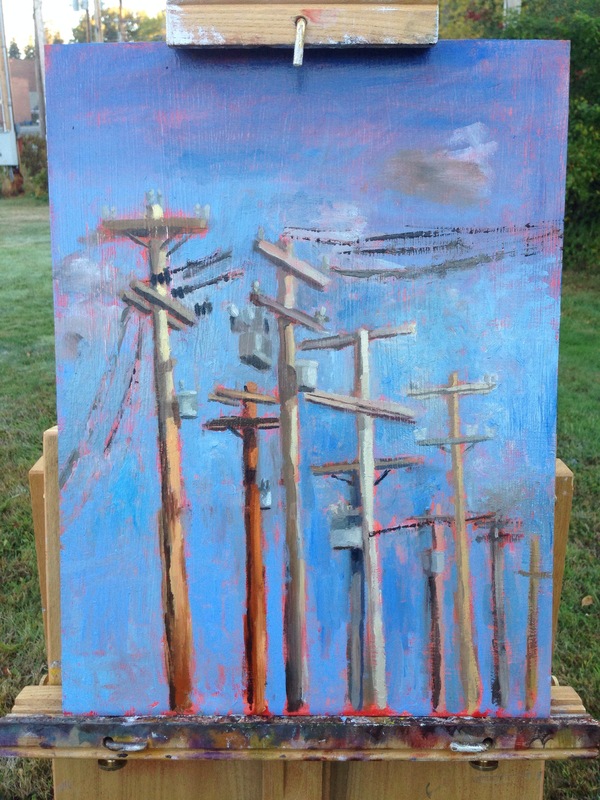 Telephone poles. 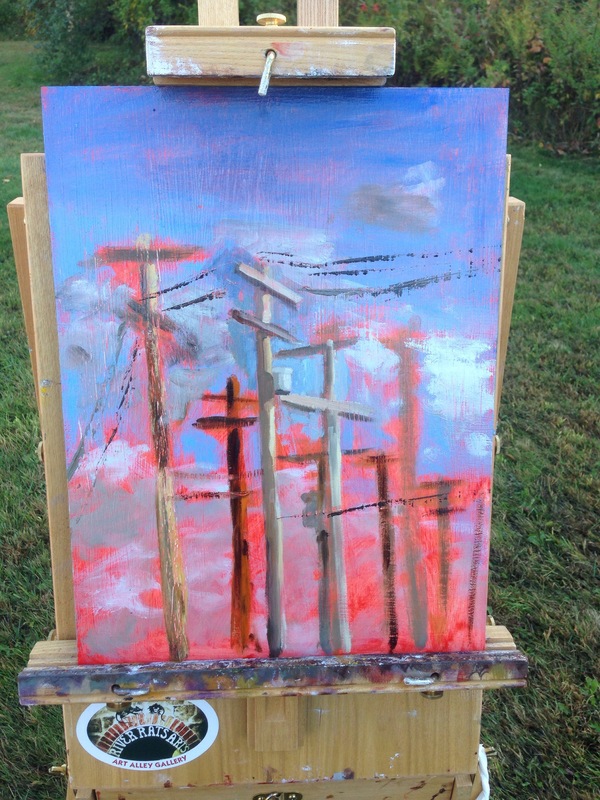 They were beautiful telephone poles. They were bristling porcupine quills. They were toothpicks jammed haphazardly into a block of cheese. They were perfect. I needed to paint them. I used my hands to square-off the composition and I made my decision. I was coming back in the morning with my easel. I kept my promise. I surprised myself and slunk outta bed with the 6am alarm. I stood and leaned on the wall. BRRWING. My backup alarm. I always set two or three. Time to get ready. Undershirt, then a T-shirt, then sweater, and finally a jacket. And pants. I dressed myself with determination. I was going to paint but I was not going to be cold. I wanted to be prepared. I got to my spot around 7:30 and started painting at 8. 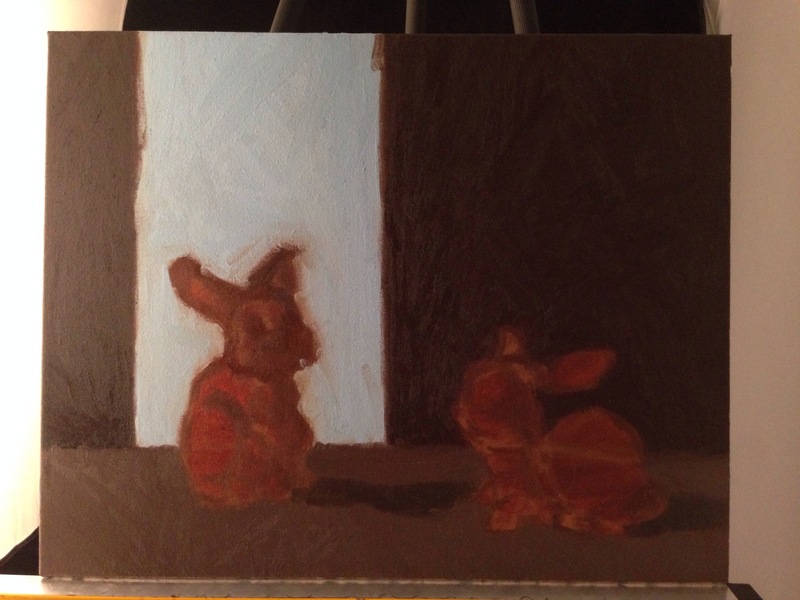 The night before I’d gessoed and toned the board with cadmium red. 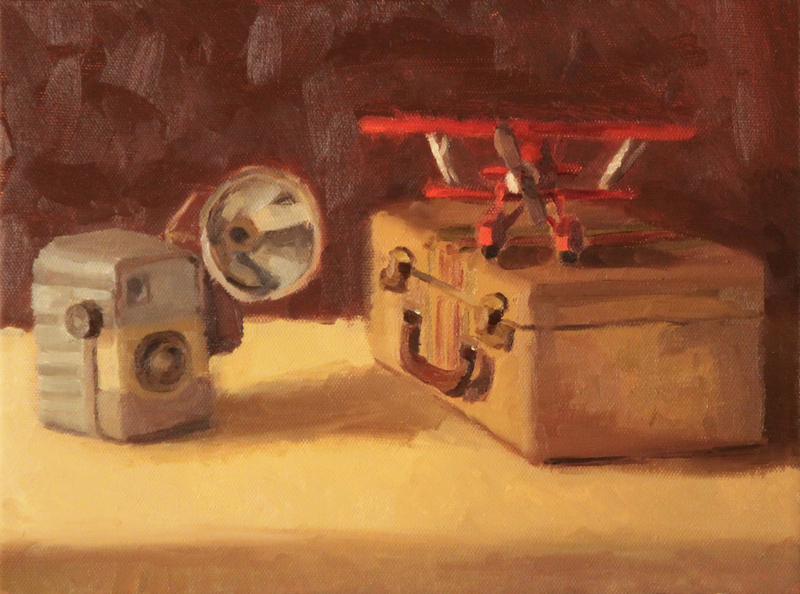 Some plein air artists paint on a red ground in order to capture an underlying warmth. Not sure if I needed the warmth in this painting but the red contrasted nicely with the blues of the sky. When I started there was a field of dense clouds hanging low in the sky. I wanted to capture them in my painting, so I put down some grays on the board. That didn’t last long.The clouds dissipated and never returned, making me replace the grays with blues. I found that all the poles and lines helped me measure relationships easily. There were plenty of reference points for me to work from. I could place a telephone pole on the board and then realize it needed to move down and over just by looking at its proximity to the other poles. I had a lot of fun playing with saturation in this painting. Some of the poles were very washed out, while others were strong with color. 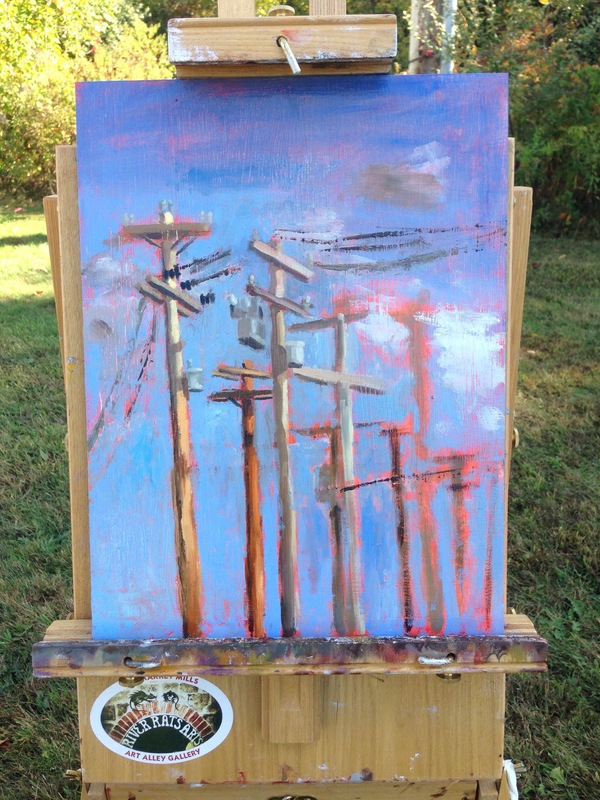 I enjoyed painting the brown pole in the background because it contrasted with the white poles in the foreground. After about four hours standing in the cold I decided to call it a day. 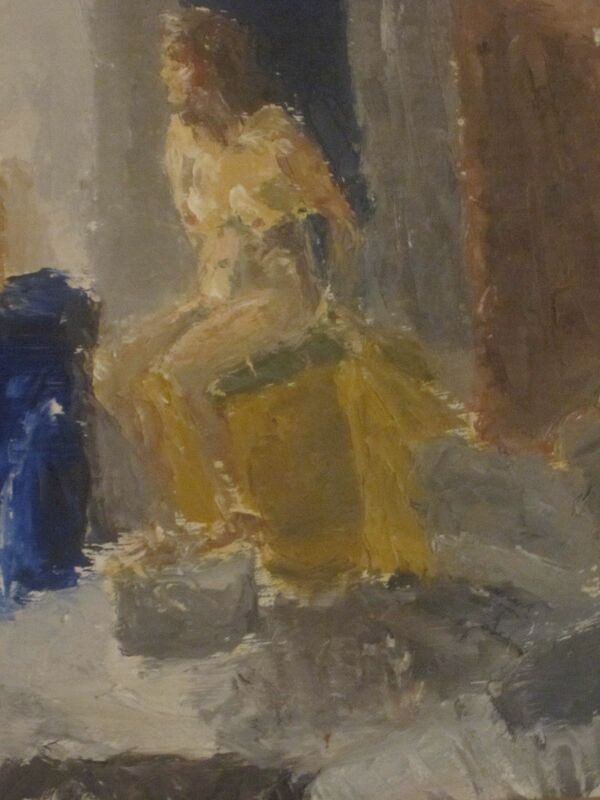 That night I took a hard look at the painting and realized it needed more. I got up again the next morning and went back. 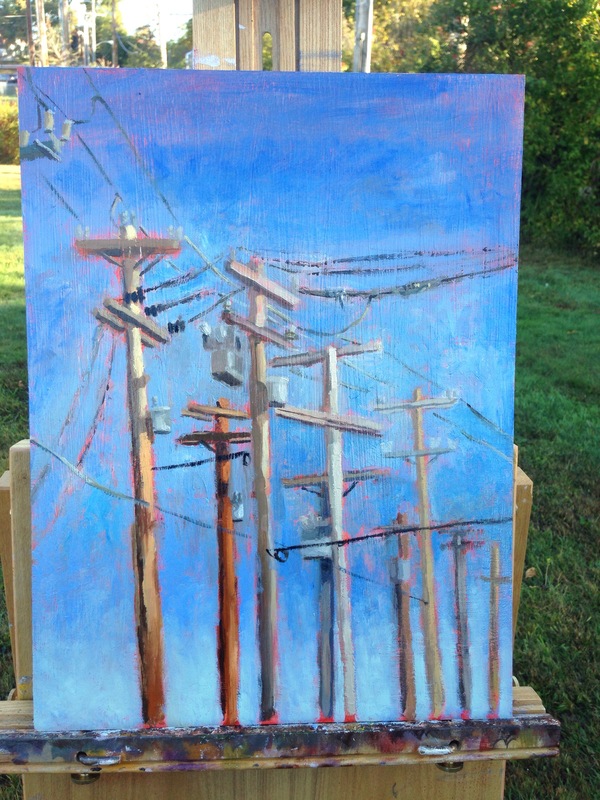 I gave the painting some more depth by adding a hint of another telephone pole in the top left. Then I added some of the lines and cabling. Not all of them though. I did not want it to become too cluttered. I’m very happy with the final result. I wish I could have painted the clouds in the background, but I’m not too down about that. Here you can see my setup. The card table was from my car. I was able to park close enough to walk it over. I found it quite handy. I’m going to need to invest in a different easel that makes it easier to hold a palette and all my accessories. I’m not a big fan of the way my current one works. But that’s not a pressing issue. 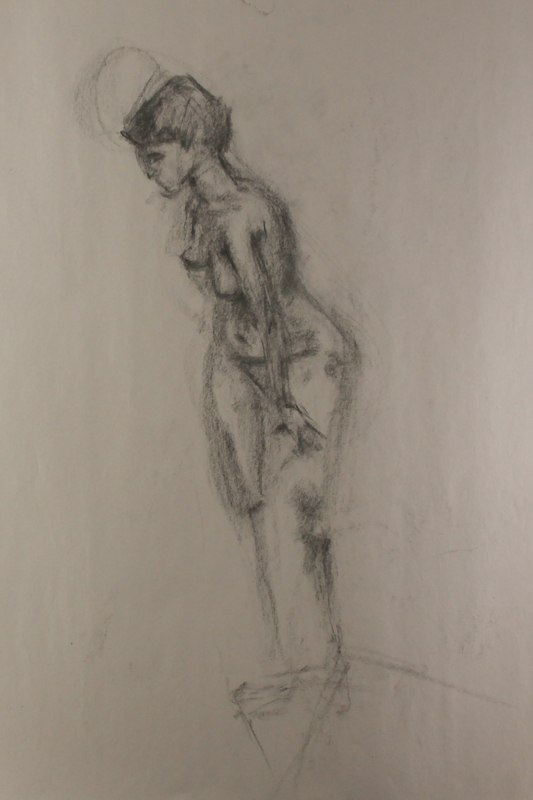 Over the summer I photographed almost all of my drawings and paintings. I opened boxes and dug through portfolio bags. I managed to find about 90% of my work. At the time, I planned to post a blog write up immediately, but that didn’t happen. I got sidetracked by life, work, and summer fun. Now that I’m back at school I have a lot more focus. Thus, I’ve finally managed to put together all the photos. Hopefully this chronological look through all my pieces will show how much work it takes to earn each inch of progress. My first semester of college, Fall 2009, was planned out for me. The business school told me what classes to take and where to go. Second semester I had more freedom. I looked at my requirements, realized I needed an art elective, and signed up for Intro to Drawing. My professor was Gregory Poulin. At that time he was a second year MFA student, but I did not realize that until three quarters of the way through the semester. It was my first art class. 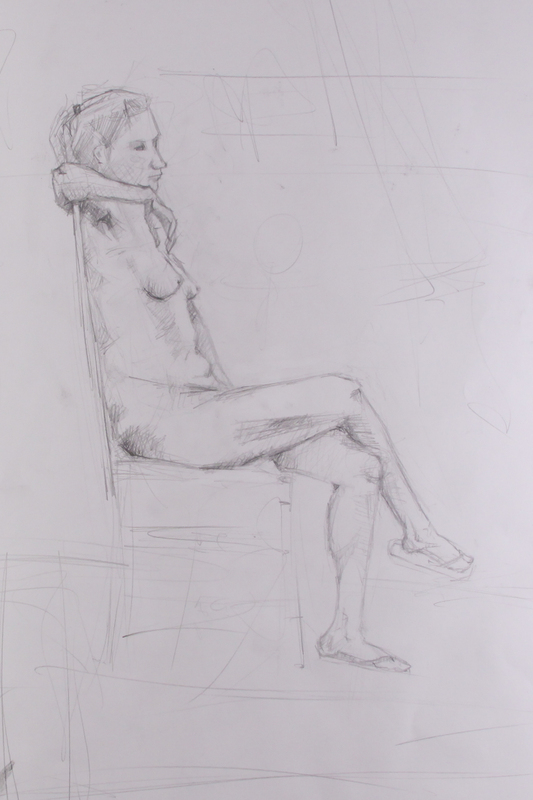 I thought all the art classes were taught by full time professors. I didn’t quite grasp the whole college teaching dynamic yet. Because of this, I’ve always pictured and remembered Poulin as an older authoritative figure, older than he probably was. Earlier I mentioned that I was only able to find and photograph 90% of my work. 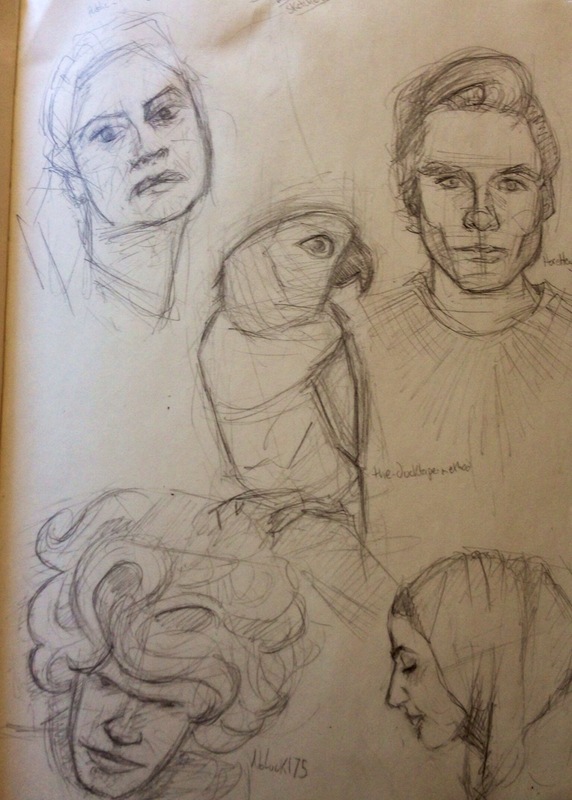 The missing 10% is mostly work from Intro to Drawing. Thankfully, I do still have a few drawings to show. 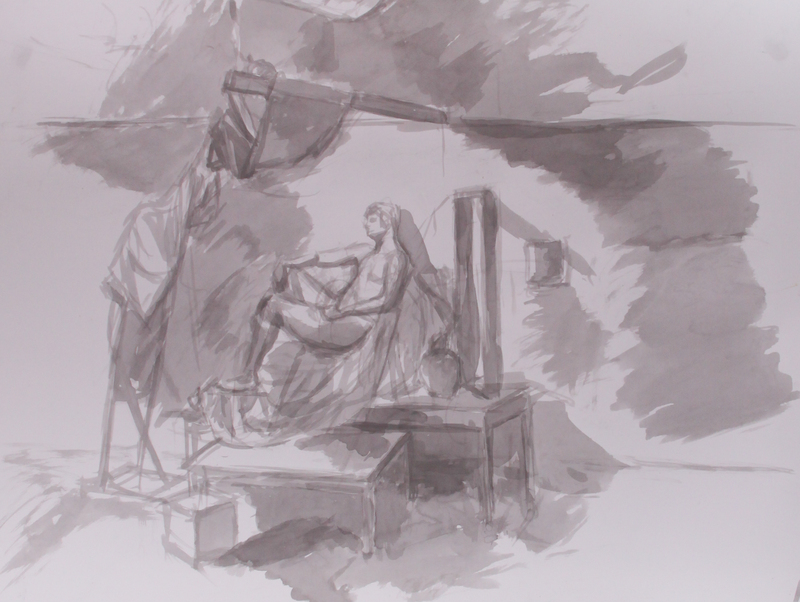 During the first few sessions of class, Poulin had us draw still life objects. Nothing too fancy. Things like boxes and strings. Then he added cylinders and balls. Which led to this drawing. I was still experimenting with different drawing tools at the time, so I don’t remember what I used for this. 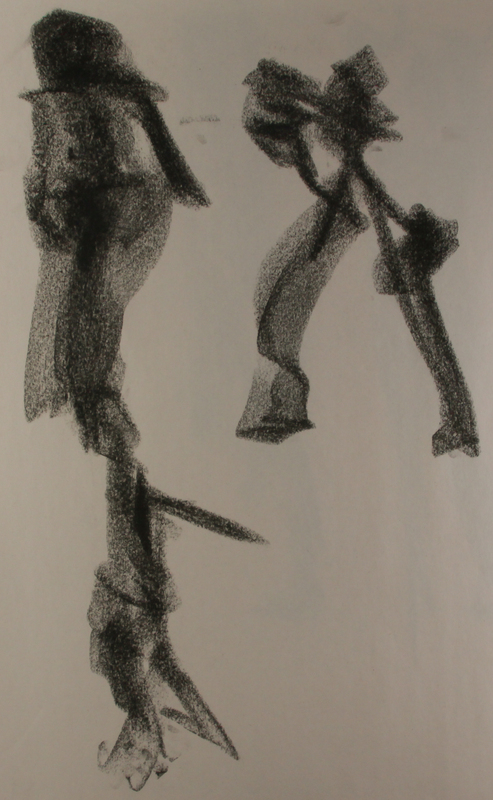 However, it looks like a vine charcoal drawing. I dig the softness. That’s a quality I should try to bring into my present work. 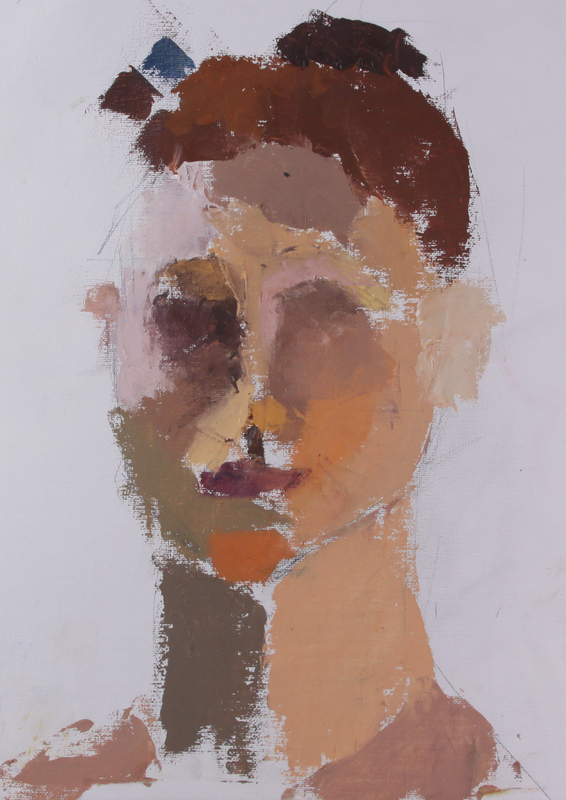 Once we’d conquered the first few still-lifes, Poulin brought out the sculptures and busts. 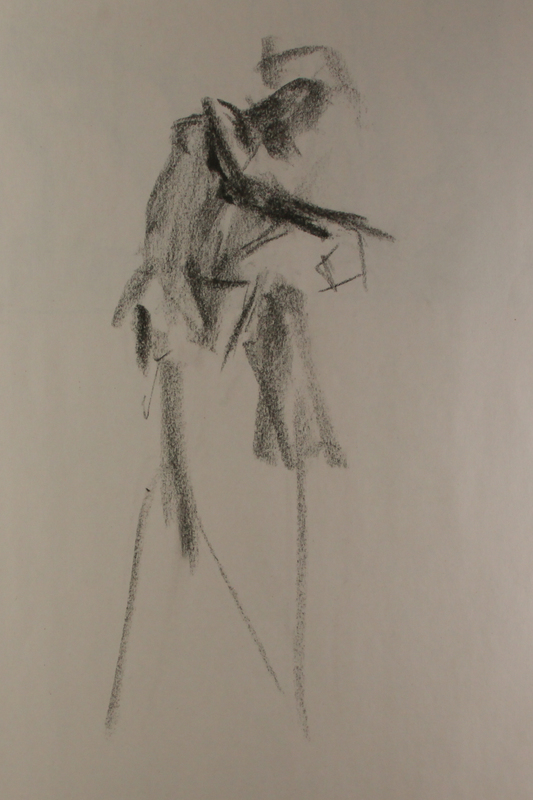 He also introduced us to drapery. That was a huge leap. There’s quite a difference between boxes and drapery. My first few attempts weren’t absolutely successful. I remember getting sucked into rendering all the folds and intricacies of the fabric. 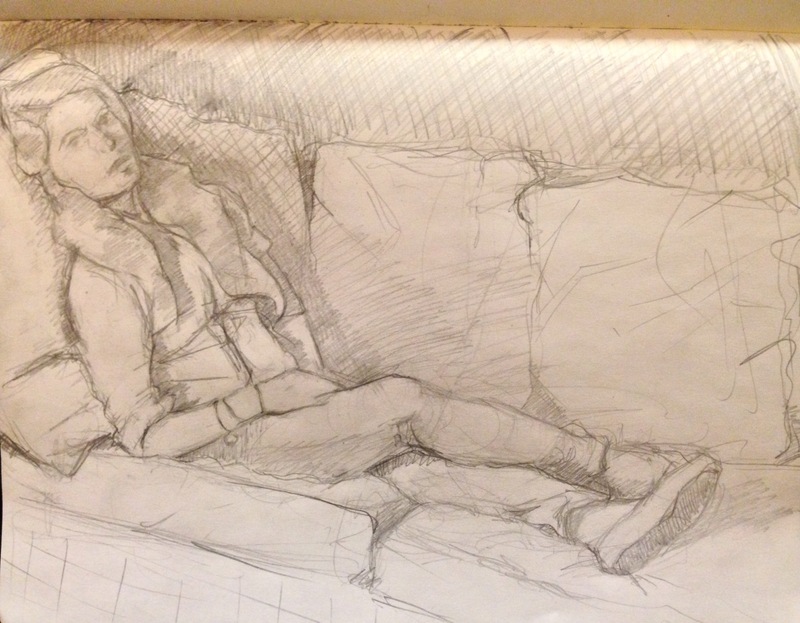 Eventually I got comfortable and began worrying less about detail. 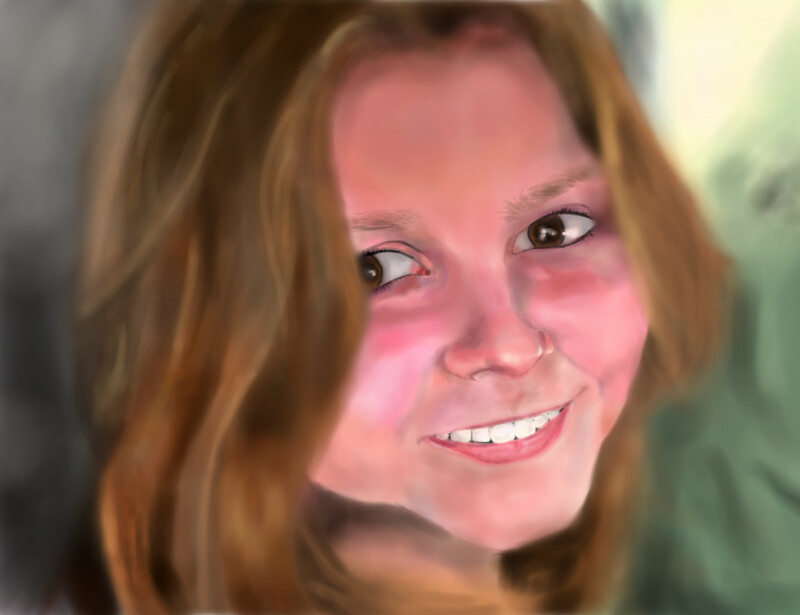 This was one of my first attempts at rendering a human face. It looks funky now, and I’ll admit it’s not the greatest drawing, but I did the bust a kind of justice. It truly did have a bony, planar structure. I think I conveyed that aspect well. 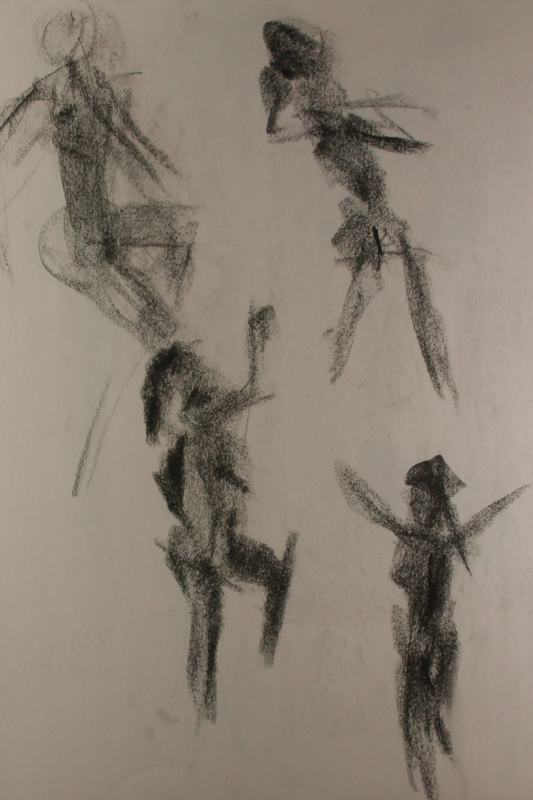 When we finally got to the figure, we started off with 30 second gesture drawings. 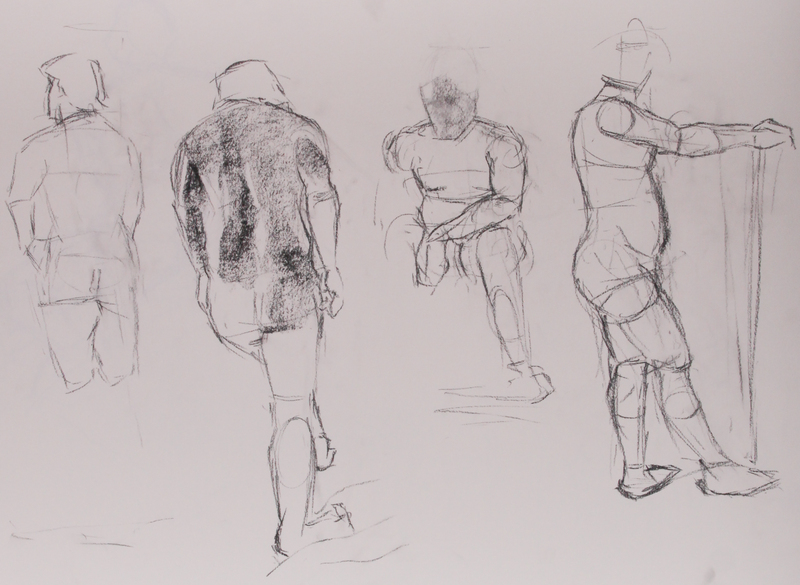 Then we progressed to 1 minute gestures. Then 2 minutes. Then 5 minutes. 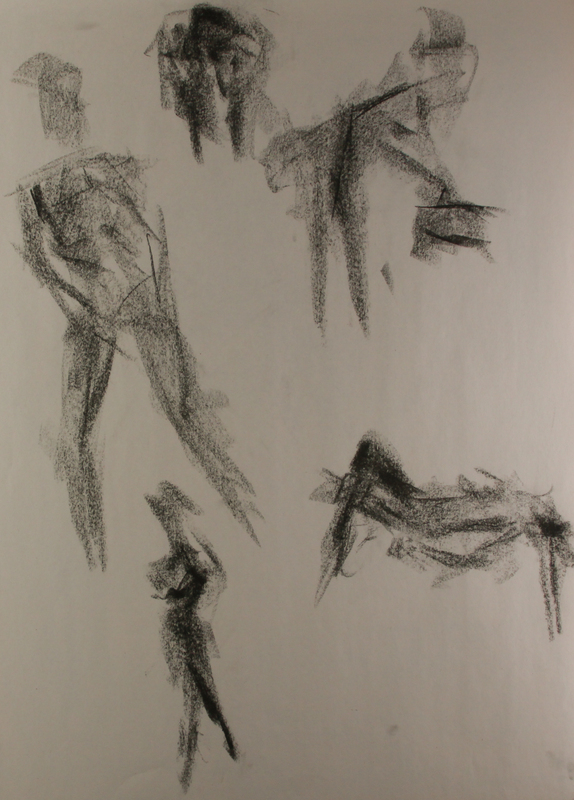 We did gesture drawings for the first couple classes we had a model. They were necessary exercises. They still are necessary exercises. They help to loosen the arm and develop a flow. Personally, they prevent me from diving straight into a drawing and getting concentrated on details. 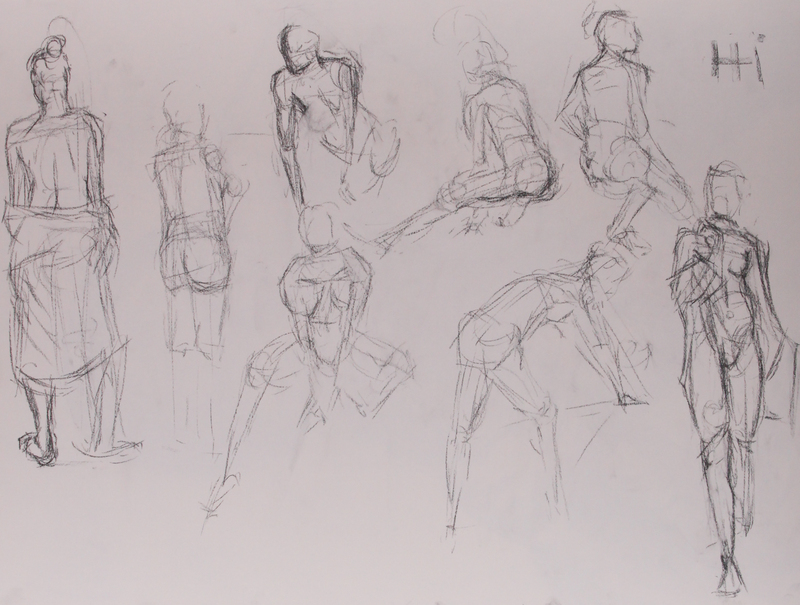 While I don’t have any examples of gesture drawings from this class, I do have examples from later classes if you’d like to skip ahead and look at them. 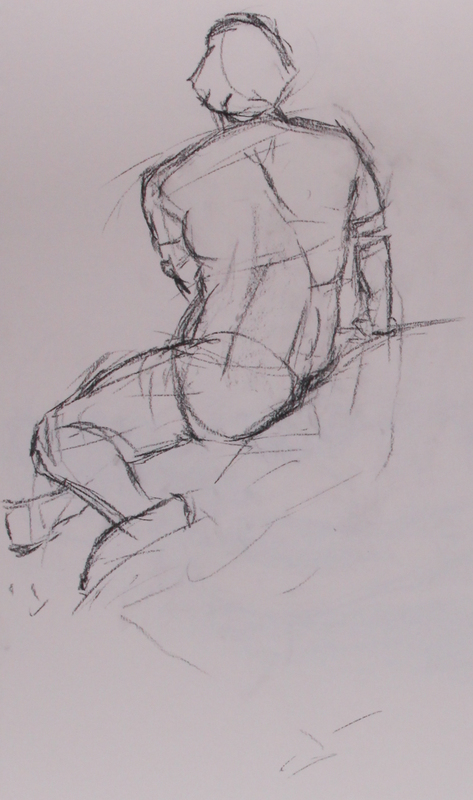 Once I got into full length figure drawings, I fell in love with drawing. I began contemplating changing my major. 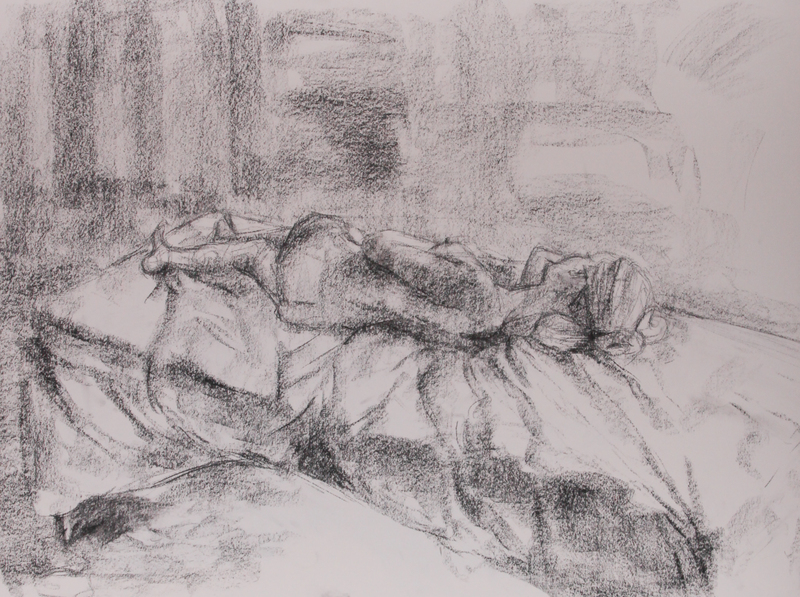 In the above drawing, I started off too dark and the newsprint paper was not forgiving. 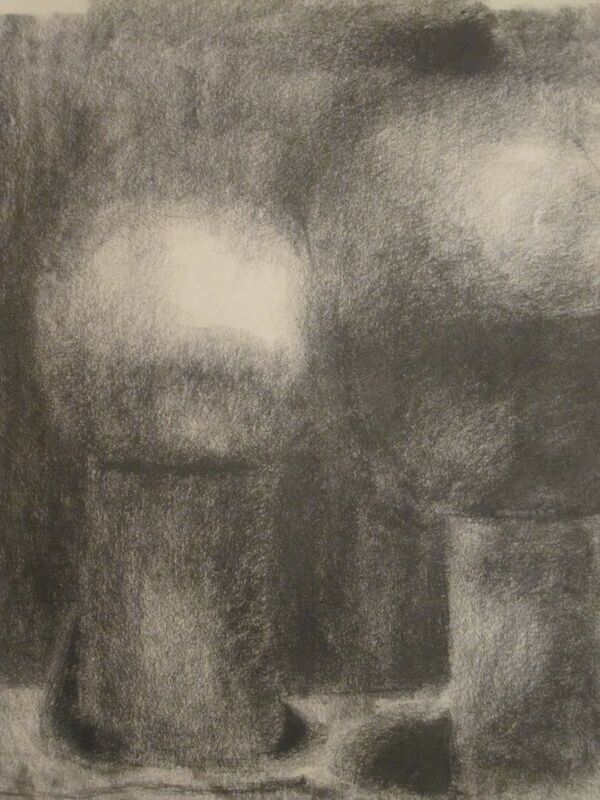 I was able to pull some mid-tones out with an eraser, but I lost the ability to establish lights. Still, I like the way it looks. I don’t often go very dark in my current works. Looking at this now makes me want to try a drawing of mostly darks. One of the quicker drawings here. 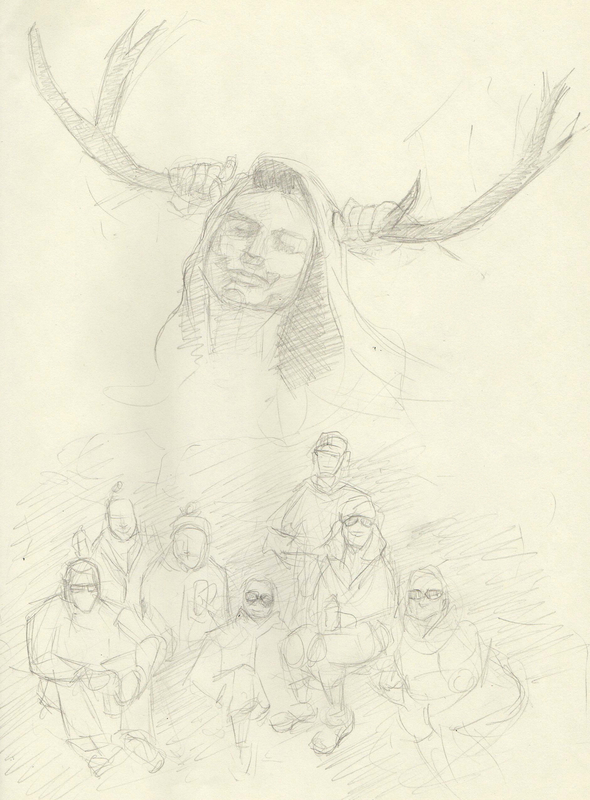 Probably a 2-5 minute sketch. 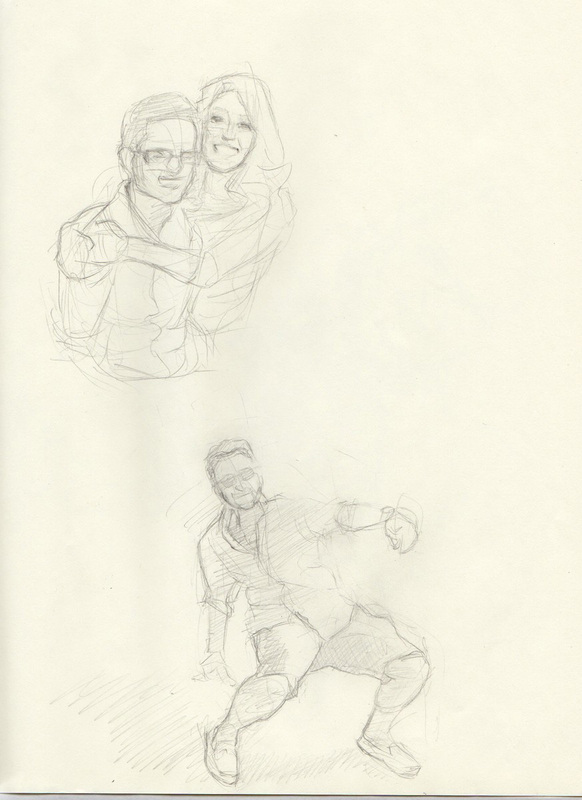 Not a completely hurried gesture, though. 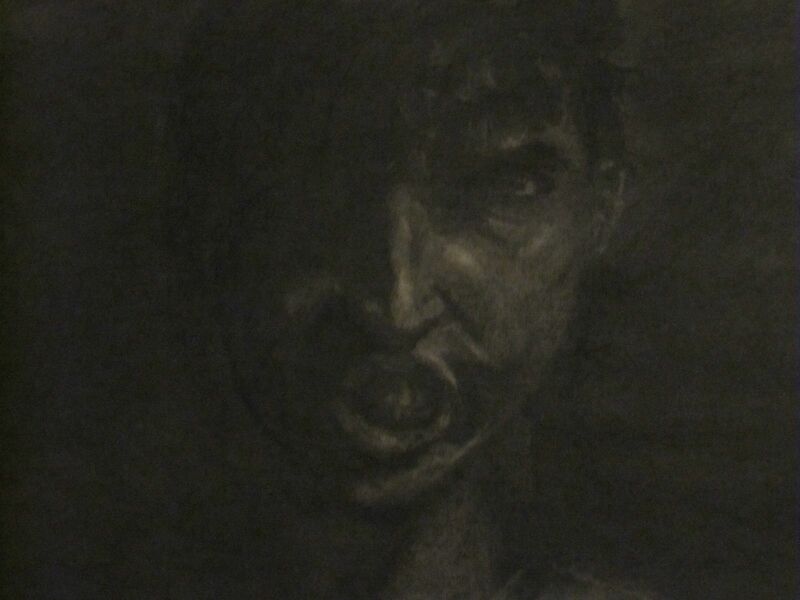 Once again, I was playing with darks in this drawing. And playing with my materials too. 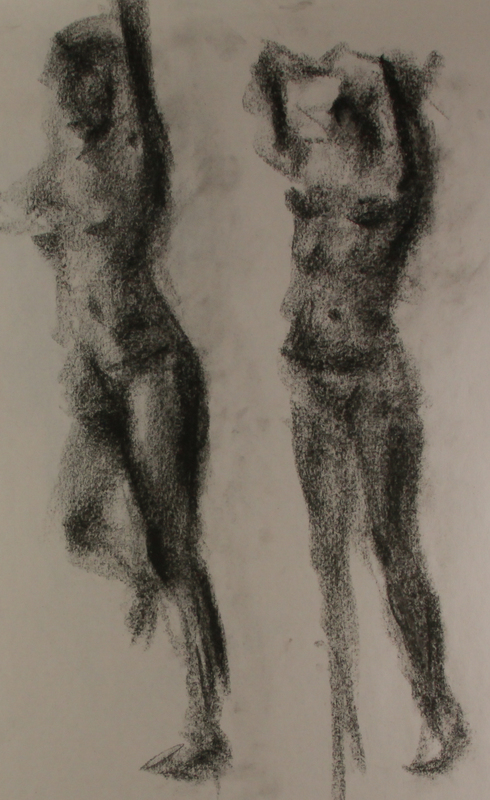 I think it was in this class I developed a love/hate relationship with charcoal. 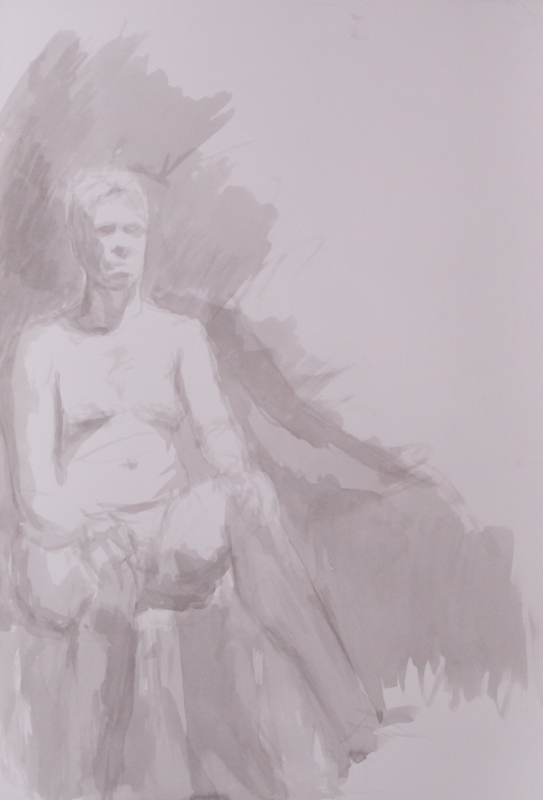 It can be used to make tender drawings, but I tend to press too heavily and create darks that need to be lightened but cannot be worked into. Here you can see the softness and tenderness I was talking about. 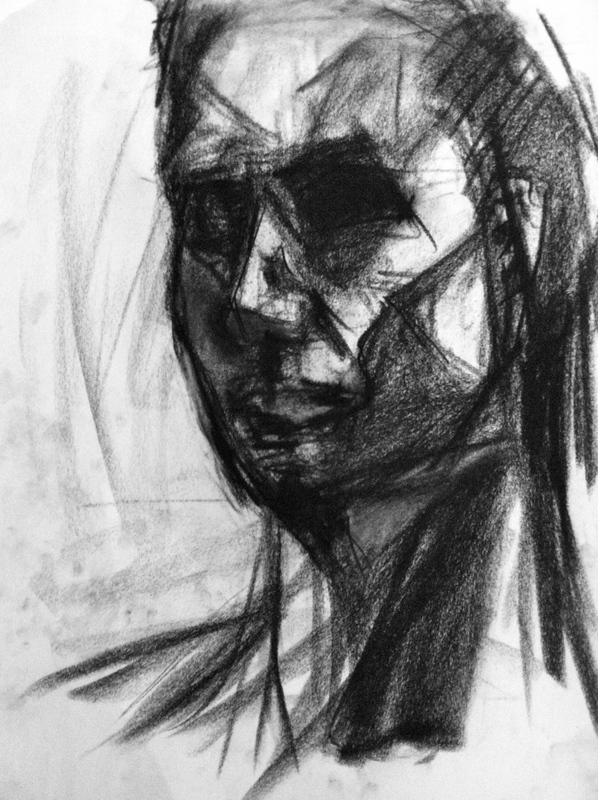 I enjoy looking at the face because it shows I was starting to think about the upper lip, under the nose, and the eye sockets as solid block shadows. 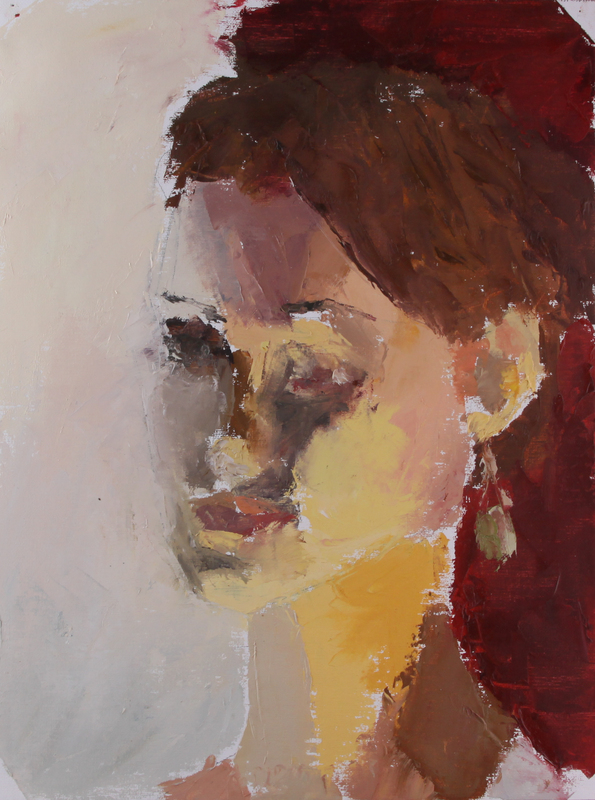 Those are important things to recognize for portraiture. We had a homework assignment every week. 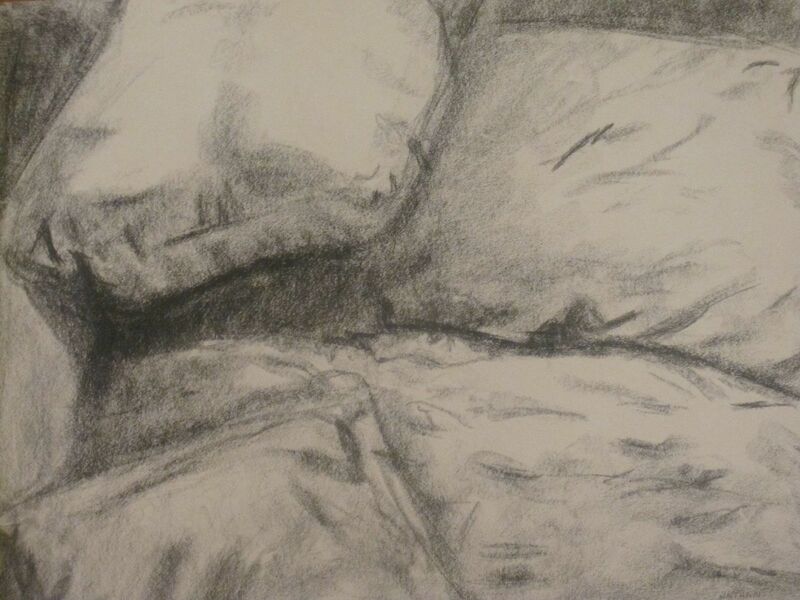 I believe this assignment was focused on cloth and pillows. 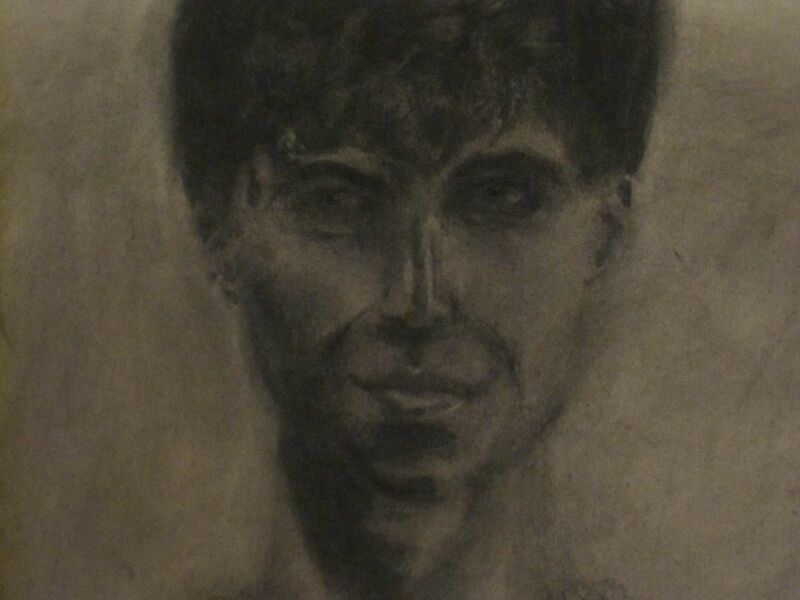 This drawing scares me when I take quick glances at it. The folded up blanket in the background reminds me of a squished brain or folds of intestines. 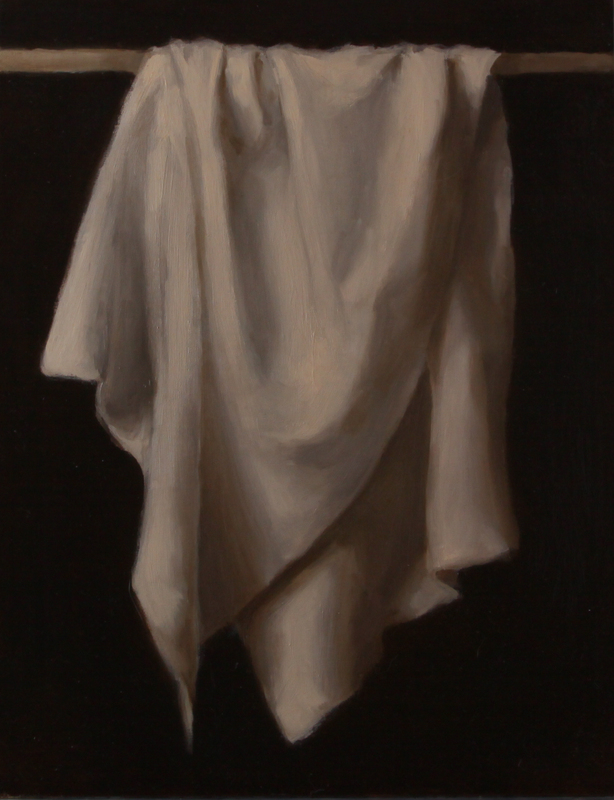 I don’t think my rendering of the cloth came out the way I intended it to. My freshman year was a rough adjustment. I spent a lot of weekends at home. I made a few friends, but everyone on my dorm floor was exactly opposite of me personality wise. Therefore, when I realized I could go home for summer vacation early, I went. Because I’d had in-class finals and papers already, I didn’t have to stick around. 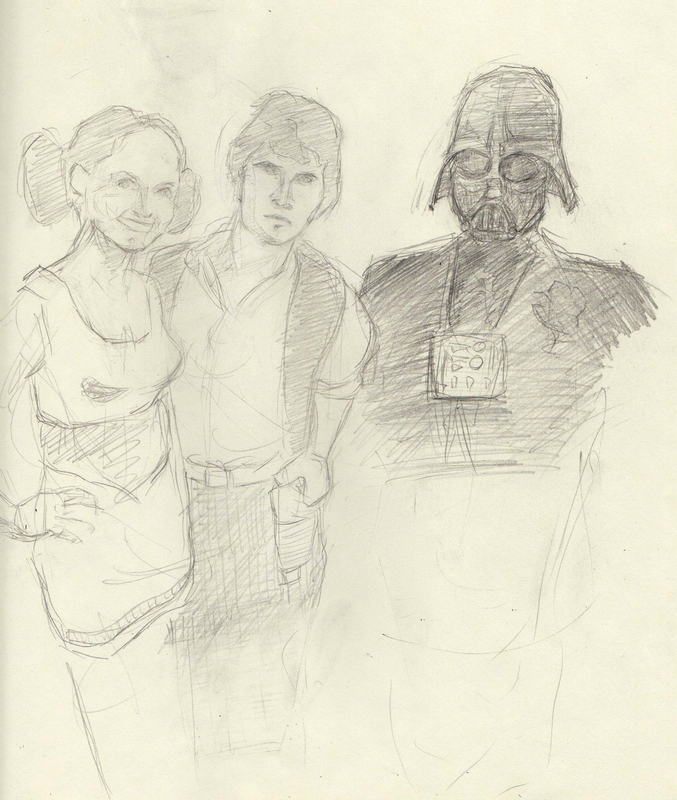 But, problematically, I did have to turn in my Intro to Drawing Project during finals week. I worked on the project at home and drove it back to UNH for the critique. 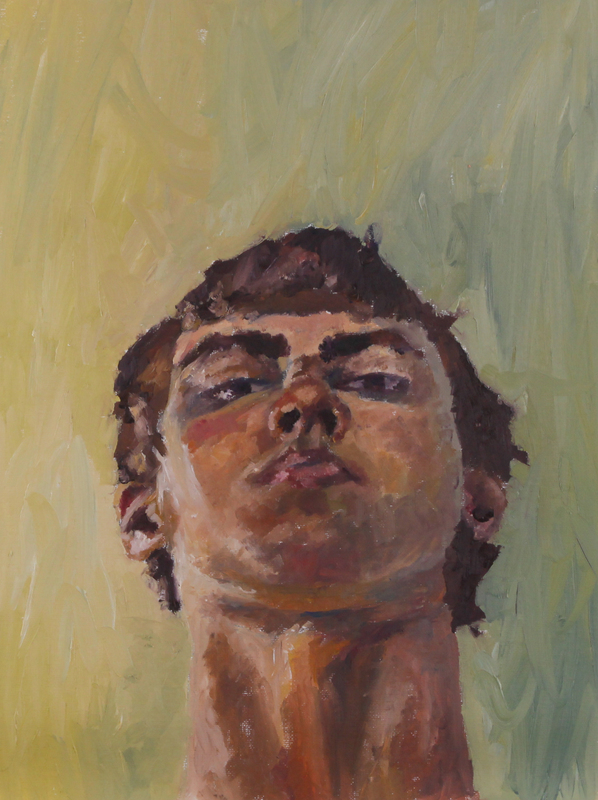 Poulin didn’t seem too impressed with the self-portraits and preferred to talk about my in-class work. I don’t blame him. 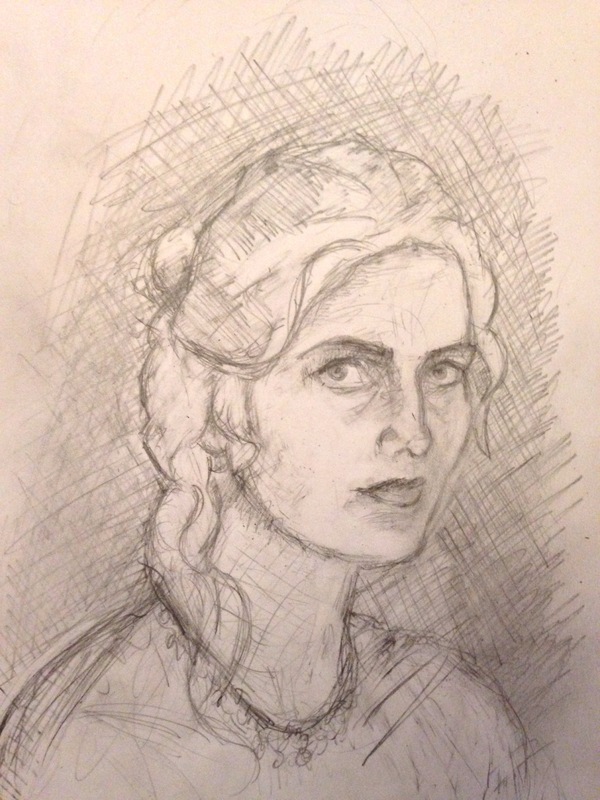 I feel like I way overworked the portraits. They only slightly resemble me. I much prefer the softness of some of the other pieces. I’m sure that’s what Poulin was thinking as well. 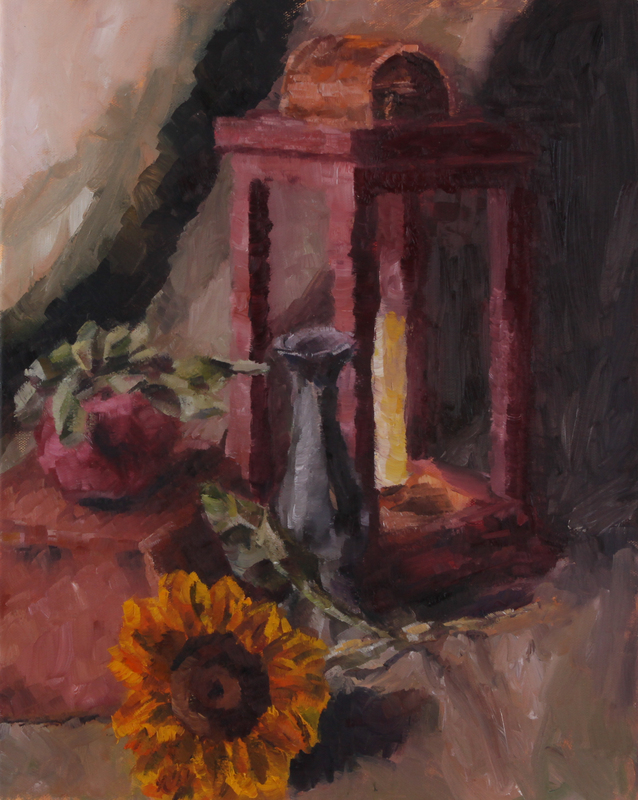 Before the summer started, I signed up for Intro to Painting for the following fall semester. Knowing I’d be stepping into the world of painting, I decided to work in some experience with the medium. 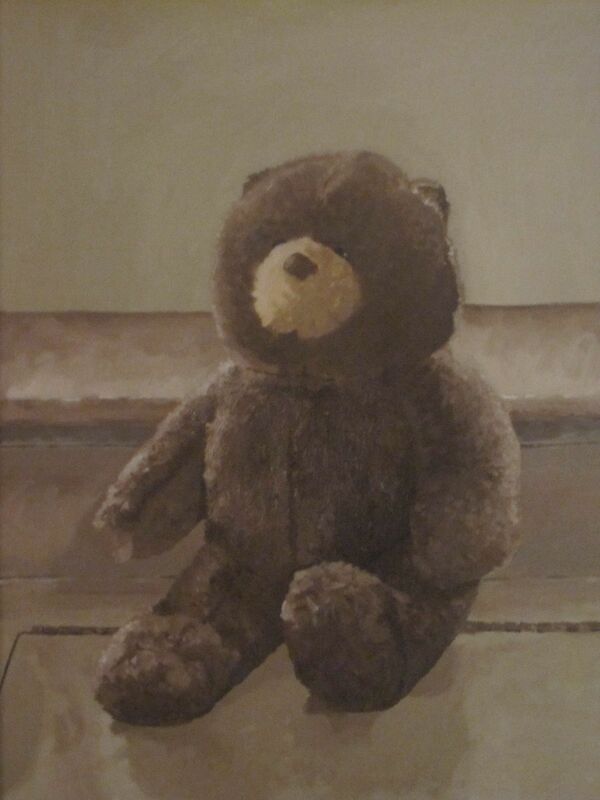 Over the summer I borrowed oil paints from my mother and painted one of my childhood teddy bears. I did the whole thing with brushes and then, to get the texture of the bear’s coat, I used a toothpick to create wisps of paint all over its body. Except for the head. It was such a tiring technique that I abandoned the painting at the head. I like the end result, but I think it could use a little more variety in color. Also the background needs more depth. Not bad for a first painting, though. I think. Over the summer, I gained a lot of self-confidence. I took it firmly into my Sophomore year. I realized how much of a struggle the previous year had been and I did not want to repeat that. I marched into my new dorm and introduced myself to everyone immediately. It paid off. I’m still great friends with most of those people. 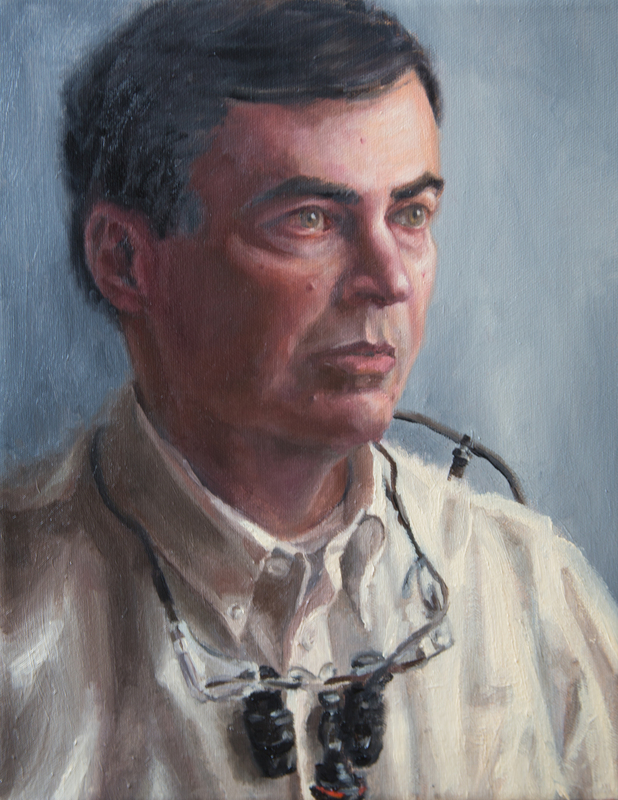 My Intro to Painting professor was Craig Hood. He’s an excellent teacher who looks exactly like an old world artist. It’s his goatee. And the paint splattered smock. 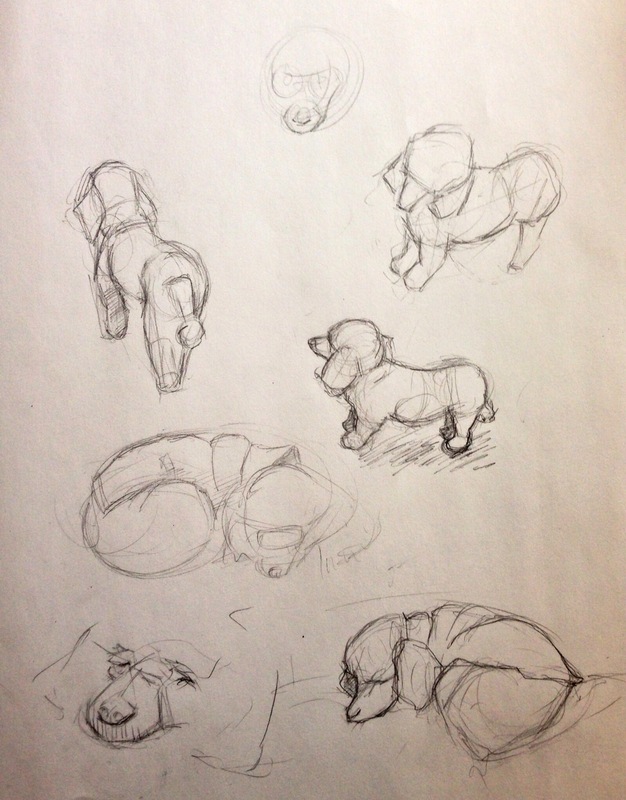 Just like Intro to Drawing, we started off with basic still-lifes. 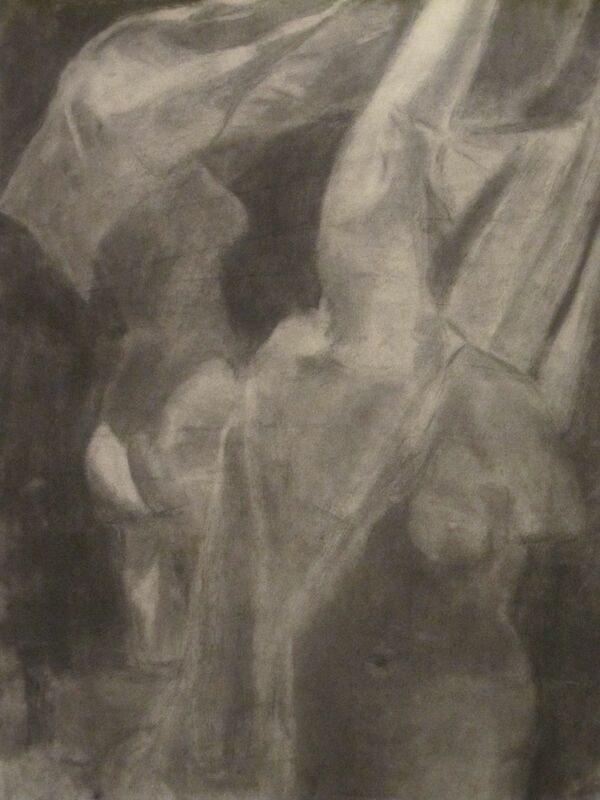 These early paintings, like my early drawings, came out soft and whispery. Hood really liked them. He’s a soft painter himself. I wonder what first paintings can say about artists. 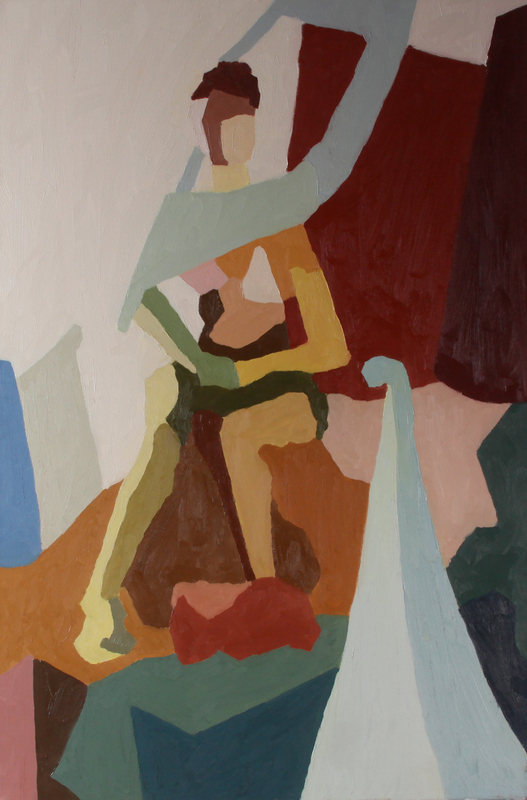 Say my first painting had been blocky and linear, would that mean I have an analytical mind? Or say it had been purposefully dark with few lights, would that mean I’m brooding? 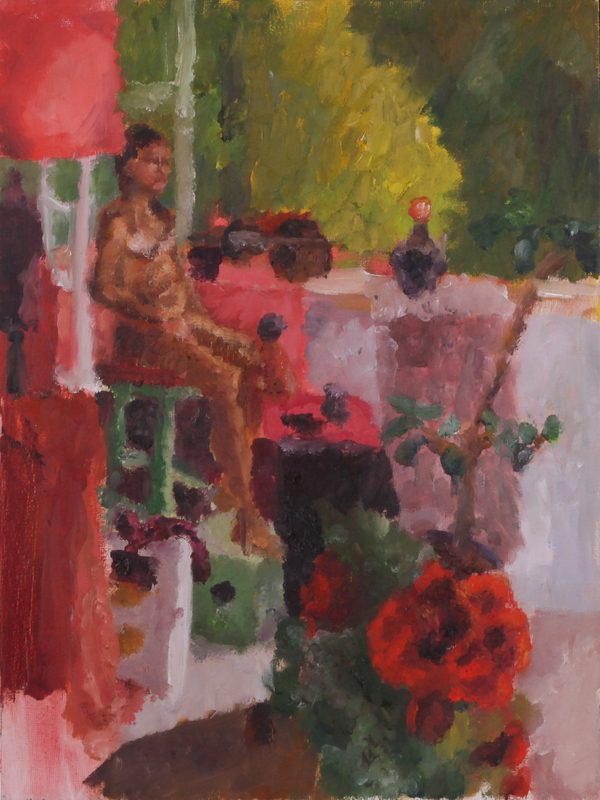 What do my early soft paintings say? Do I have a gentle, reserved nature? I wonder if there can be truths hidden in the way we paint. Especially in the way we first paint. Those first brush strokes are unadulterated and uninformed. They are innocent. Perhaps that’s why there could be truth behind them. Professor Hood certainly did not want to stifle our natural inclinations. He let us paint the first few classes with very little instruction. He wanted to gauge our abilities. 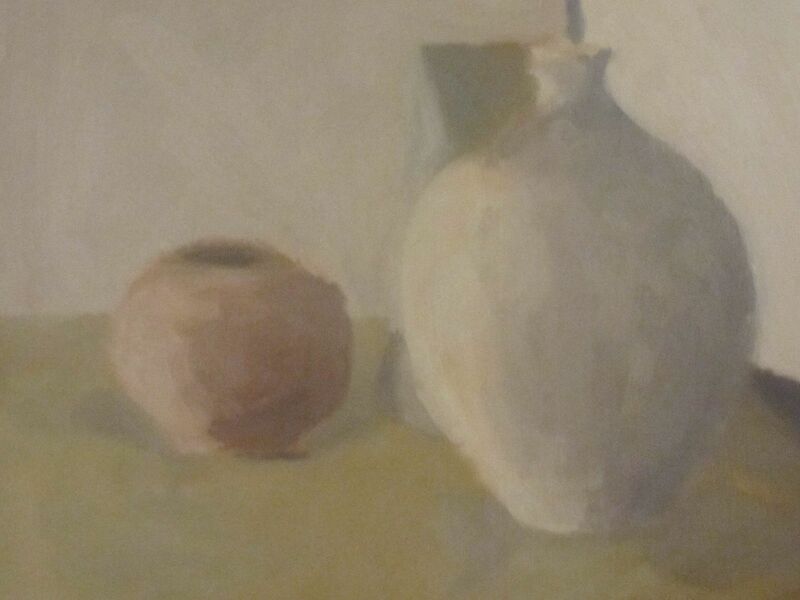 In this painting you can see I played around with white as a color. The light side of the rearmost block almost blends into the background. 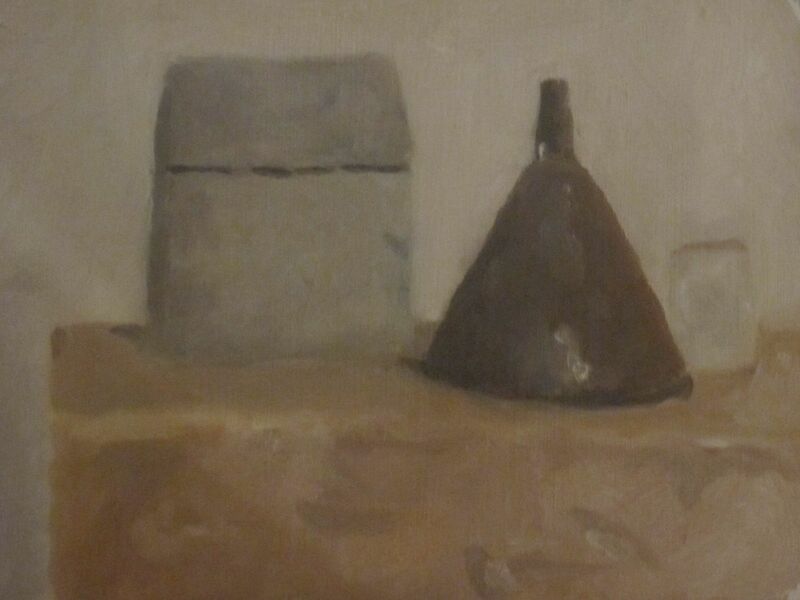 It’s very reminiscent of how Morandi played with figure-ground relationships. I look at it now and see it as quite successful. Then I look at how I used almost pure white to add the highlight to the apple and I flinch. That white pulls away from the warmth of the apple and is not too convincing. It looks placed on. 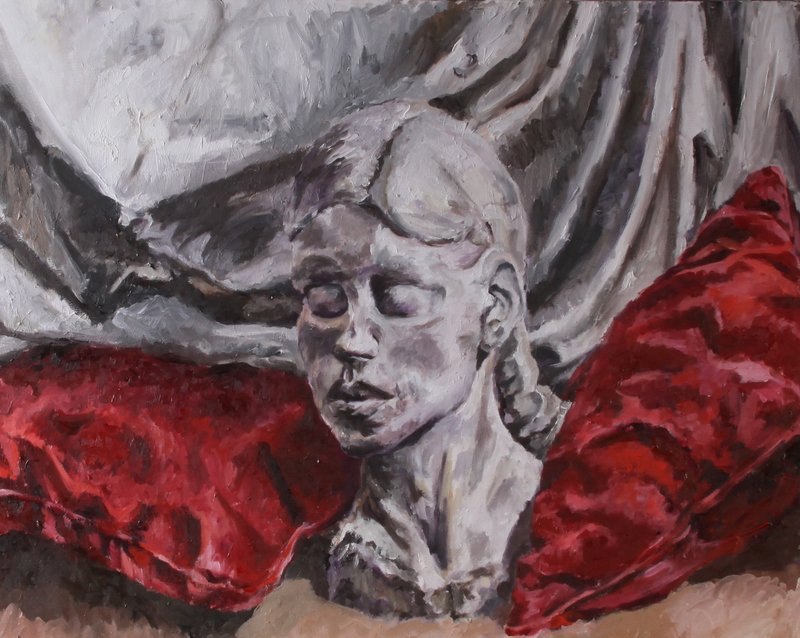 But how can I critique one of my first paintings? It was a learning process. Painting is still a learning process. This painting is dark. It’s an exploration of value. I find it contrasts beautifully with the previous painting. That one explored the whites, this one plays with the dark greens, the dark blues, the dark grays, and the dark browns. I also tried my hand at painting fabric folds for the first time here. Again I used pure white as a highlight. I smacked it right down on the funnel. I think it was after this painting that Hood started really explaining the basics of painting. He’d noticed we’d been using too much white. However, I do like the coppery browns of the funnel. 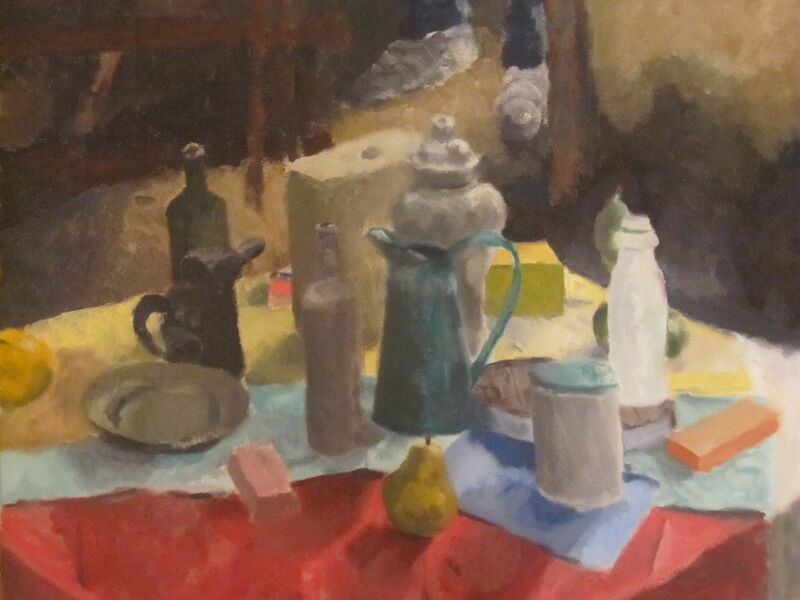 This painting is a good example of how I was noticing the difference in value between objects, but I was struggling to model each object independently. The bottles don’t “turn” in space as much as they should. My lights and darks are too similar to give the bottles form. There is no progression from highlights to darks. All the intro classes are experimental. You get to the classroom and you play with all the tools at your disposal. In this painting and the next we were told to work with our palette knives. No brushes. 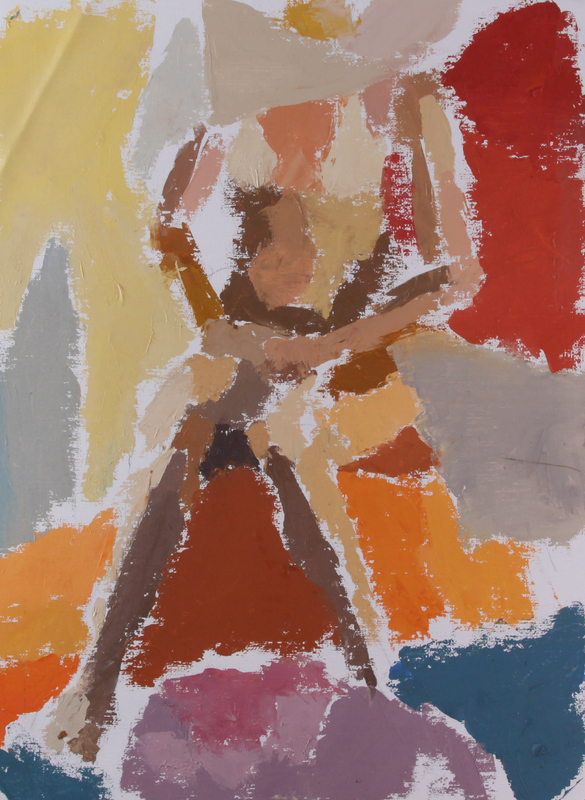 I think the expectation was that we would create blockier paintings and analyze color and value. I didn’t quite do that. Professor Hood came over at one point and said, “Hmm. Not what I was expecting. But I’m not going to tell you to stop. Keep working that way and we’ll see how it turns out.” I don’t remember discussing the final results with him, but I think my method worked. 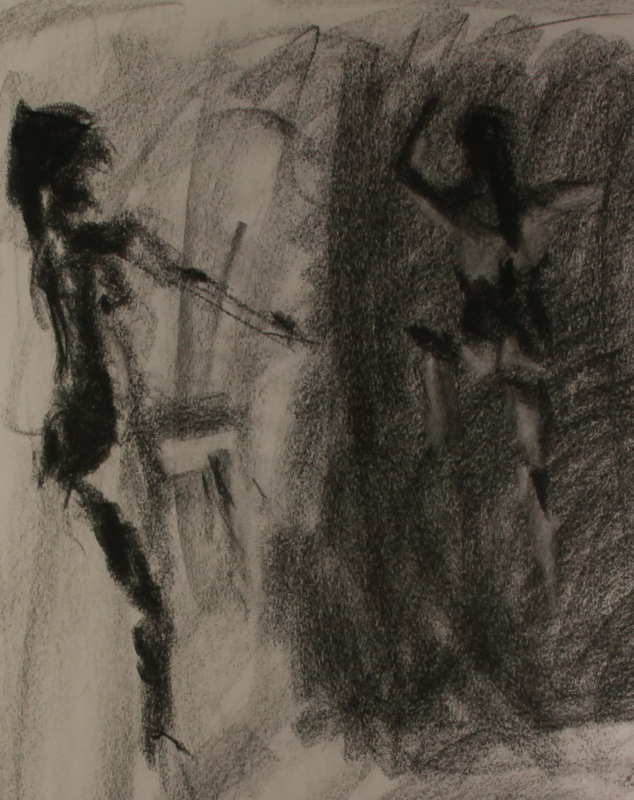 I rendered the figure by focusing on the lights and darks. Even though my knife work was scratchy. My second painting with the knife was even more successful. While it doesn’t exactly have bright lights, there is a strong difference between darks and lights. I was starting to get in touch with value. 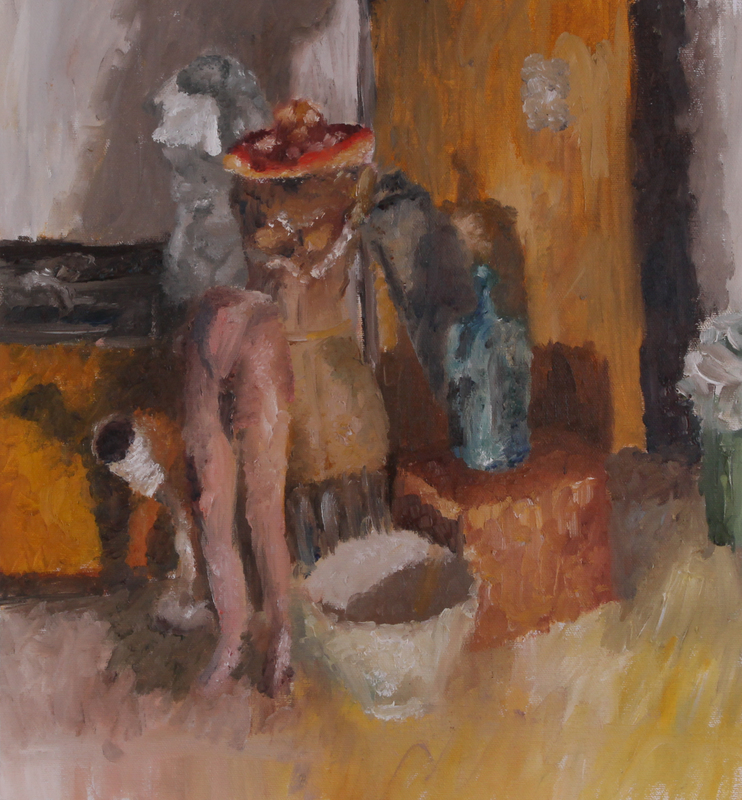 You can see the benefits of the figure paintings in this still life. Look at the objects. They very clearly have light sides and dark sides. 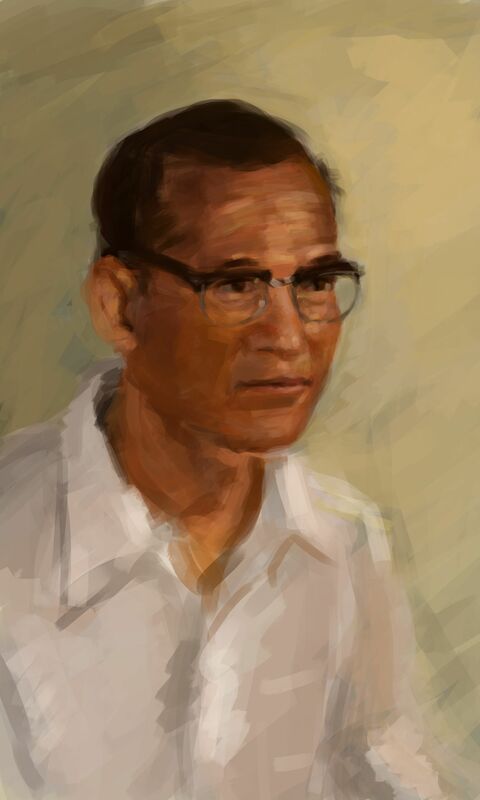 The values are less clear in this painting. The lights and darks seem to muddle together on a lot of the objects. 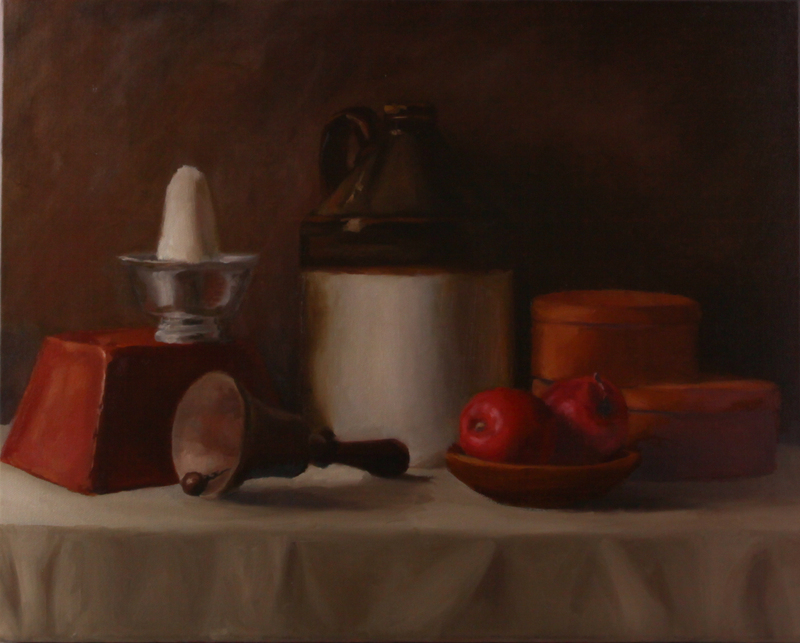 Though there is a strong contrast between the dark background and the light still-life. So there’s that. 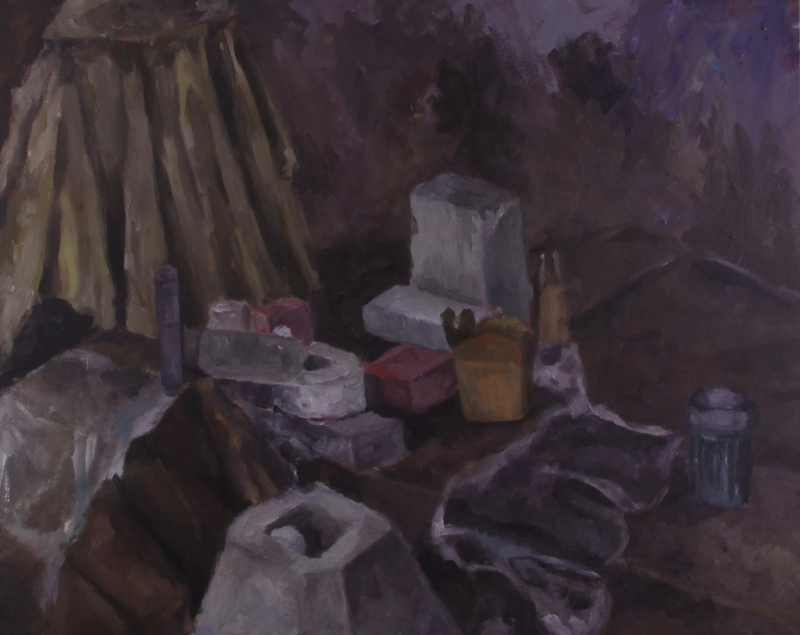 This was my last painting in Intro to Painting, and looking at all the pieces I notice I struggled with composition. 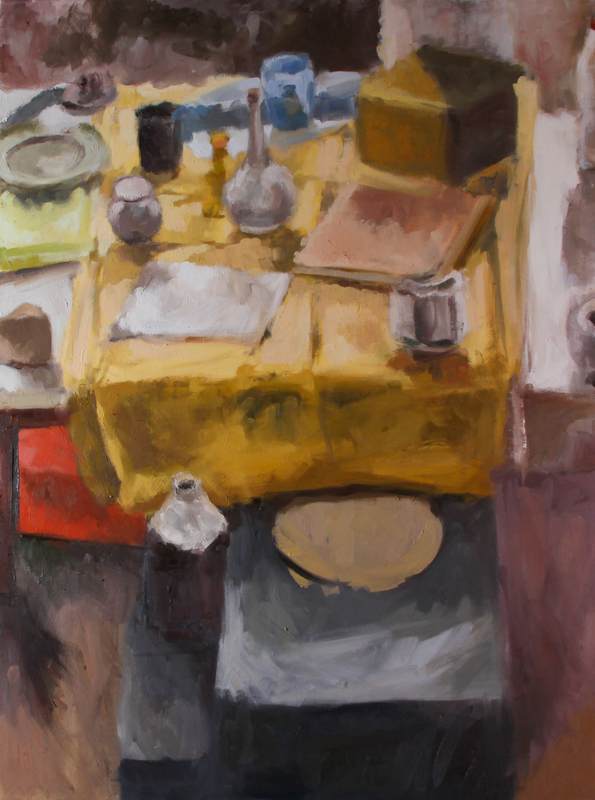 Honestly, I don’t think I started thinking hard about composition until my second semester of Advanced Painting. 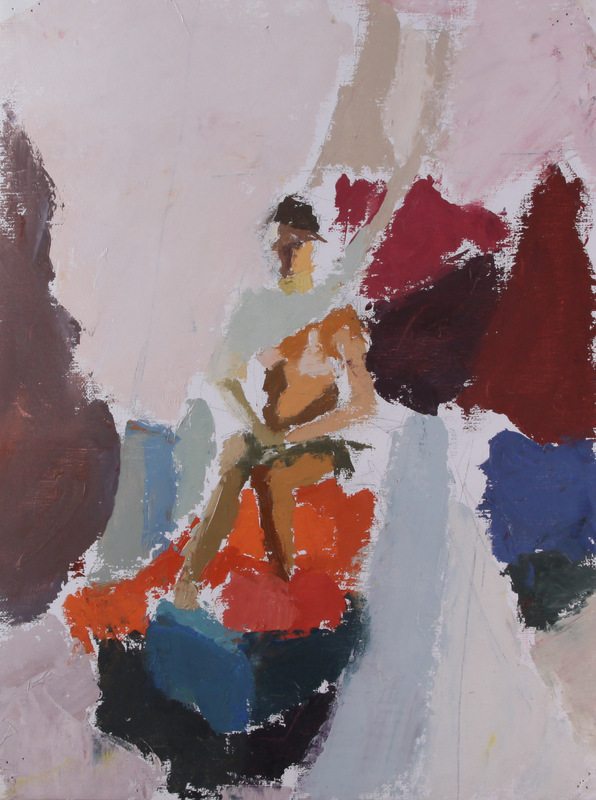 Even these days when I set up a painting I have to consciously make an effort to design the composition. Sometimes I wing it. That’s not good. Nope. I definitely need to focus more on composition. Looking at these pieces has reminded me of that. During the 2010 summer I worked at a sign carving shop. Using some of the money I saved from that job, I purchased a Wacom tablet. It wasn’t until the winter that I got some time to seriously use it. 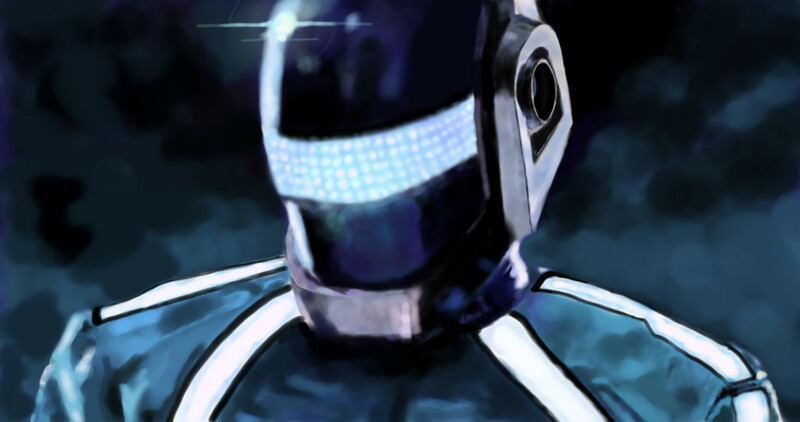 The movie Tron: Legacy was released just before I went on winter break. I liked the art style and decided I wanted to do some fan art. Hold up. Fan art. That’s right. Not my cup of tea at all, but for some reason I was motivated to give it a try. I picked a promotional still of the music duo Daft Punk in Tron gear. They did the soundtrack, but I don’t even listen to normal Daft Punk. I seriously don’t know what I was thinking at the time. Not that my decisions were bad. They were just abnormal decisions for me. 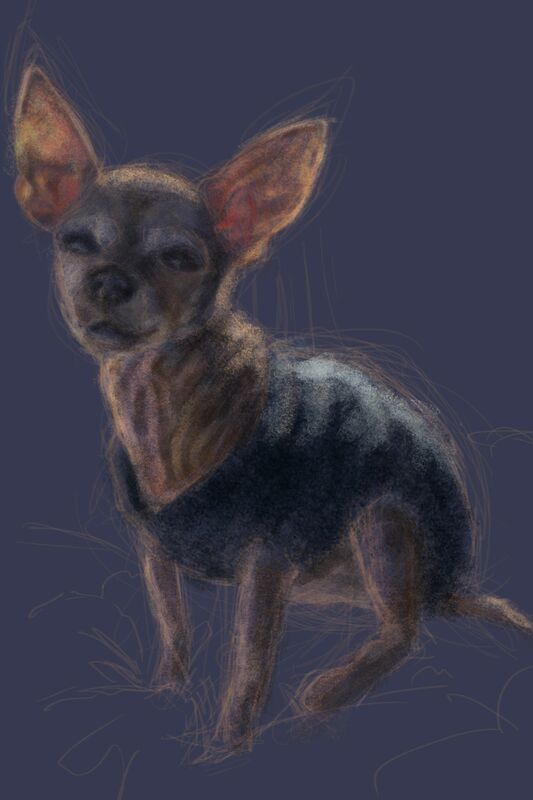 Like many people when they do their first digital paintings, I abused the zoom function. I zoomed right into every crevice and over did the detail. I completely overworked the painting. 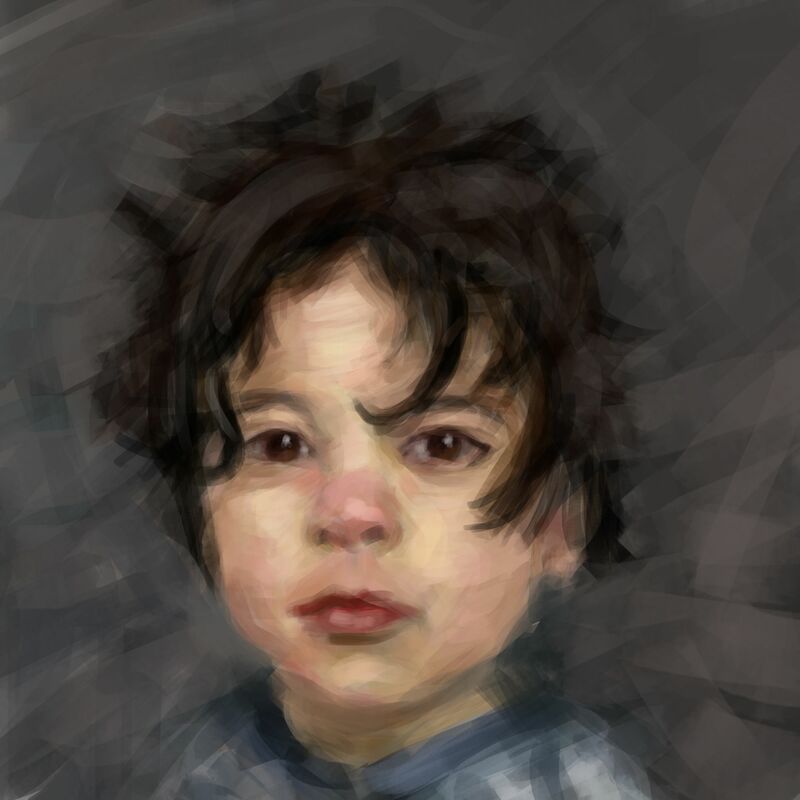 I’m not a fan of the end result, but it helped me learn some digital painting techniques. I found some old pictures of my sister and decided to paint from them. I like the bottle in this one. And this one is…uh…bug-like. The eyes just don’t fit the face. I feel like I should go apologize to my sister. My dorm floor that year had a running gag where we would place a piece of fake dog poop in each other’s belongings. One person would place it in another’s backpack, and then when they found it they would hide it in someone else’s stuff. Anyway, I got halfway through winter break and I found the plastic poop in my jacket pocket. I’d been done good, as they say. But I knew who had placed it there. 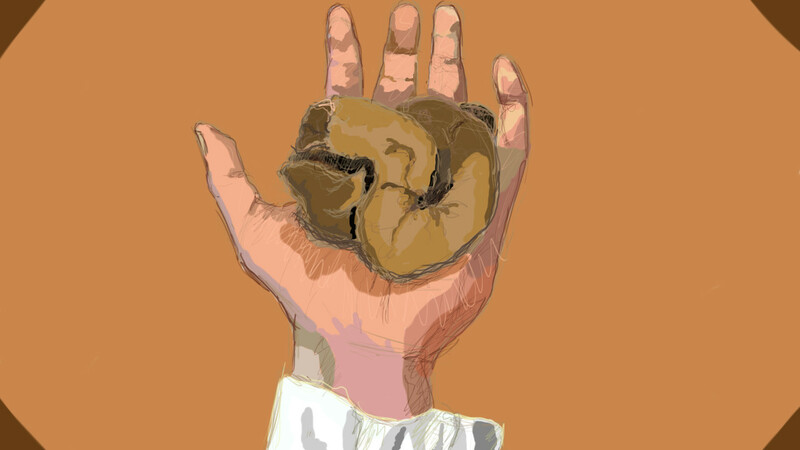 So I drew a sketch of me holding the poop, put it on Facebook, and tagged my friend in it. I let her know that revenge would be swift and unforgiving once we got back to school. Stylistically, I had a lot of fun with this drawing. I did a sketch and then filled it in with blocks of color. I’d been looking at other artists who used a similar technique. This was probably the first time I started seeing color in shapes. 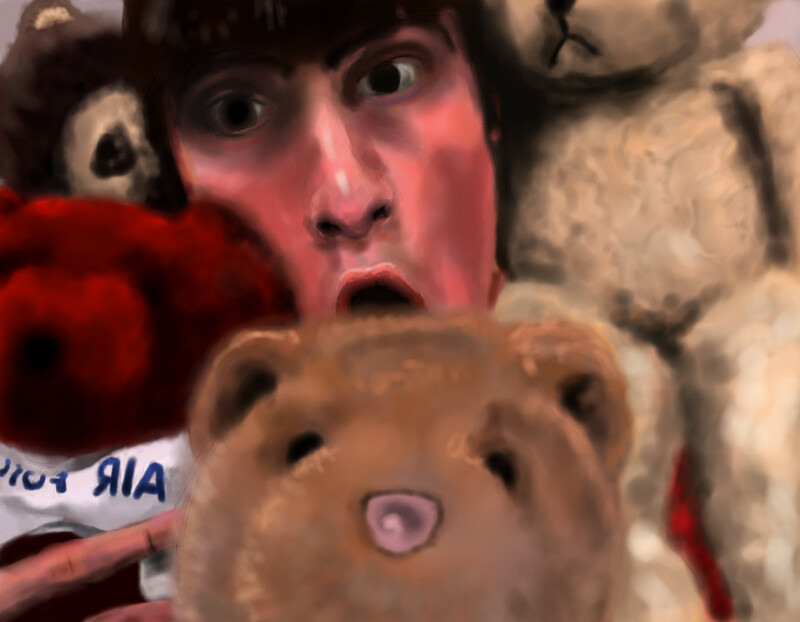 Playing around one evening, I took a self-portrait with a bunch of my teddybears. I found it funny, so I painted up a copy. 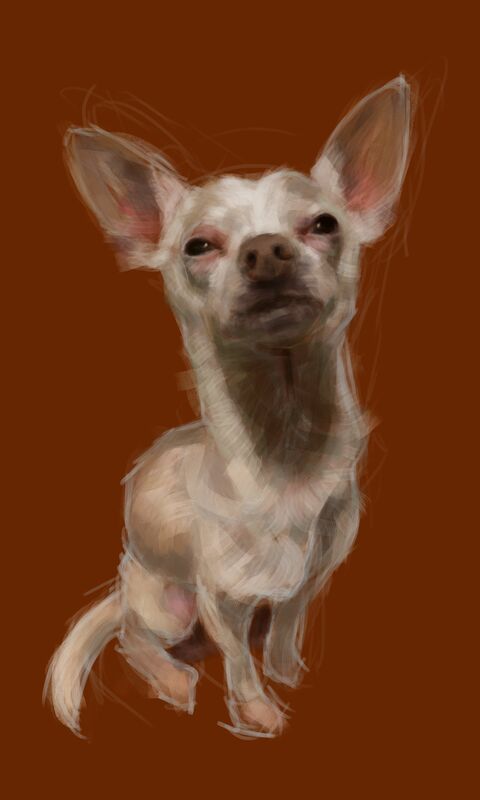 Like my previous digital paintings, it looks characteristically digital. That’s a trait I’ve tried to avoid recently. I want my digital work to seem more traditional. Back at school I did a couple more digital pieces. 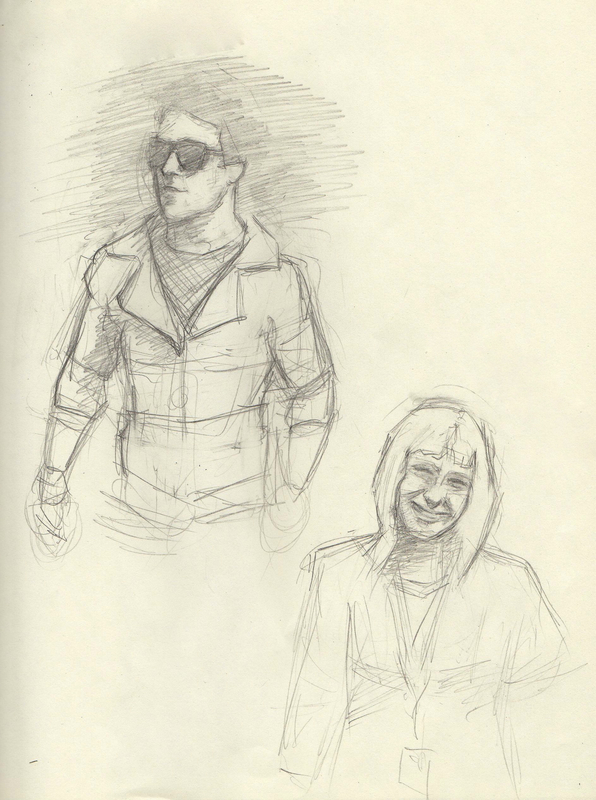 My art classes were only art history classes during spring 2011, so these were the only pieces of art I made during that time. While browsing deviantart I found artist toughtink’s shaun, and decided I wanted to try painting in that style. 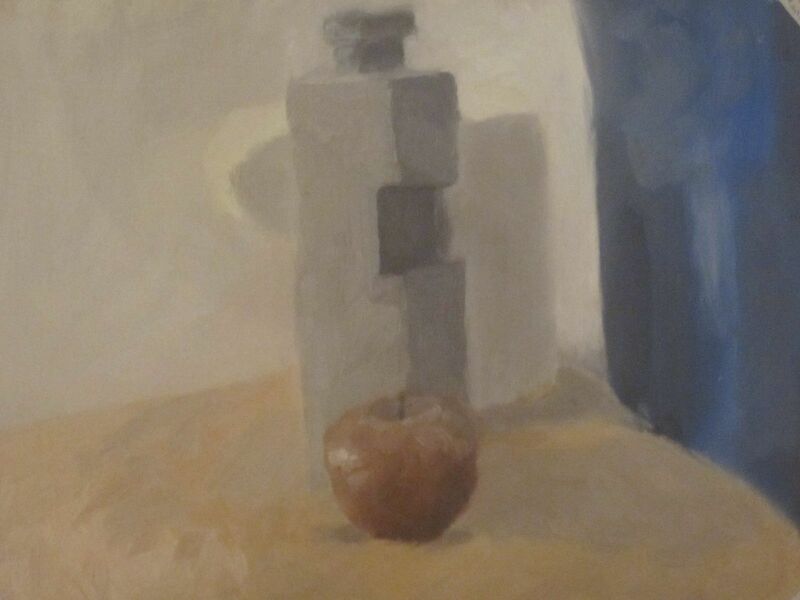 Just like the dog poop painting, I focused on using blocks and shapes to establish form. It turned out rather successful, though not quite like shaun. I see this painting as a turning point. I was starting to think differently than I had at the start of Intro to Painting. I was starting to think painterly. 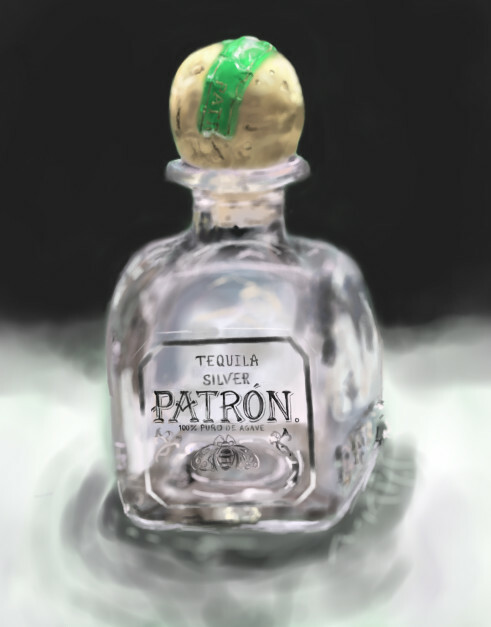 For two thirds of the semester I worked on this Patron bottle. I put it on my desk beside my computer and painted it in my free time. I started at the cork and worked my way down into the glass. This was my first time focusing on the intricate color reflections in glass. I abused the zoom function again. The cork came out nicely, but there’s something about the glass. It lacks rigidity. I think it could benefit from some thick darks. 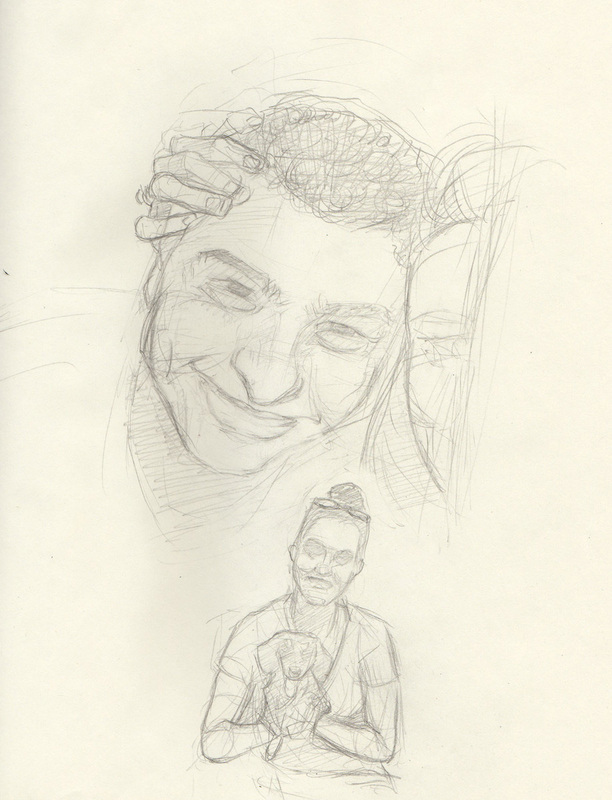 My Intermediate Drawing professor was Rick Fox. His teaching methods were fun and abstract. He went to great lengths to create wacky still-life setups. 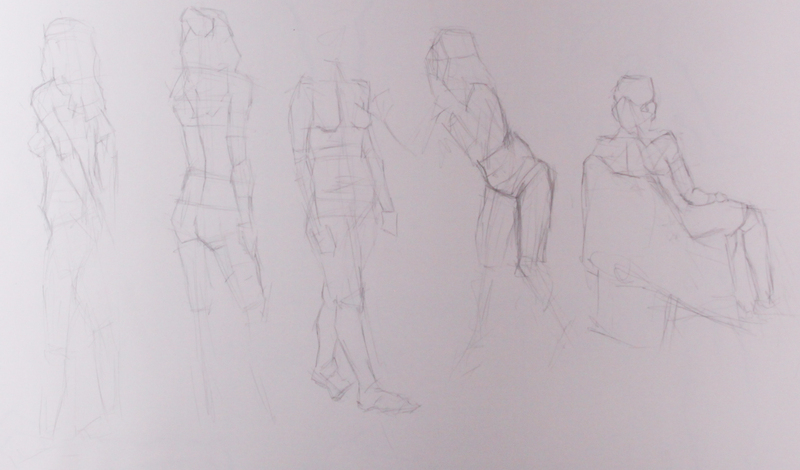 The following pictures are of figures, but we did do still-lifes in the class as well. I’ve sadly misplaced them. 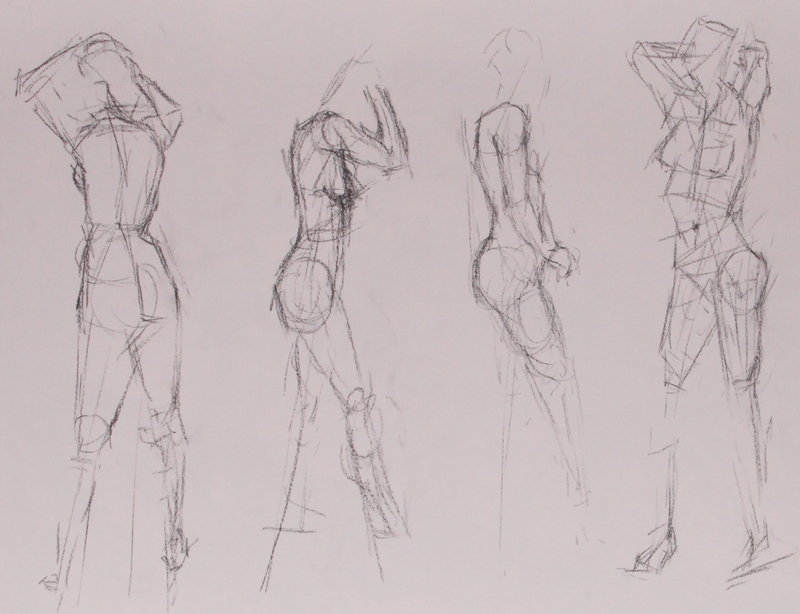 Like in the intro class we started off with short figure poses. 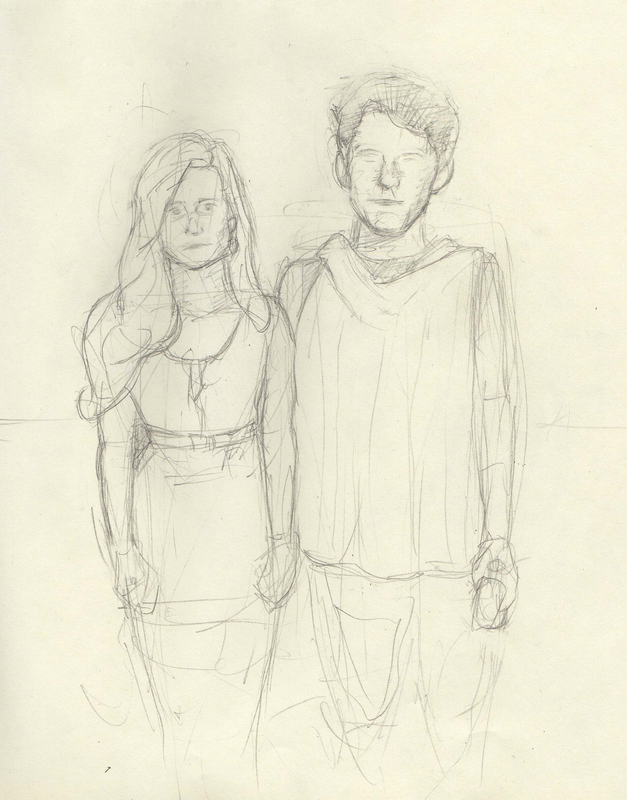 This drawing was probably a couple minutes in length. 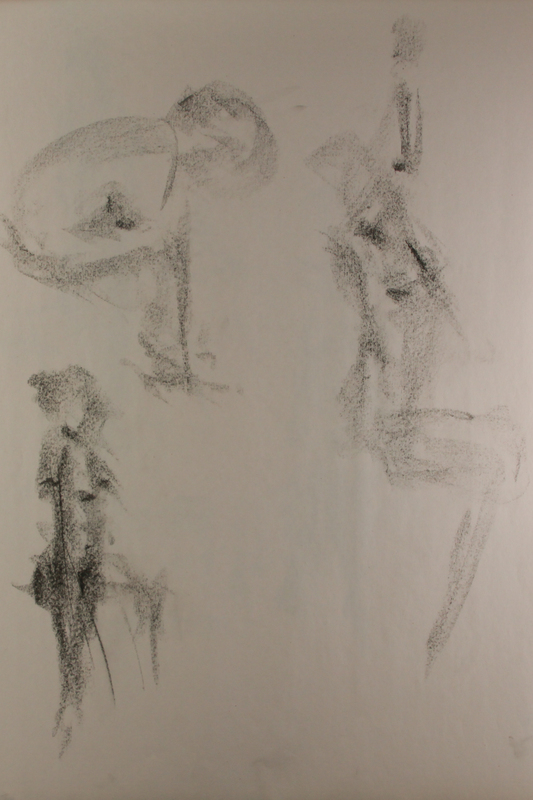 The following drawings are all 30 second gestures. Gestures are useful for getting basic information down. 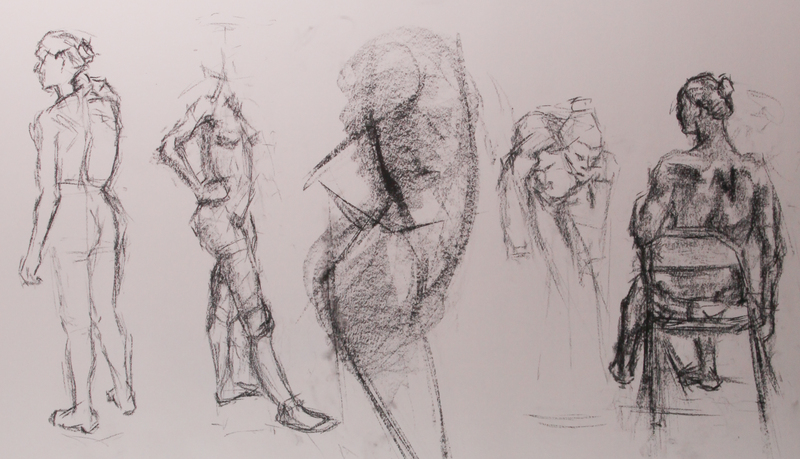 A good series of gesture drawings can help an artist see the big shapes of the figure. 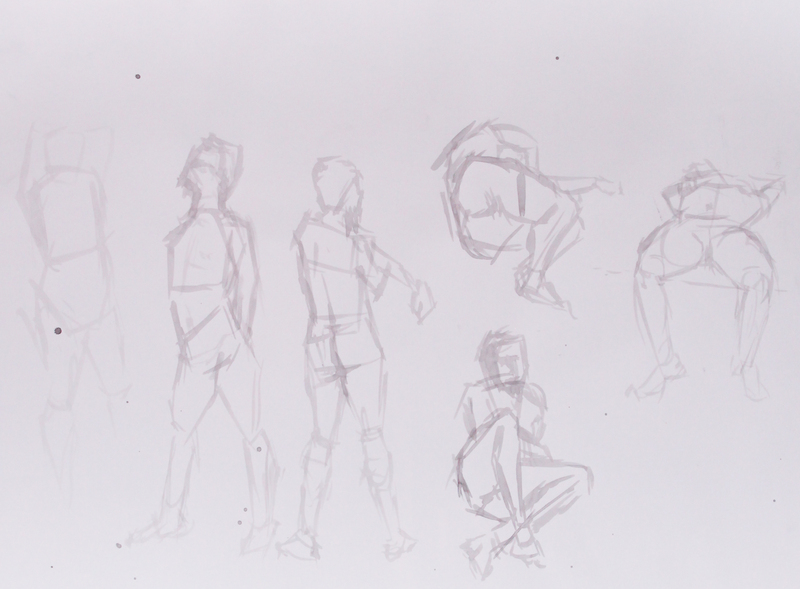 Also, they’re good for working out compositions. 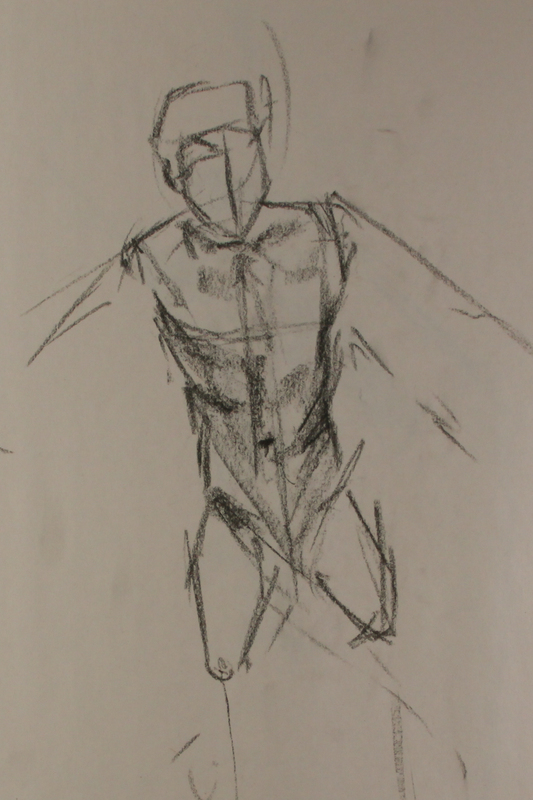 Rapid drawing forces the artist to find the flow and movement of the figure. 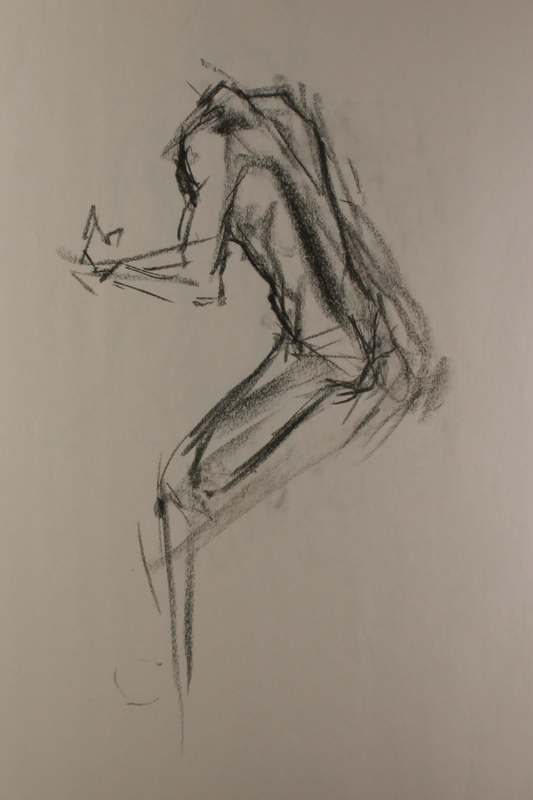 Working from gesture drawings can help prevent a final drawing or painting from becoming stiff. This is one of my favorites. I don’t remember how long it took. I don’t remember when I drew it. I only know it’s got a simplistic beauty. The lines seem to flow into each other. From the top of the head all the way down to the vanishing leg lines. It feels feminine. 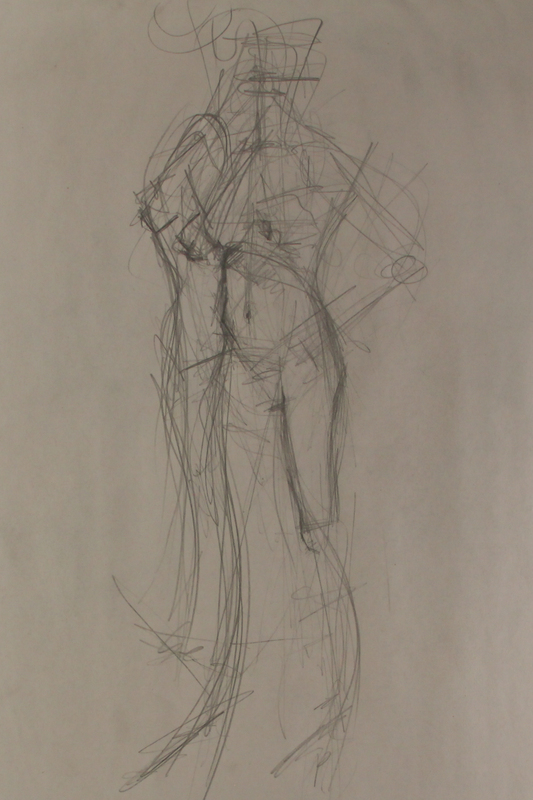 Here I was working with proportions and trying to measure the distance from navel to breast to head. 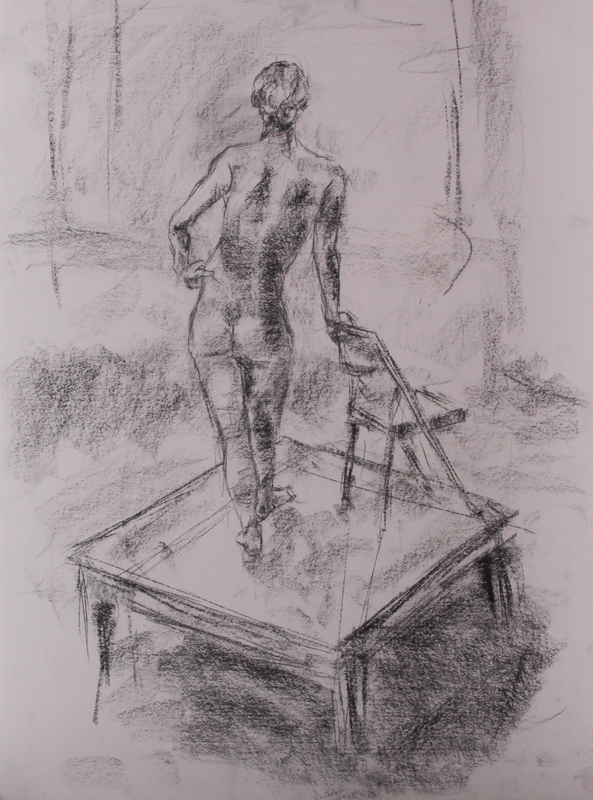 During Intermediate Drawing I began a transition from charcoal to conte crayon. 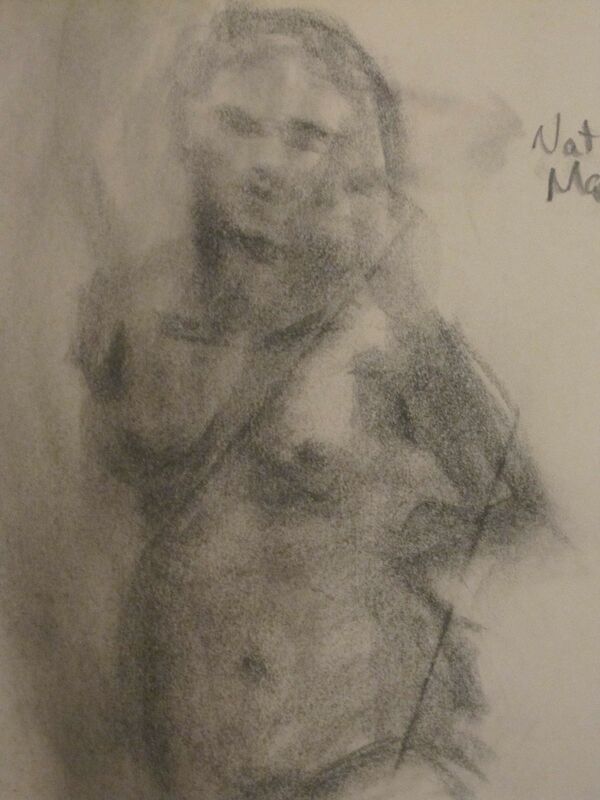 This is one of the first drawings I did with conte. It’s a stiffer medium and I had to adjust to that. But it allowed me to be precise with my darks. 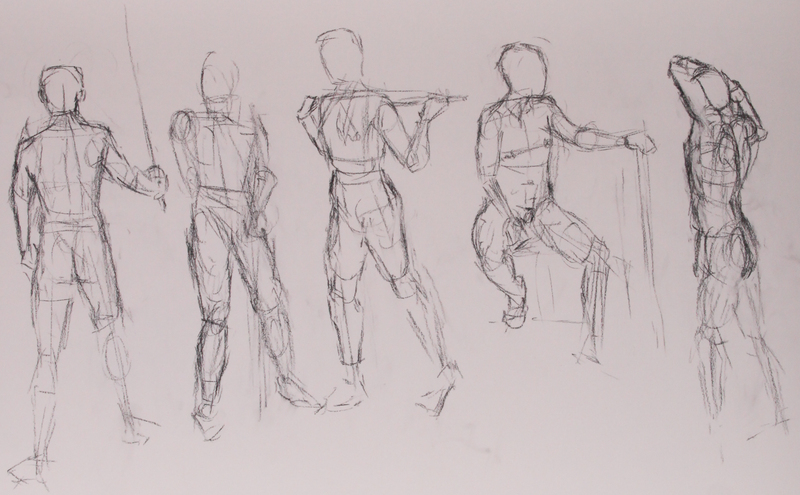 The next four drawings are gestures done with conte. 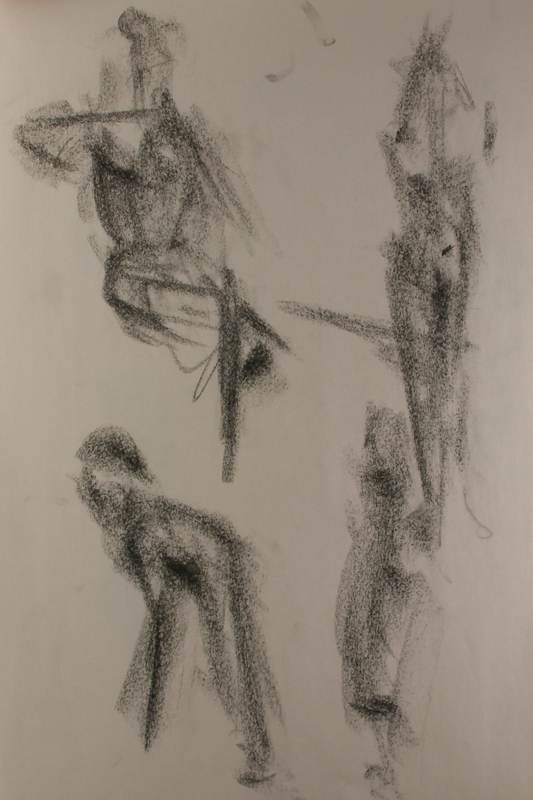 Throughout the semester we moved back and forth between gestures and longer drawings. 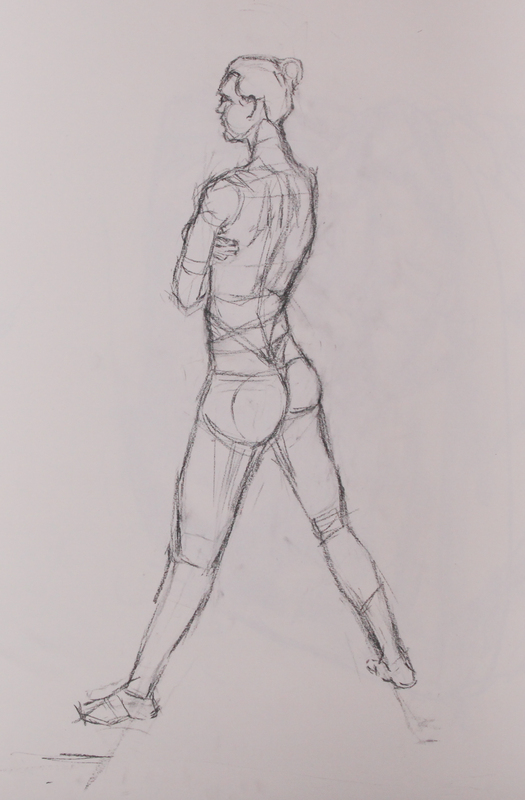 This was probably a 3-5 minute pose. 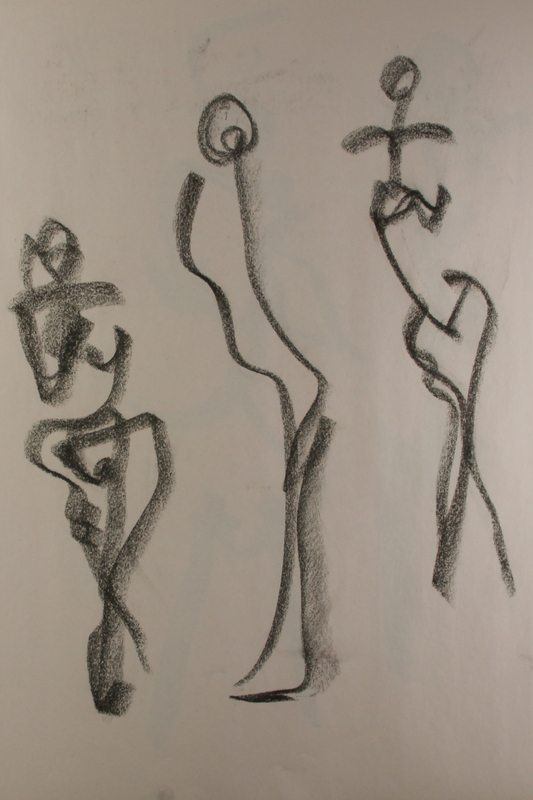 I find the heaviness and looseness of these gestures reminds me of african sculptures. 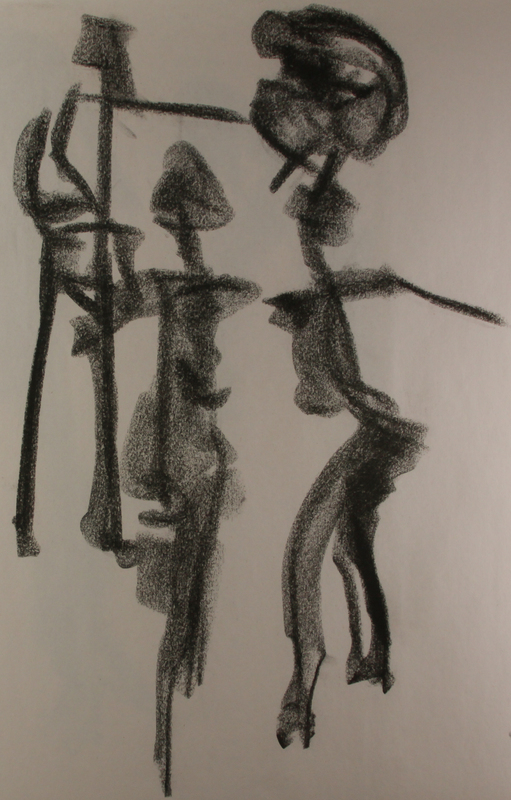 While drawing these two figures I was instructed to avoid line and use the flat side of my conte stick. 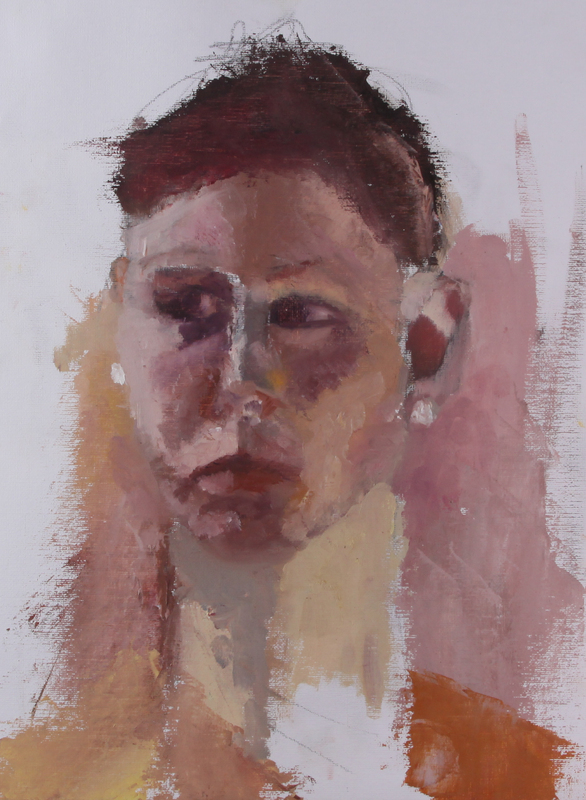 There’s pain in emotion in the righthand figure and I think that’s accentuated by the softness of the conte. Compare the last drawing to this one. See the difference? This one is mainly line. 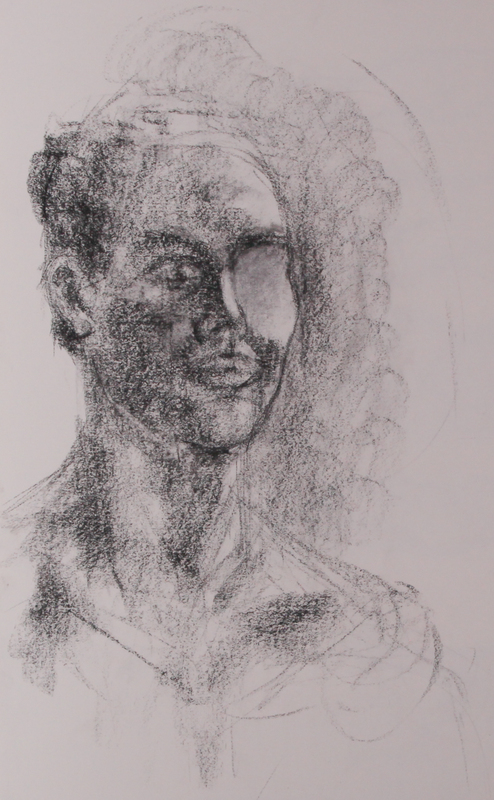 Over time a conte crayon can smooth down into a point on one end. 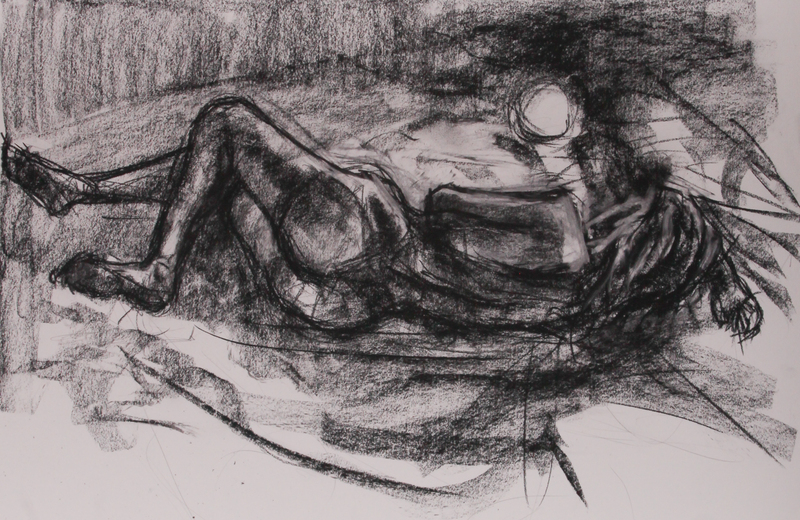 This allowed me to draw as if the conte was a pencil. 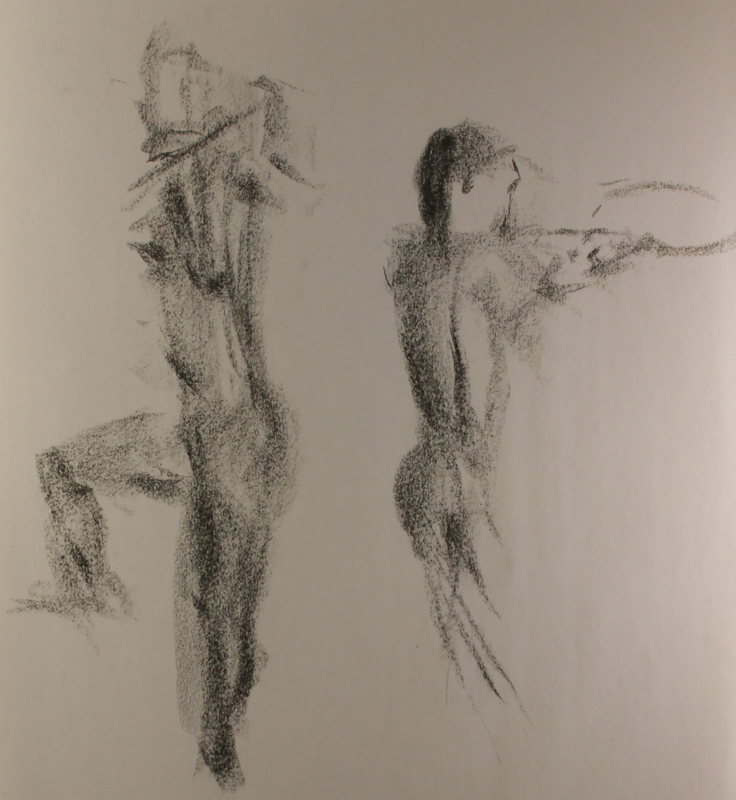 When we returned to gesture drawings I tried to balance line with soft shading. 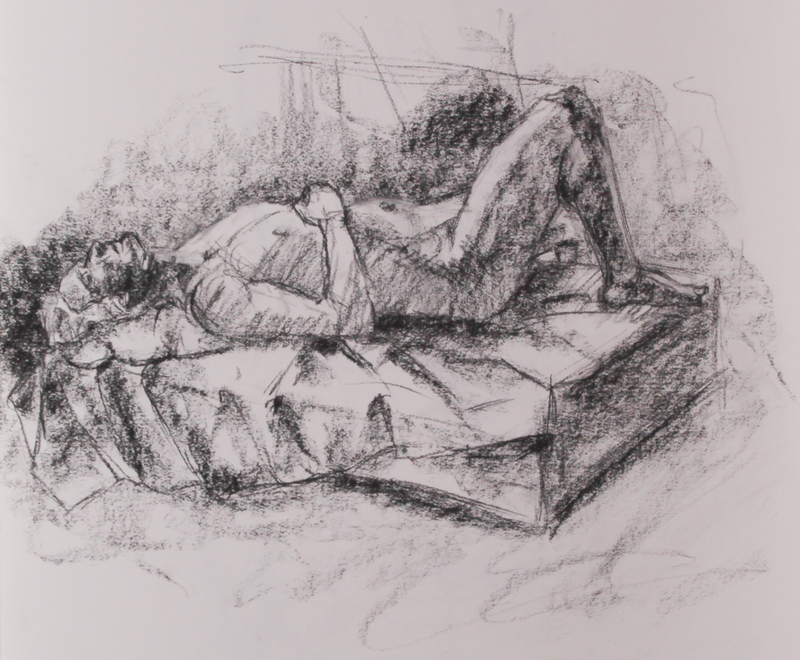 This drawing was meant as a chiaroscuro study. Notice the heavy modeling and the stark difference between lights and darks. Then I had a break through. 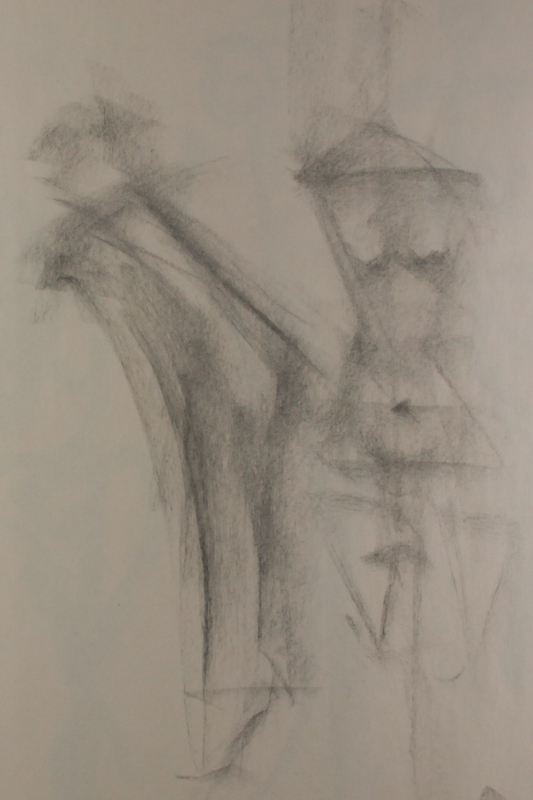 I started seeing the human figure in clearly outlined shapes. I realized I could build the figure that way and then fill it in with value. It was a comic book like technique. I see this drawing as the culmination of all the techniques I learned during the semester. The figure has flow. 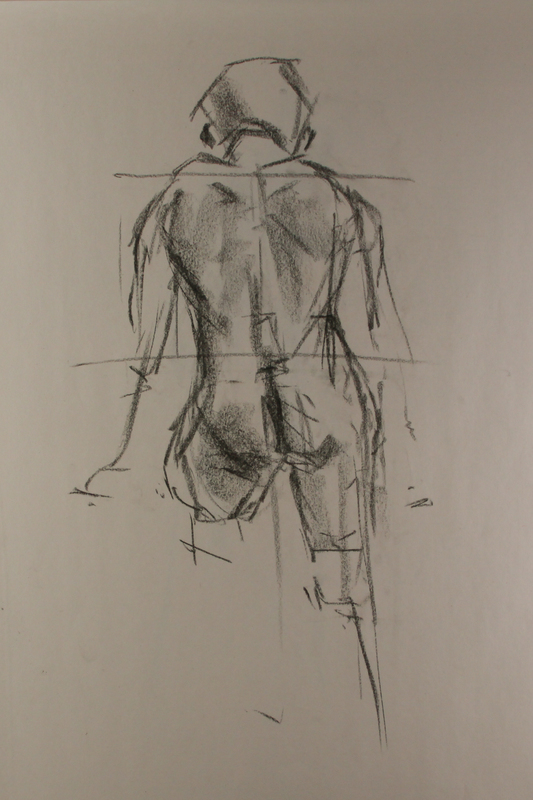 The hunched shoulders hold a weight that trickles down the sloped spine and into the cocked buttocks. 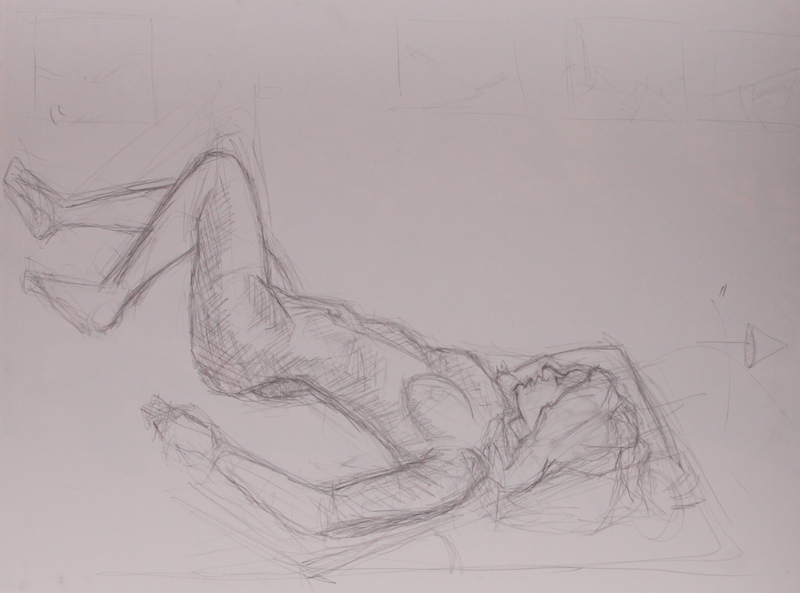 This was done with a combination of modeling and lines. 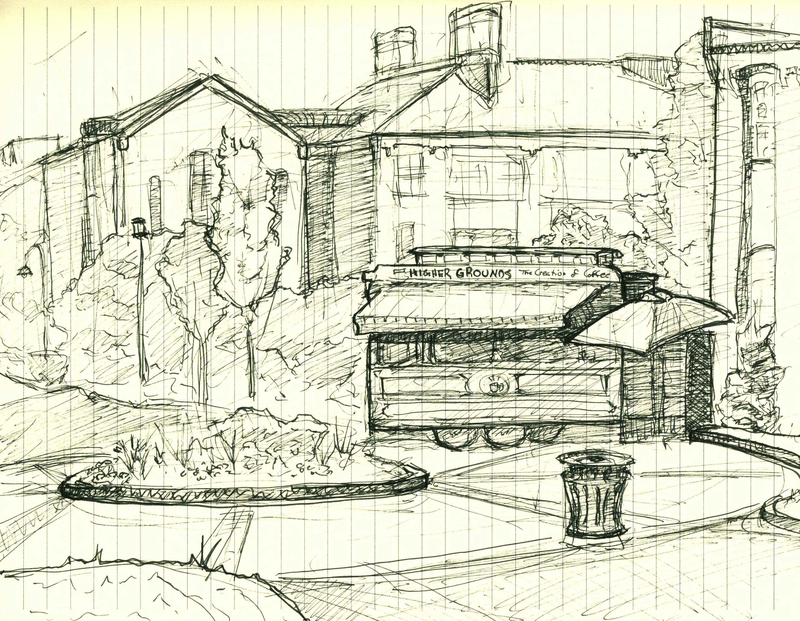 But the semester was not over after that last drawing. 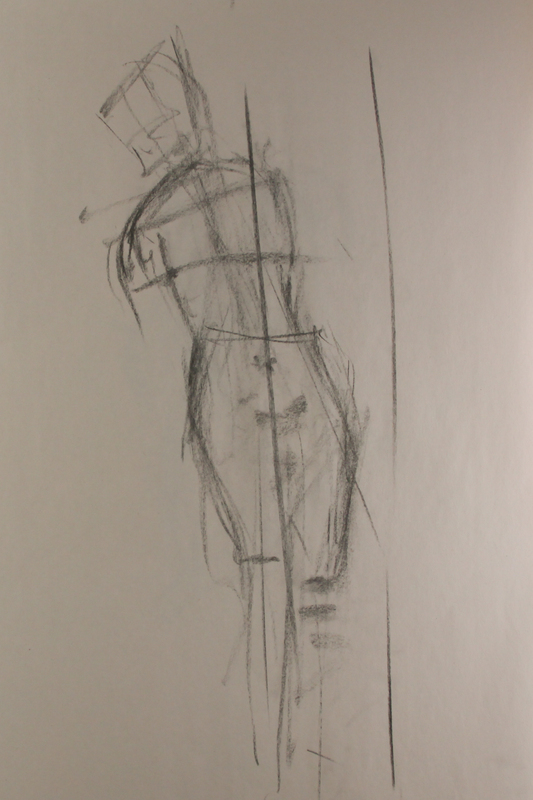 We continued to work on speed and developing the figure with just a few lines. We worked very little with pencil. And I’m glad for that. 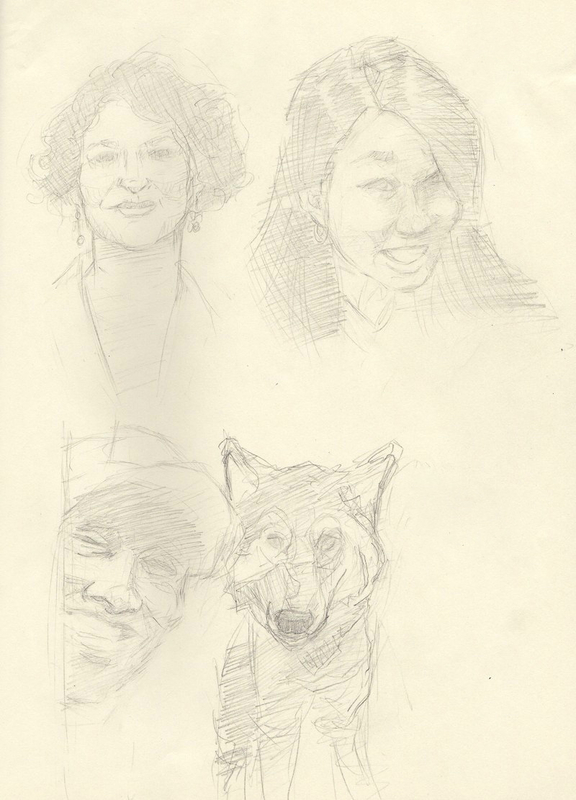 Pencil is hard to use quickly. It’s a tool that’s built more for precision. In my opinion and experience at least. It doesn’t have a large, broad edge that can be used to place large swathes of value. 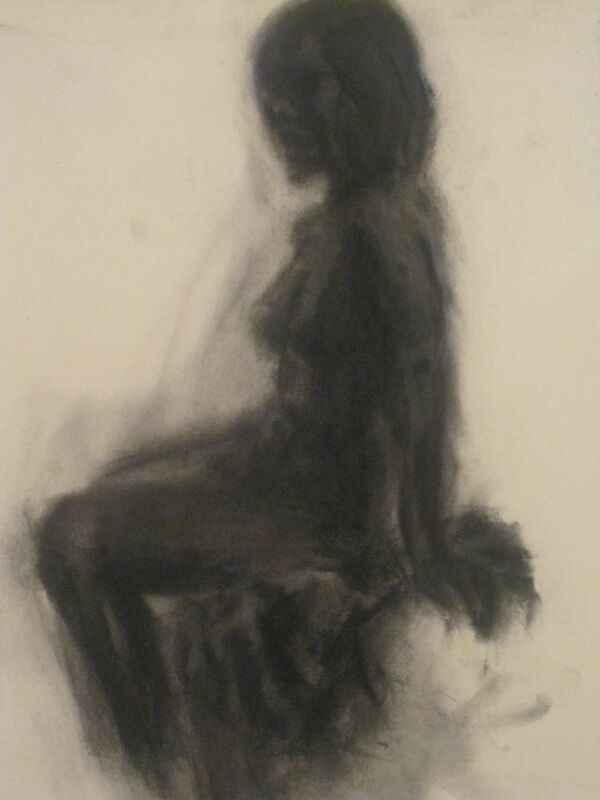 That’s the advantage of charcoal and conte. 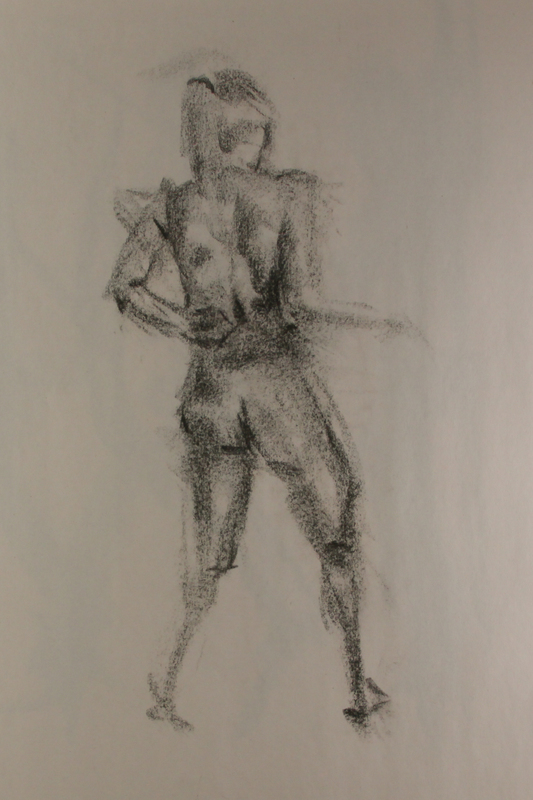 Like the male figure I raved about earlier, this figure uses a lot of the techniques I learned. However, the anatomy of the shoulder seems a little off. Oh well. I do like the shape of the head. Towards the end of the semester we started doing longer projects. This was an out of class assignment. 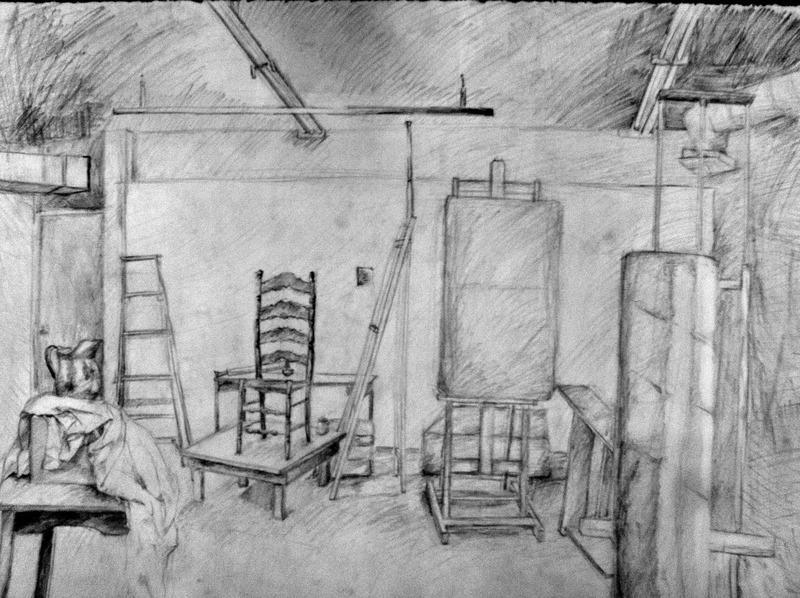 I had to draw the classroom with a pencil. One of Fox’s action-packed set ups. 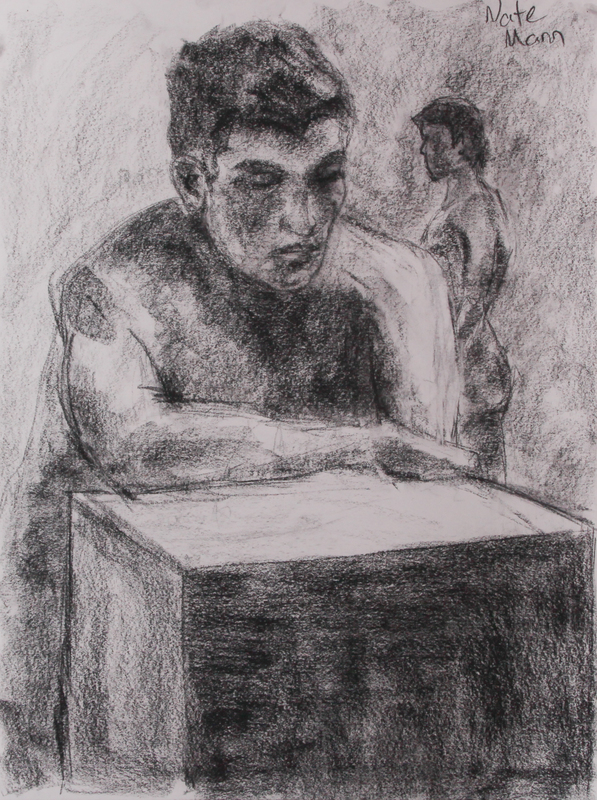 I was stuck behind a couple students while drawing this, so the rectangle in the bottom right is another student’s drawing board. 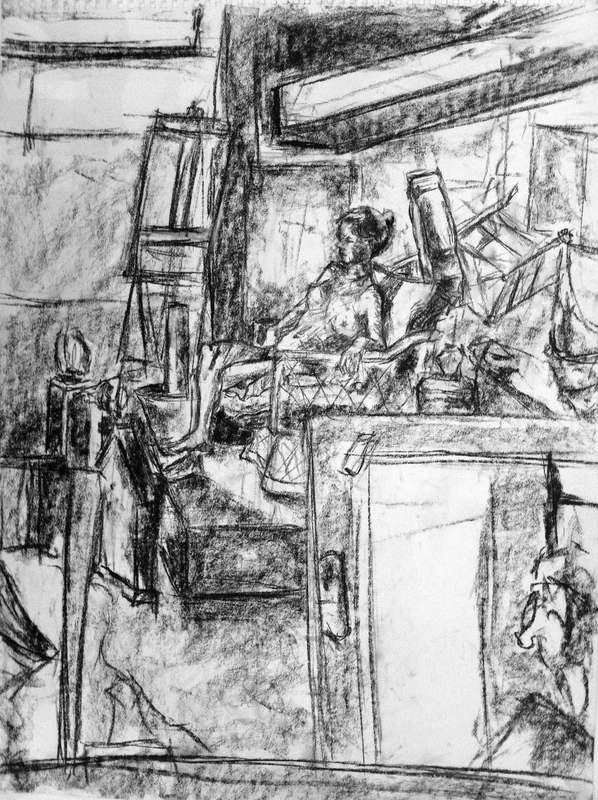 An outside of class assignment to draw an interior with a couple figures. The room was my dorm lounge and the figures were pulled from photographs. 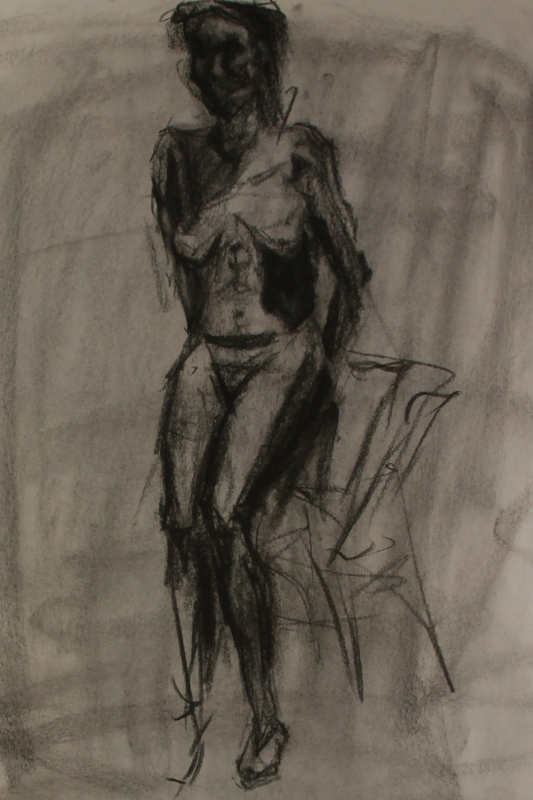 This is my favorite piece from Intermediate Drawing. It started off as one sheet. The top sheet. 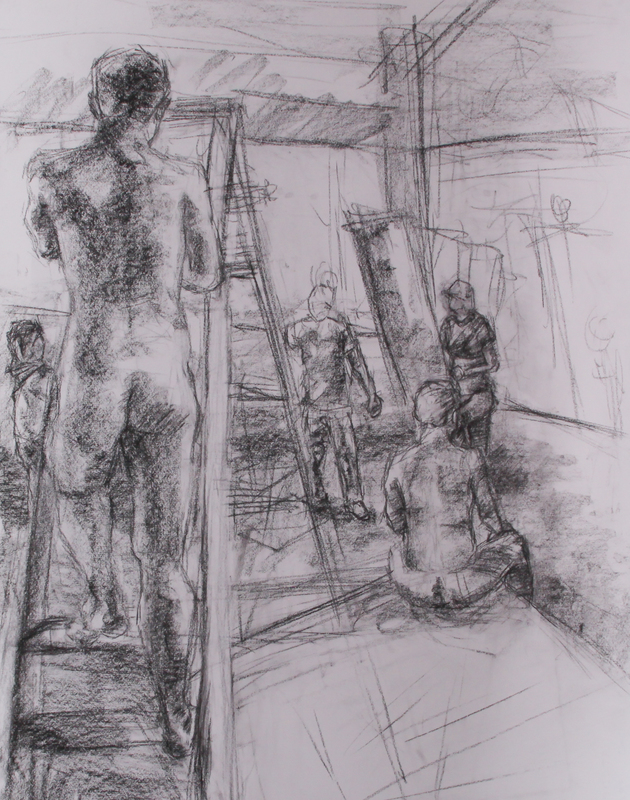 We spent a day drawing models in the metal working shop. 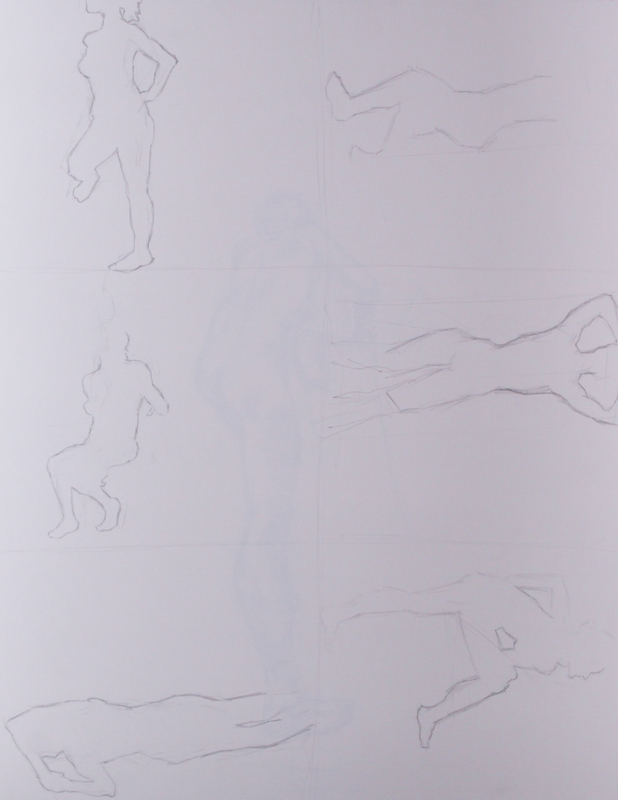 The next day I added the bottom sheet and continued the perspective. I should try doing a project where I just keep adding on sheets each day until the perspective gets disjointed and wonky. 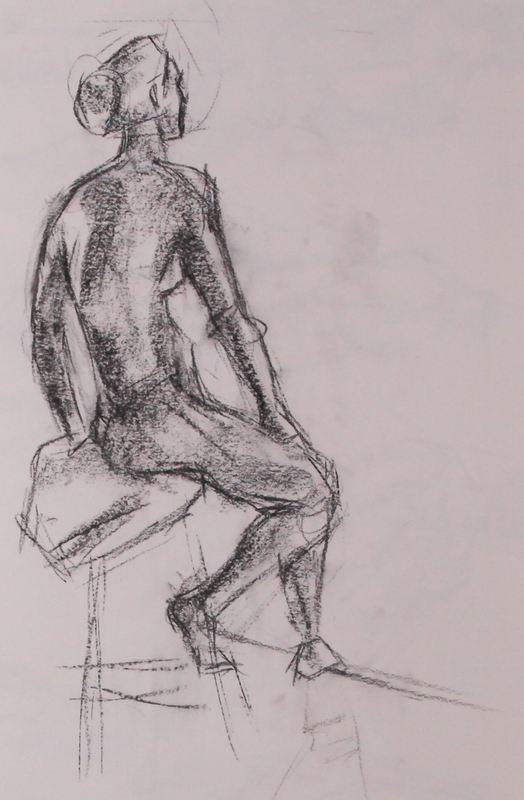 I should mention now that I took two sculpture classes at UNH. I don’t have those sculptures photographed. I should. 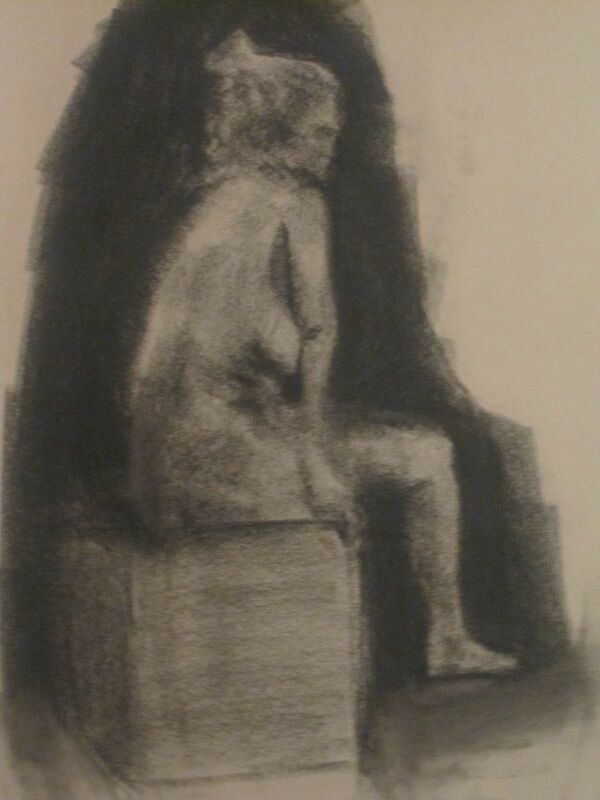 I took a Figure Sculpting class the same semester as Intermediate Drawing. 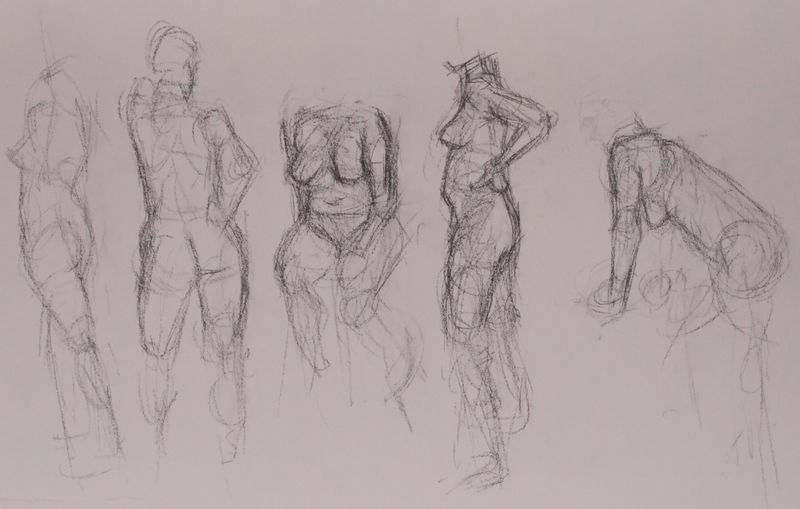 That Figure Sculpting class was incredibly helpful for understanding how the human body works. I constantly think back to the lessons from that class. We learned so much about anatomy. That knowledge is now invaluable to me. 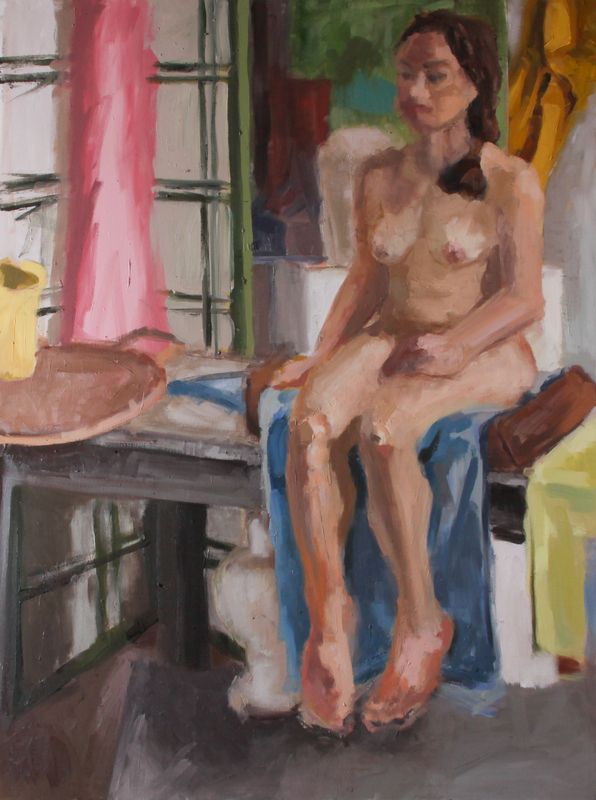 Spring 2012 semester I had Intermediate Painting with Rick Fox. 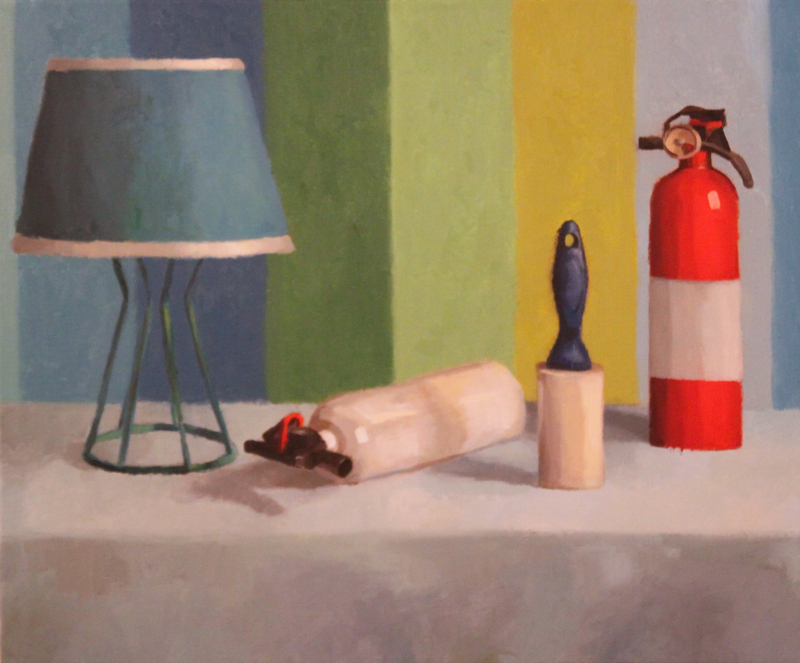 Remember how I said he sometimes had wacky still-lifes set up for us? The following pictures will show some of his teaching techniques. 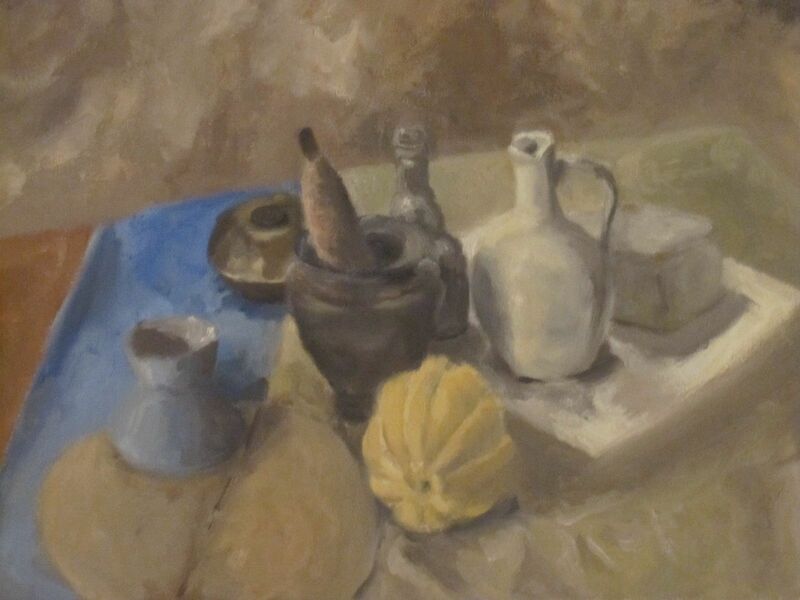 For the first still-life we were given a limited palette. I can’t remember exactly what it was, but it forced me to paint very dark. A week later Professor Fox had us under a different limitation. We had to paint the opposite of what we saw. Brown box? Paint it blue. White bag? Paint it yellow. 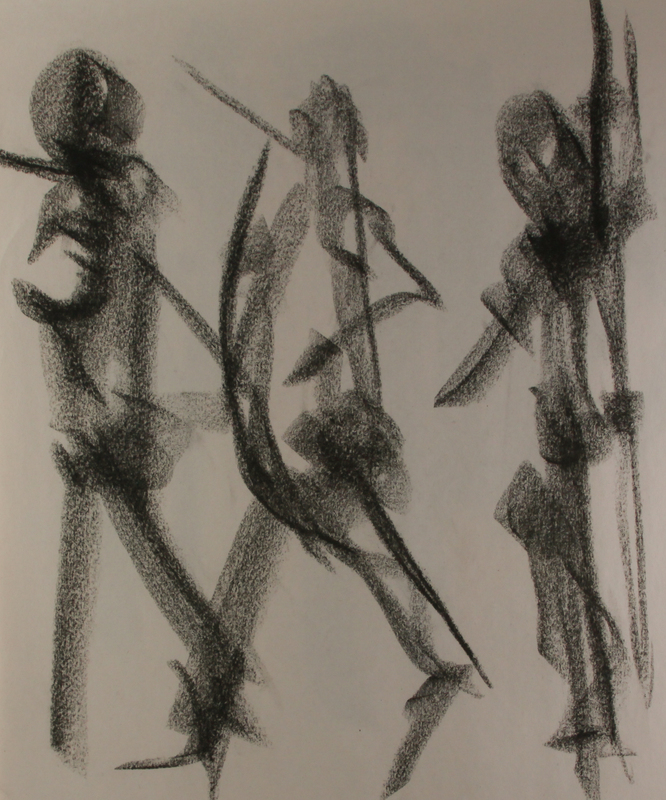 While these are not true opposites, the point of the exercise was to paint no native color. And oh. No white allowed. The restraints made for a mess. But it was a fun mess. I learned a lot about color relationships. I figured out what color looks good next to what. I was supposed to learn something about white from the color limitation exercise. I was supposed to learn not to use so much of it. But next session I painted this. And it uses so much white. I must’ve bottled up my need for white and let it explode here. 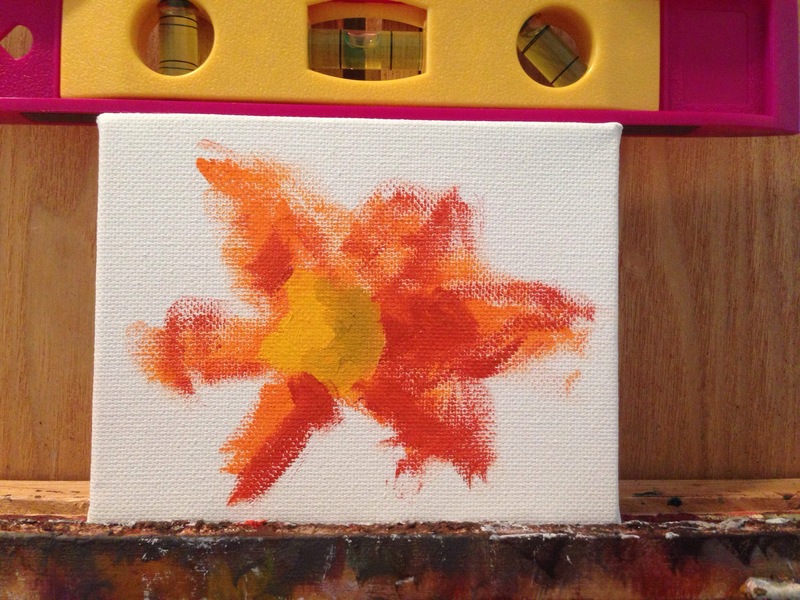 Professor Fox wanted us to see the benefits of painting in blocks of color. 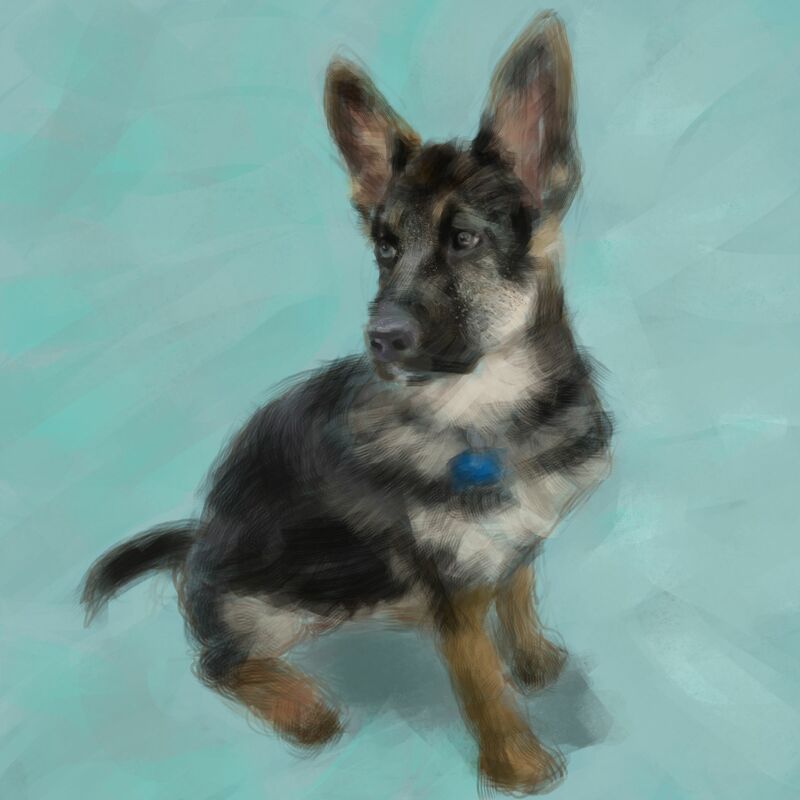 Of course, I’d practiced similar techniques with a couple digital paintings, but then moved on. Once again I had to make a concentrated effort to see in shapes. For this painting we were told to draw two strips on the canvas and paint what we saw on those strips first. Then we could move into the rest of the painting. You can see the cross-like strips meet around the eye sockets. We were given a homework assignment to paint ourselves deforming our faces. I selected scissors and gently pushed them down on my lips. I played it safe. Didn’t wanna lose my lips. 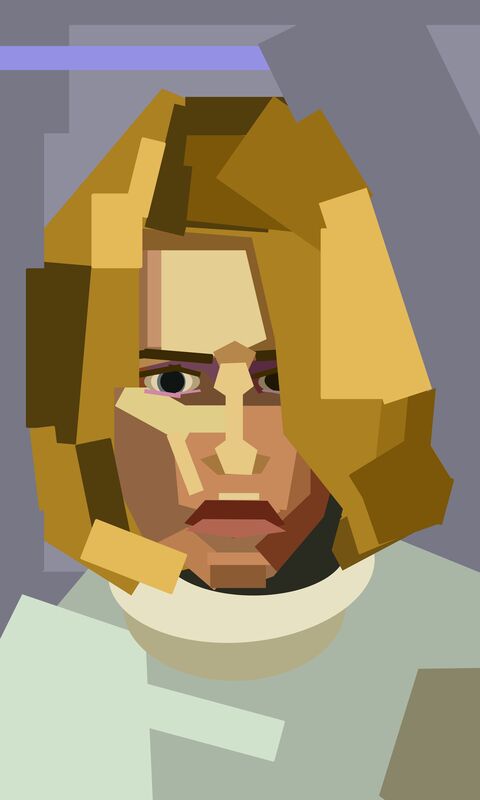 The art style wasn’t mandatory. I was looking at a lot of street art at the time and was inspired by stencils. Another assignment was to do a self-portrait wearing the weirdest things we could find. I wrapped myself up in a sweatshirt, put sunglasses on, and topped my hood with a furry, pink hat. My only wish is that I’d done something more interesting with the background. Towards the middle of the semester we began working on longer projects. This was the first. 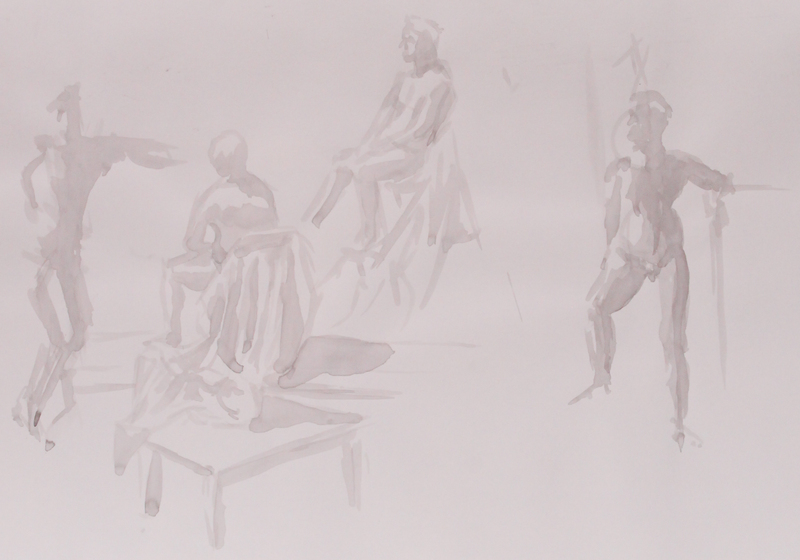 We painted two sketches from life and then painted a larger copy using only the sketches as reference. 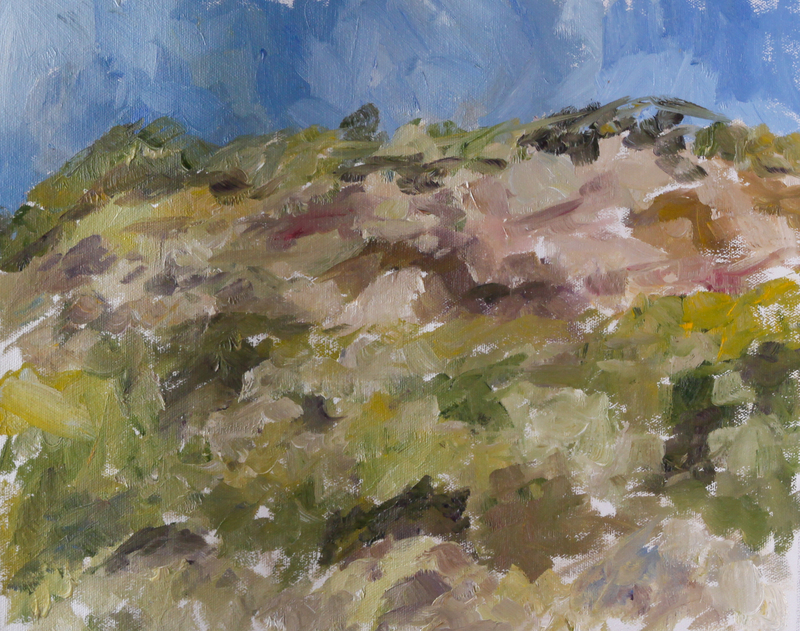 The final painting was a lot of fun and pulled me away from my impressionistic tendencies.See, when I paint from a different perspective or with a different method I always wind up taking something away from it. I learn a lot that way. 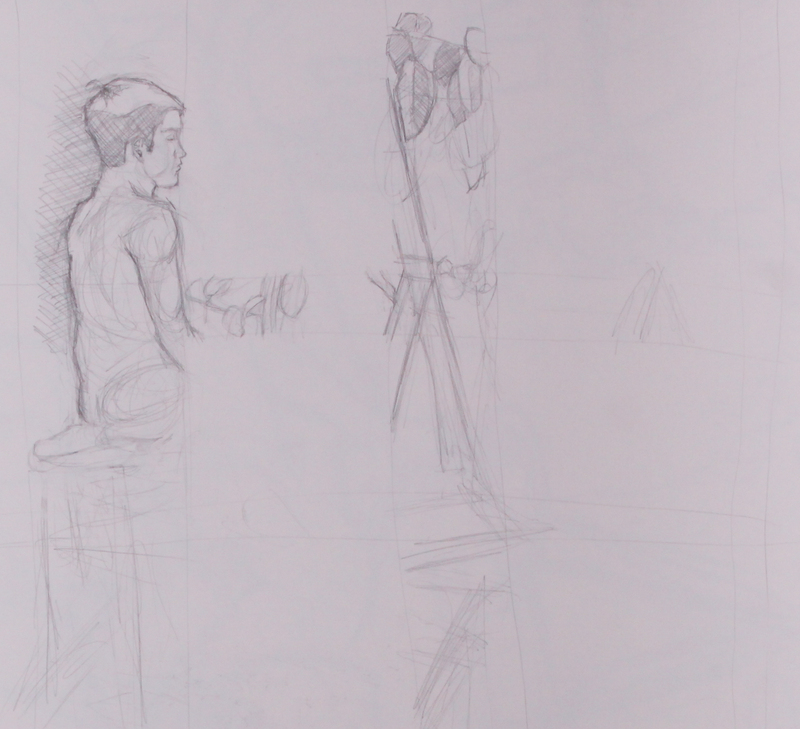 The above method (working from sketches) forced me to concentrate on composition. 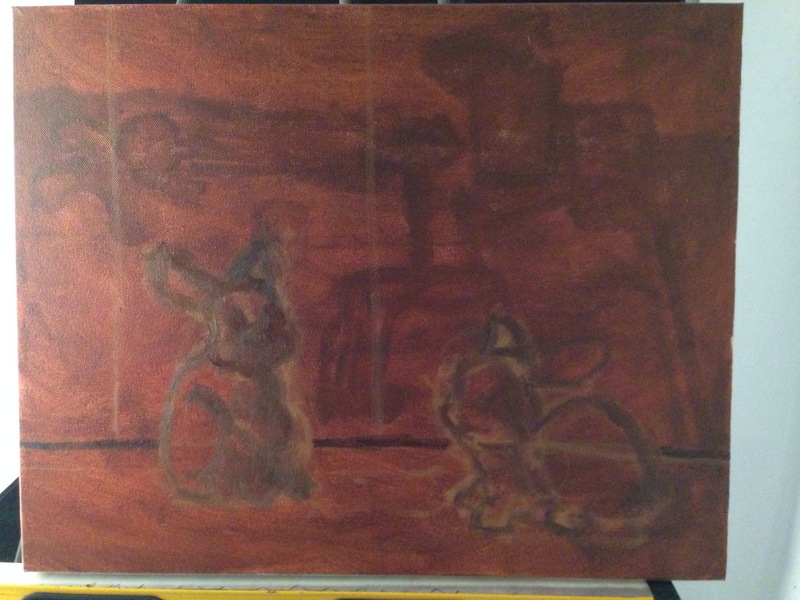 Here was the first time that I felt what it was like to paint over a thick, dried layer of paint. 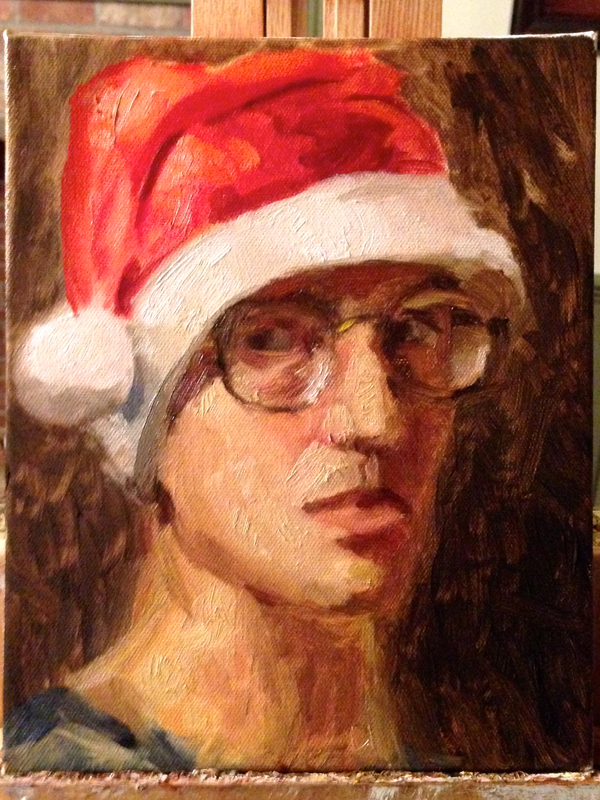 Before this, we had mostly worked alla prima, or all at once. 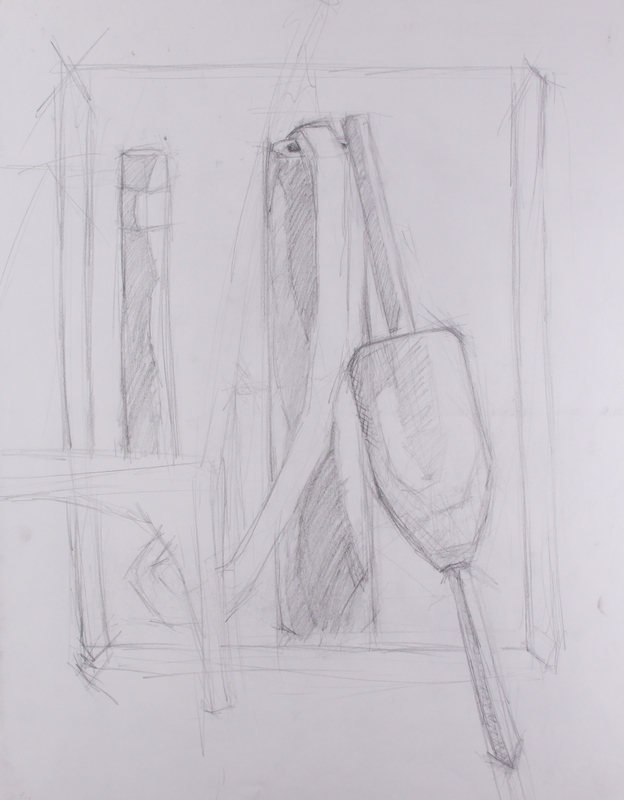 This exercise required us to focus in on a specific section of a still-life and really work at that section. My cloth painting abilities improved drastically with this painting. 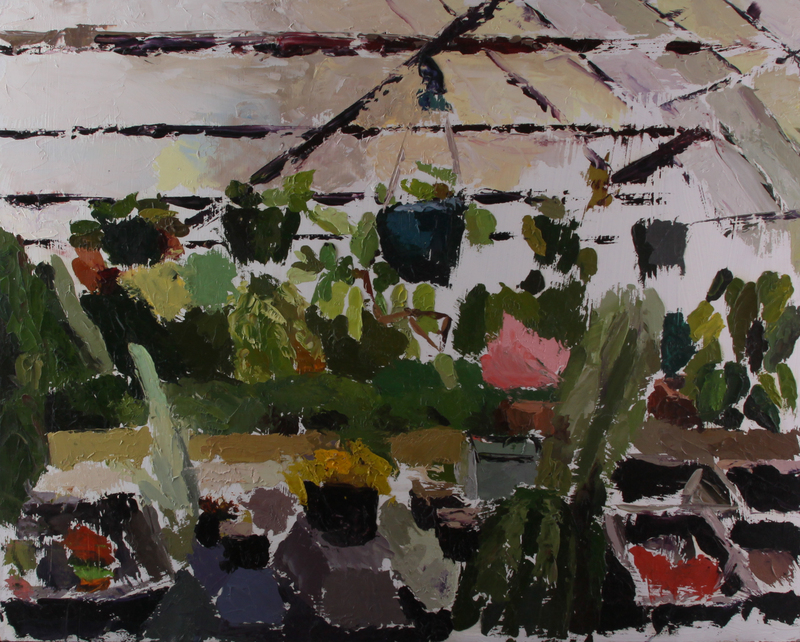 For one week we worked in the campus greenhouse. I struggled with this. There were too many greens to paint. 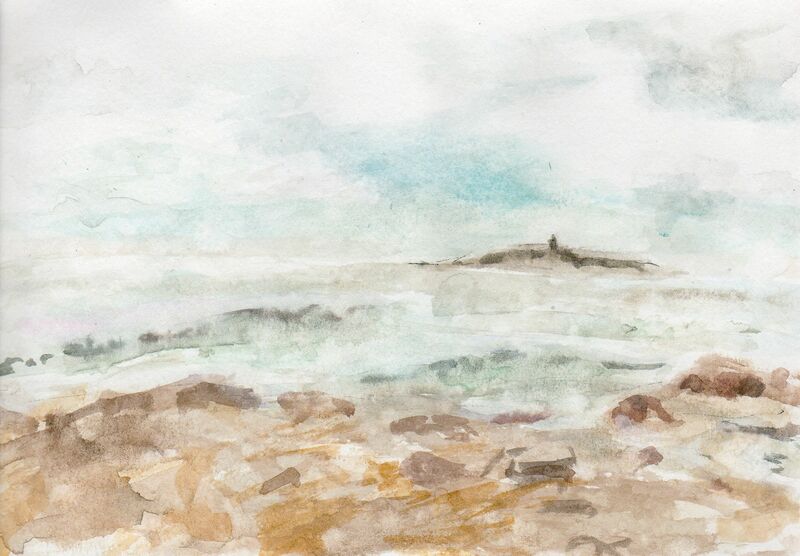 I still struggle with painting landscapes. That is something I need to practice. 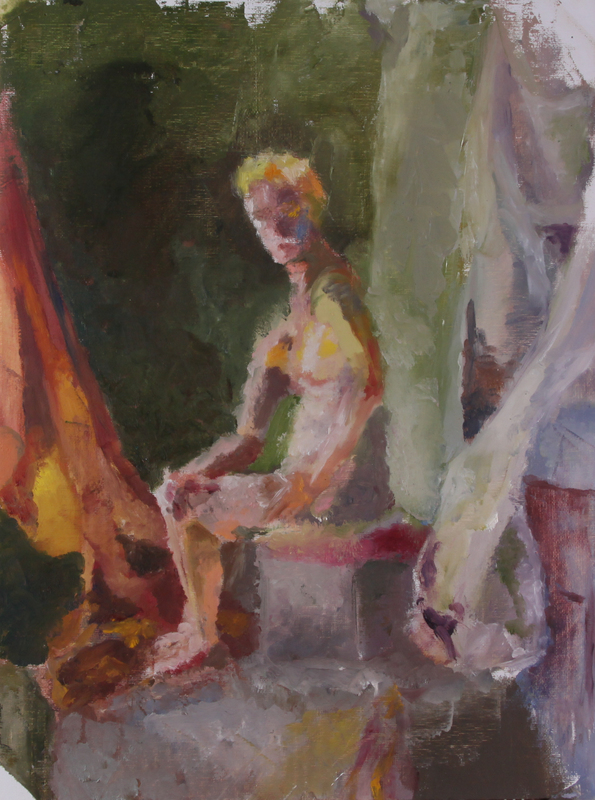 The last painting in Intermediate Painting was a 2-3 week figure study. 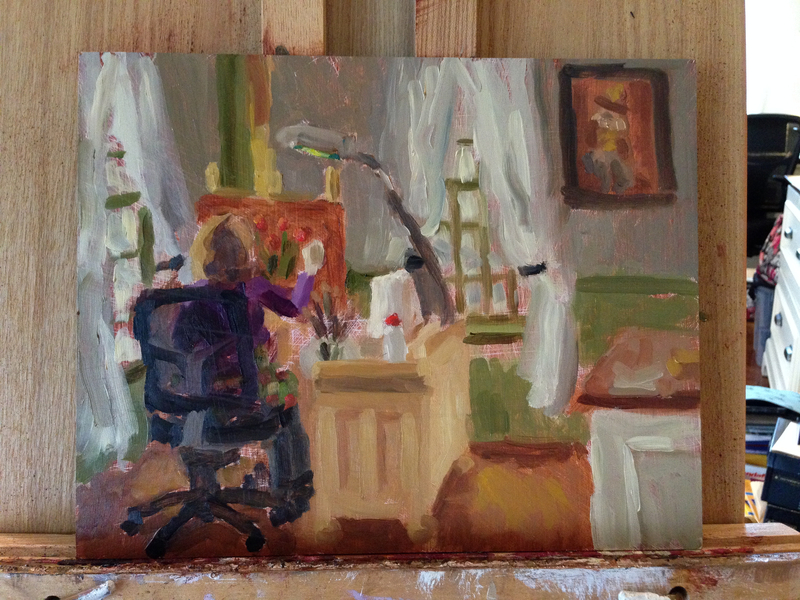 I found myself with one of the last easels and was forced to paint this perspective. 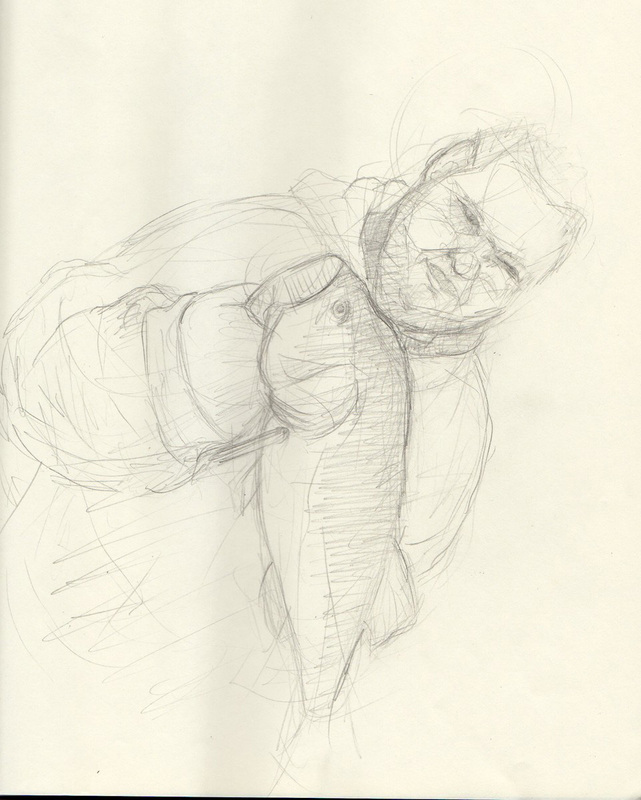 It grew on me and gave me a chance to practice foreshortening. See how crazy and colorful this setup is? That’s a Rick Fox setup. The first month of the summer was spent waiting to travel to Italy. 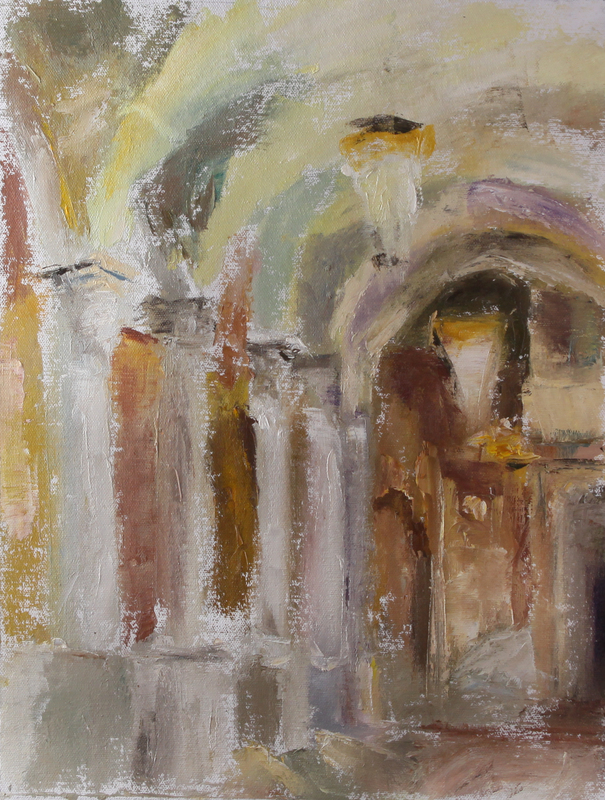 I had signed up for a summer painting semester with UNH in Ascoli Piceno. I was incredibly excited. 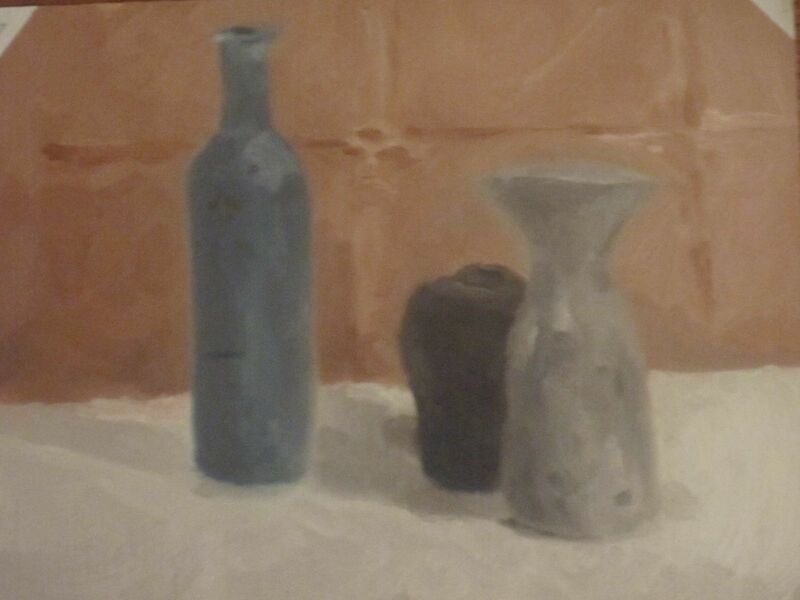 To keep myself busy I built a still-life to paint. The bust is a sculpture I made during my Figure Sculpting class. I think I did well with the composition and colors. Looking at this now, I think I’d like to revisit the same composition. Though maybe with a different bust. 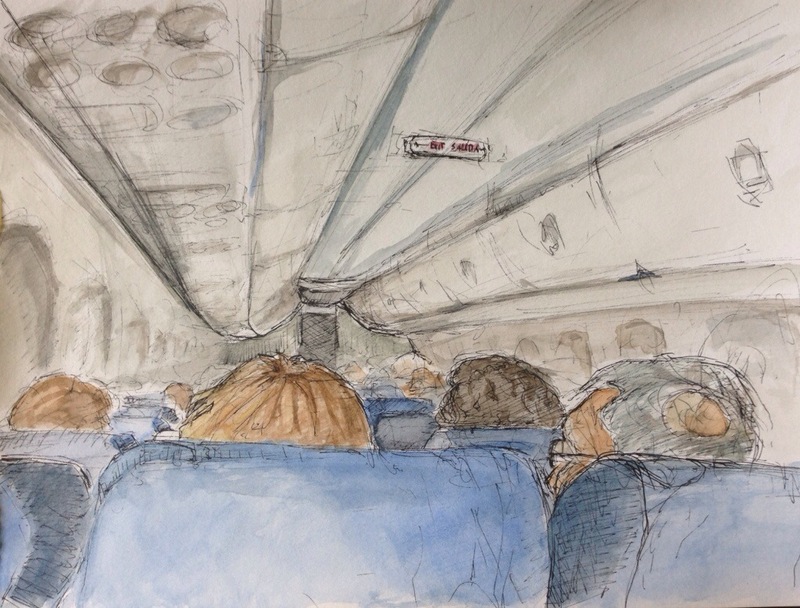 We arrived in Rome after an all-nighter and a short layover in Zurich. We then took a 3 hour bus ride to the opposite coast. Bleary eyed, we stumbled into our Ascoli Piceno apartment in the late afternoon. After unpacking, we met up with our professors Grant Drumheller and Scott Schnepf and had some pizza. It was all bang bang. That first day seemed to be a non-stop series of events. The next night we got our easels and it was time to paint. 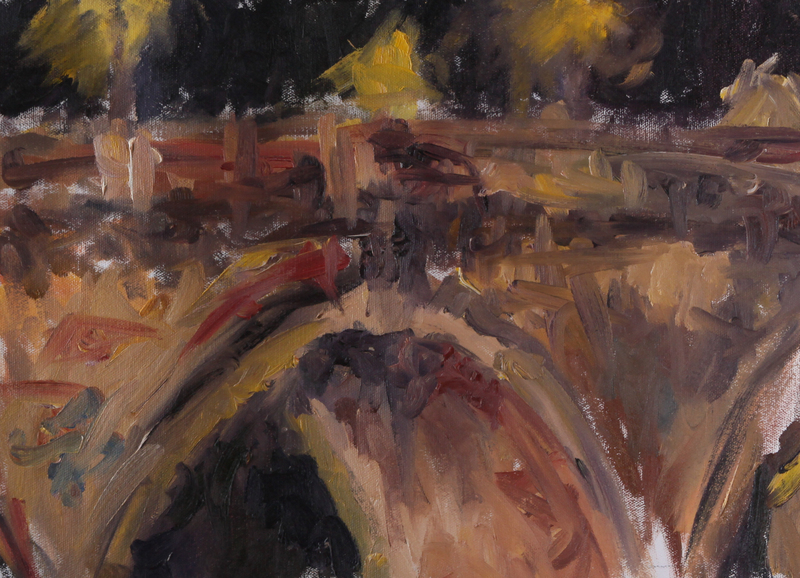 With a 66cl Birra Moretti and my easel I wandered onto the Ponte Sant’Antoni, from which I had a great view of the Ponte Nuovo. I could see some of my classmates milling around up on the bridge. 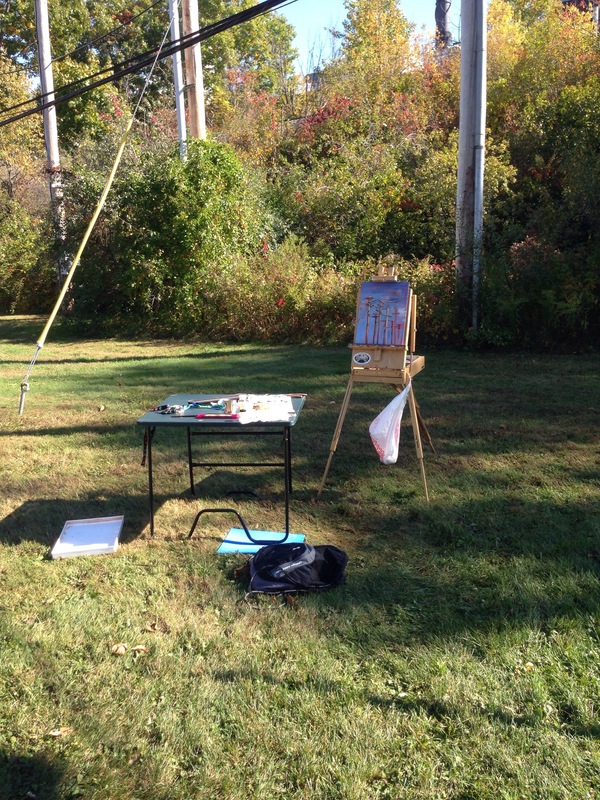 I liked the view and popped open my easel. I felt like Van Gogh as I painted the Ponte Nuovo street lamps. However, I struggled to see my palette. I was underneath a street lamp myself, but there was just not enough light. 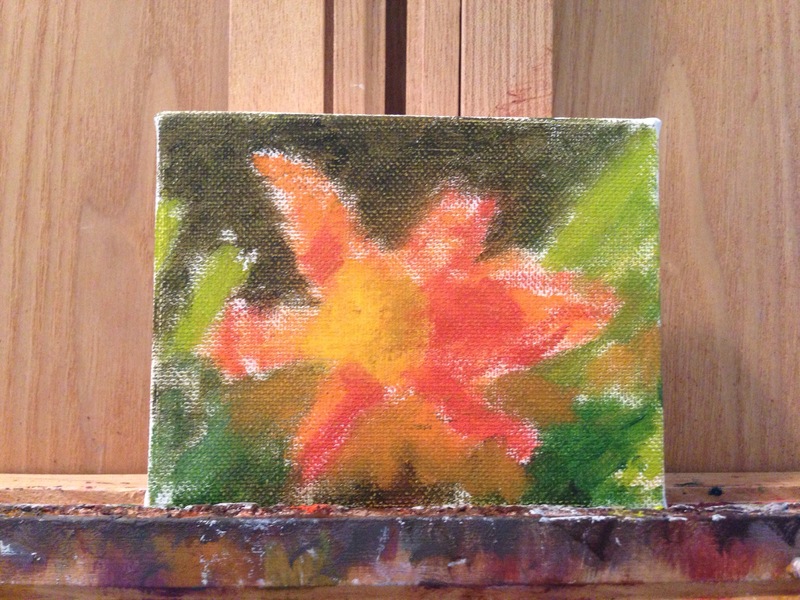 I wound up painting with highly saturated colors just to be able to see what I was painting. As I was wrapping up, several cars whizzed by with people hanging out the windows and screaming, “Italia! Italia!” I later learned that Italy had just beat Germany to proceed to the final round of the Euro Cup. The next painting session was more guided. Our professors led us to a city overlook that gave us a good view of the surrounding farmland. 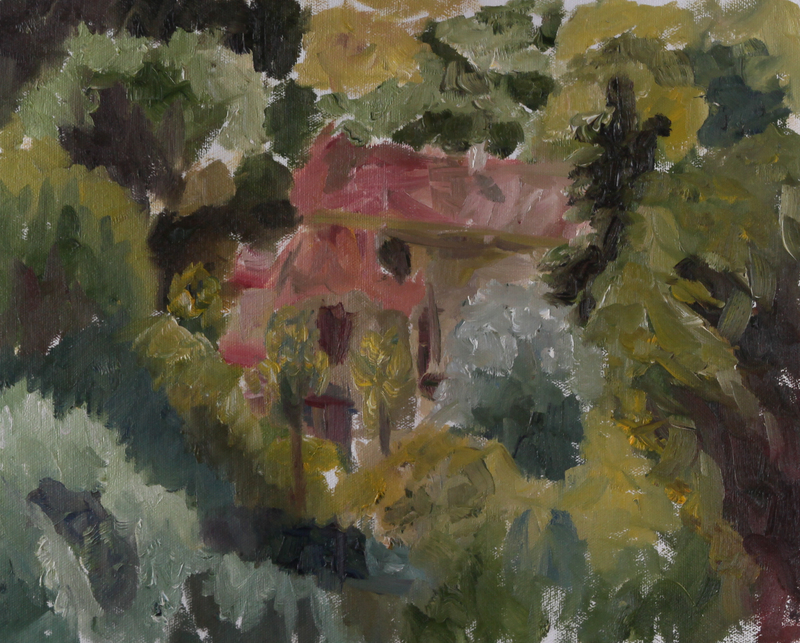 I painted a house I saw nestled in a farm of olive trees. It was hard. I spent a lot of time scratching my head. I didn’t know how to work with all the greens. I still struggle with that. And it’s a byproduct of the UNH classes. We did not do a lot of painting outside. 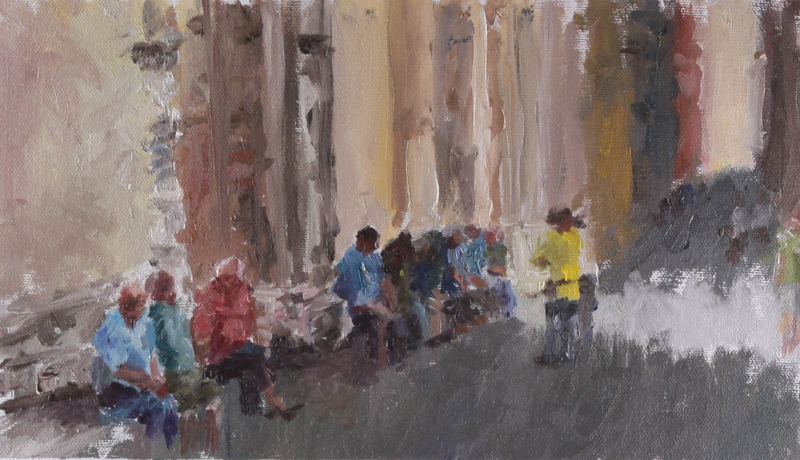 The Italy trip was the first time I received plein air guidance. 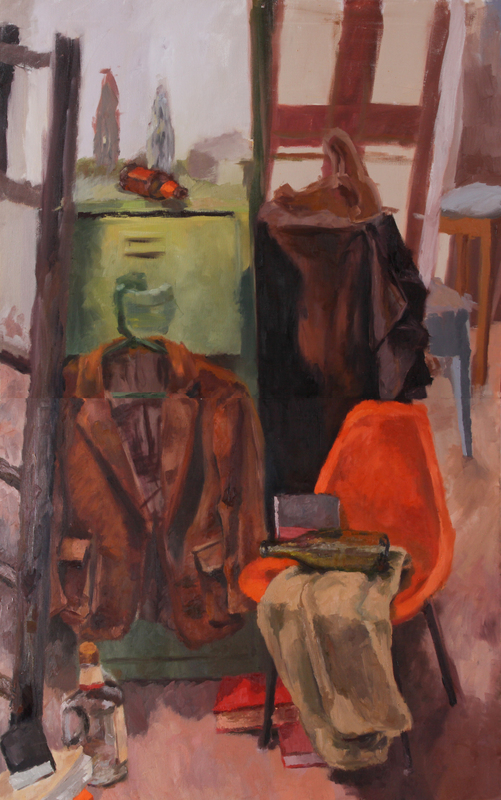 If you look at this painting, you’ll see that I tried to establish the lights and the darks, but there’s just no connection between the two. The values don’t form into recognizable shapes. There are no trees, bushes, or grass. There are just blobs. I continued to struggle with landscapes throughout the Italy trip, so when given the chance I painted industrial subjects. 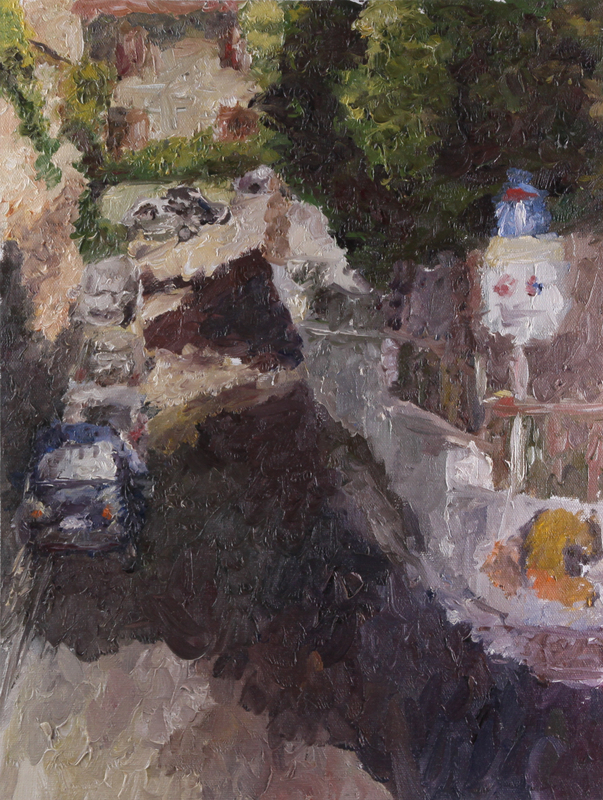 When I got fed up with the olive trees, I scooched my easel around and painted the street behind me. I liked the golden graffiti letters and the row of cars bending up and around the corner. 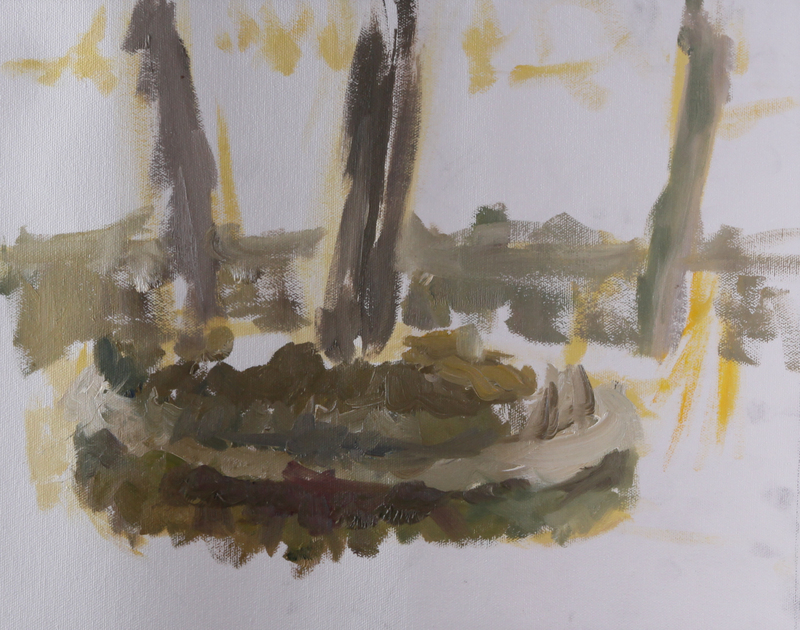 I painted quickly and the result may be a little incomprehensible to the casual observer. 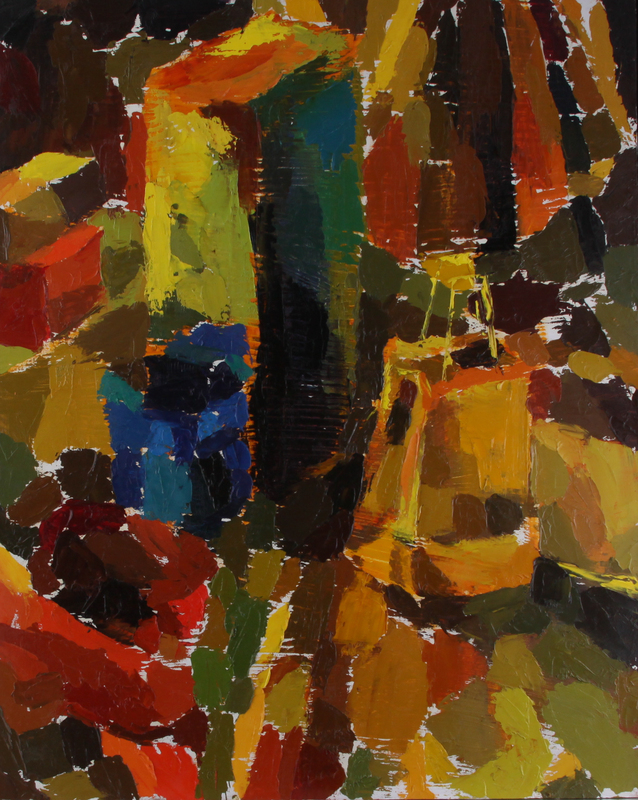 But when I look at this painting, I can see the street in my mind. Which makes me wonder if painting helps improve memory. You stand and you stare and you stare and you copy down what you see. It’s visual memorization. To the right of the street with the cars was an elevated flower bed. I was excited to paint it, but then our session ended. It was time to go back to the apartment and escape the 100 degree heat with a nap. Our next organized outing was to a swimming hole on the Castellano river. I was overwhelmed by the beautiful blue water and the golden river bed. I wasn’t sure what to paint. 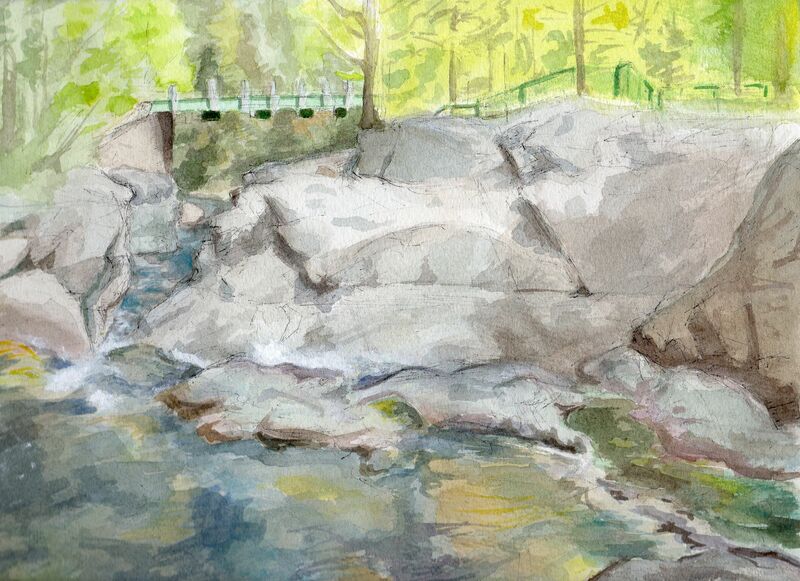 I decided to get some landscape practice and paint the riverbank. It was steep with alternating bands of rock and vegetation. I think the painting would have been a great base for a longer session. But it was hot and I wanted to get my toes in the water. I set my easel up in the middle of the Castellano. I found a raised sand bar that offered a good view downstream of the Ponte di Porta Cartara. The brown band across the middle was a walking bridge. 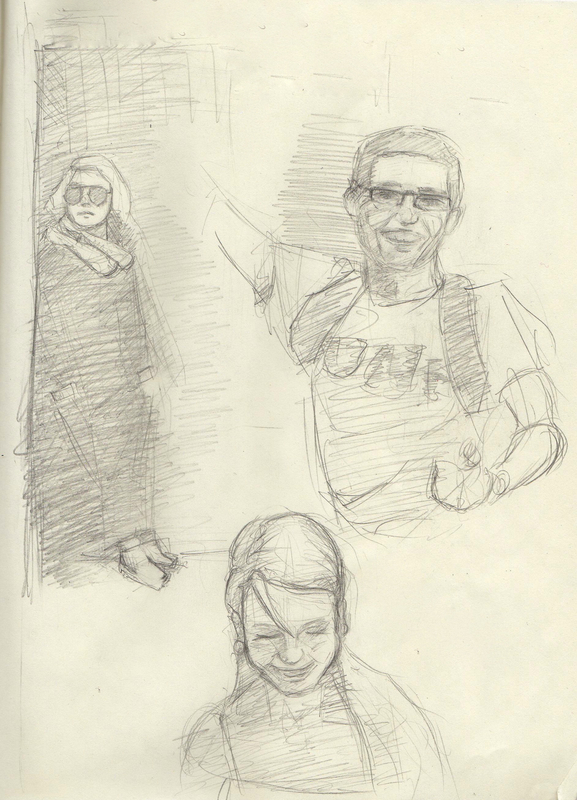 The figure in the bottom right was my classmate and roommate, George. I wish I could go back to the spot now and do it better justice. After two guided sessions of painting, we were let loose in the city. I wandered around until I saw a huge statue in the distance, off and above some apartment buildings. It looked like a smaller version of Christ the Redeemer in Rio de Janeiro. I couldn’t pass up an opportunity to paint it. He seemed to understand. Then he started listing off words and I realized he was trying to find out my nationality. I told him, “Inglese.” A nod. A look to his wife. A few words between them. “Inglese,” he said. Like he was pondering it. I shrugged. And he smiled. “Blue. Blue,” he said and pointed at the shadows of my painting. I nodded. He wanted me to use more blue in my shadows. And I knew I should’ve. But I was a little stubborn at the time and wanted to reach that decision on my own. Plus, we were told that every Italian is an art critic. I smiled and nodded vigorously. “Blue,” he said. I nodded and he smiled as well. Our communication successful, he reached into his pocket and pulled out a fat wallet, from which he drew a business card. His wrinkled hand shaking, he handed it over to me. There was his name. And underneath it read, “Scultore.” He was a sculptor. I used a lot more blue in my shadows after that. Ascoli Piceno is surrounded on three sides by mountains. This was a view of the Gran Sasso and the fields beneath it. 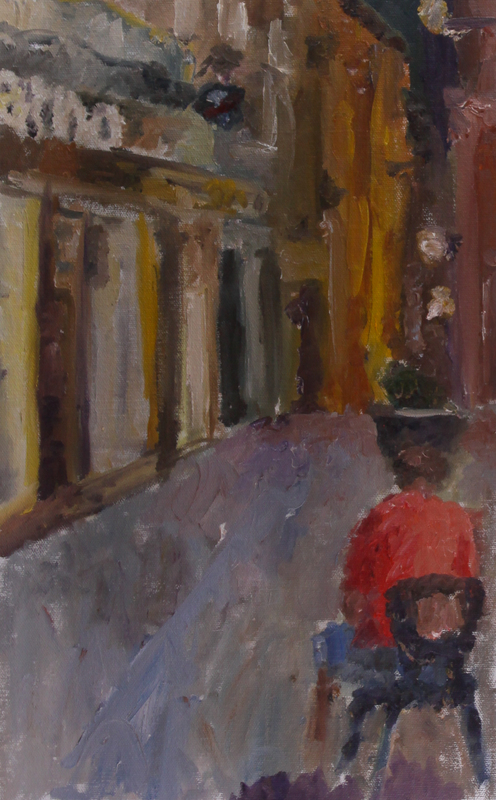 Inspired by the art in the local museum and the general feel of Italy, I took to the streets one night to paint the Piazza del Popolo. For some reason, I decided to work with a knife. I must’ve been inspired by some of my knife using classmates. Someone mentioned they liked my sketch of the street with graffiti, so I made my way back to that spot in order to paint a more refined version. 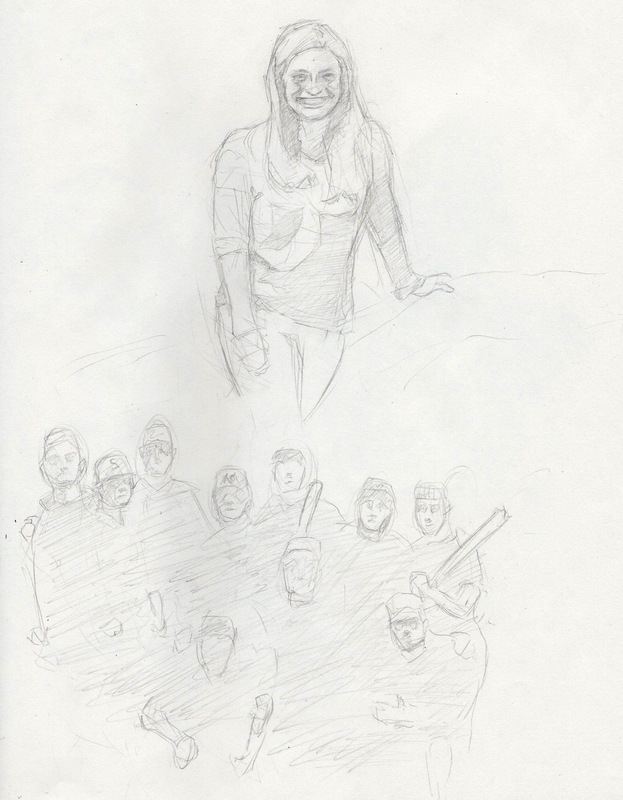 One of our assignments was to go to two locations and paint a large crowd of people. One location had to be done with knife. The other one with brush. 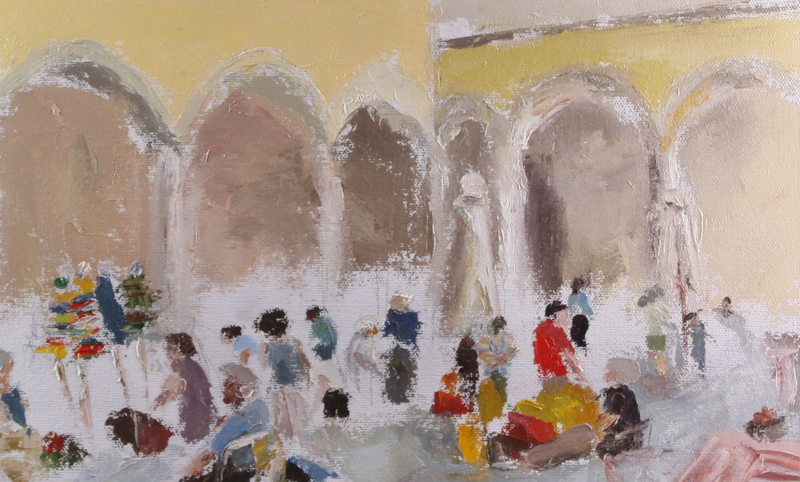 This painting is of the daily farmer’s market. It was done with knife. This is the second painting. It’s a bunch of old men sitting on a bench outside a church. I worked on this painting on and off for several days. It’s the view from our apartment window. Our last full day in Ascoli I went on a painting spree. 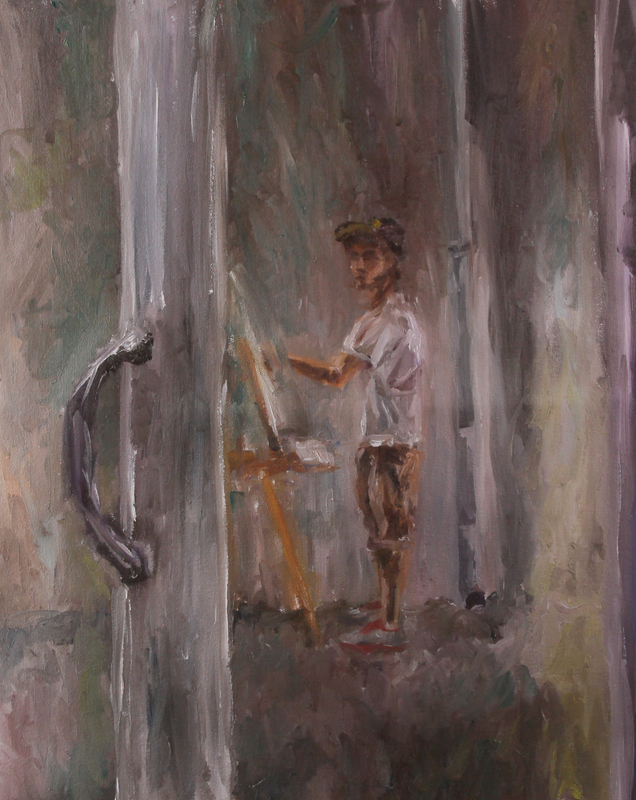 I painted this self-portrait in a reflective sliding door. Then I painted the alleyway entrance to our apartment. The face was a larger-than-life wall advertisement. At the end of the day I painted a night scene outside a gelato shop. Then we packed our bags and we went on a whirlwind tour of northern Italy before finally catching a flight in Venice to take us home. I have fond memories of my time there. I learned a lot. It was the first time I painted every day for weeks on end. I would kill to go back and do it all again. Back in the US and back at UNH I started my senior year of college. 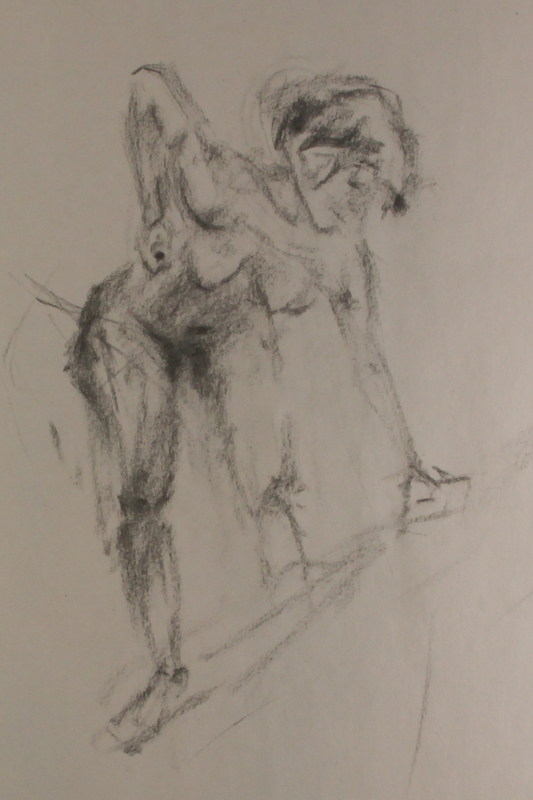 I took two art classes the fall semester: Life Drawing and Advanced Painting. 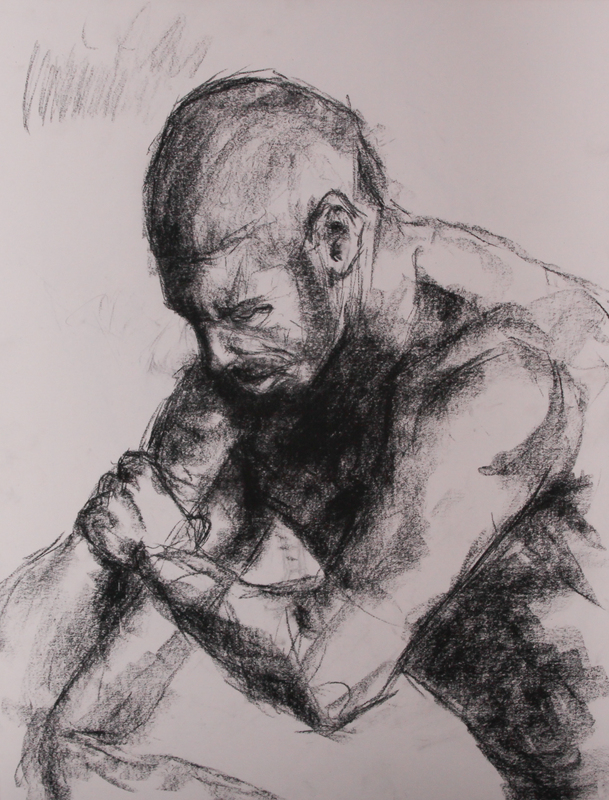 For Life Drawing I once again had Grant Drumheller. 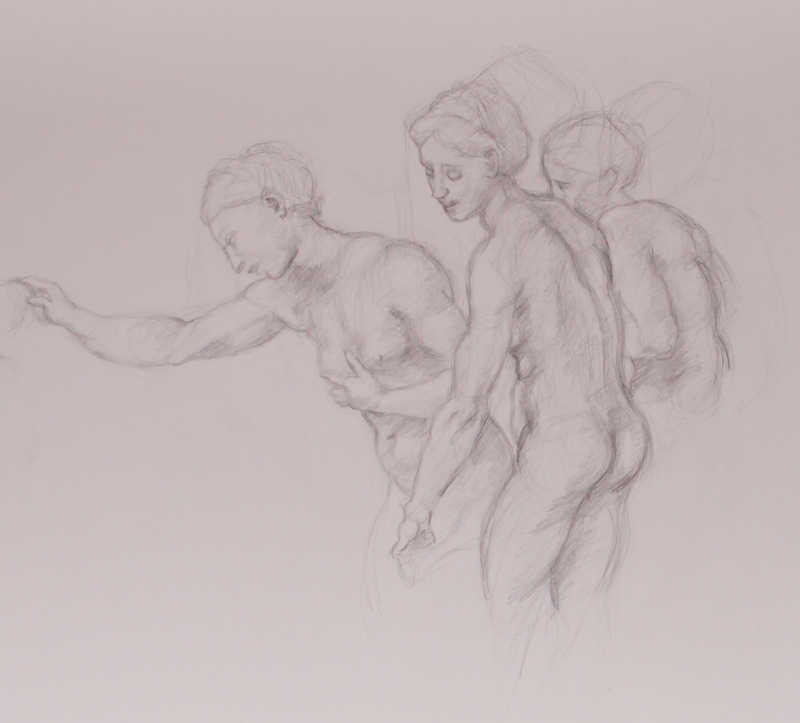 The first assignment was a study of Raphael’s study for “The Three Graces.” I had to do it in pencil because I’d misplaced my charcoal. 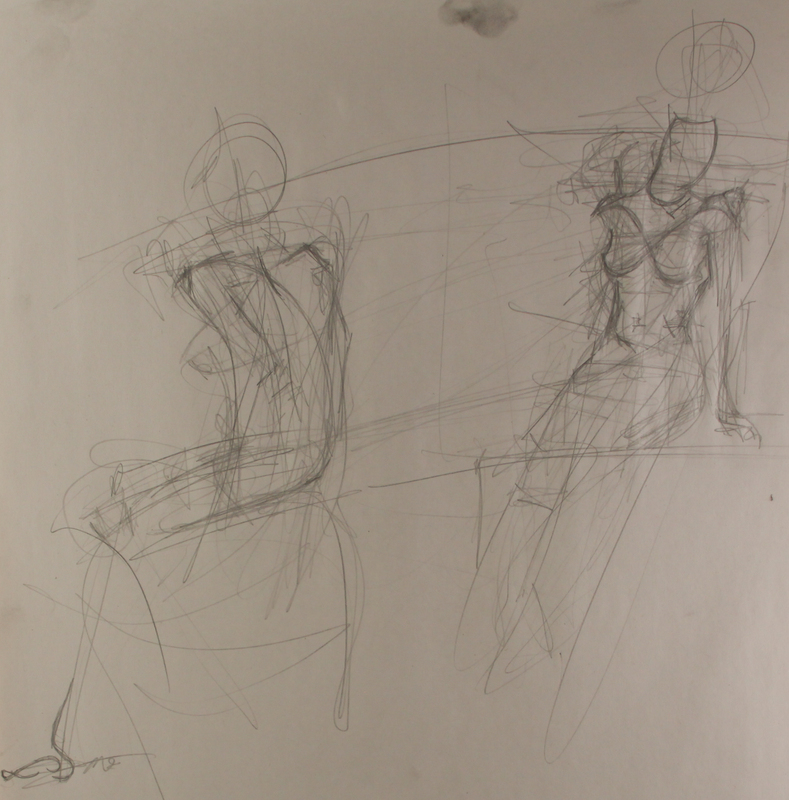 Then it was on to figure drawing! 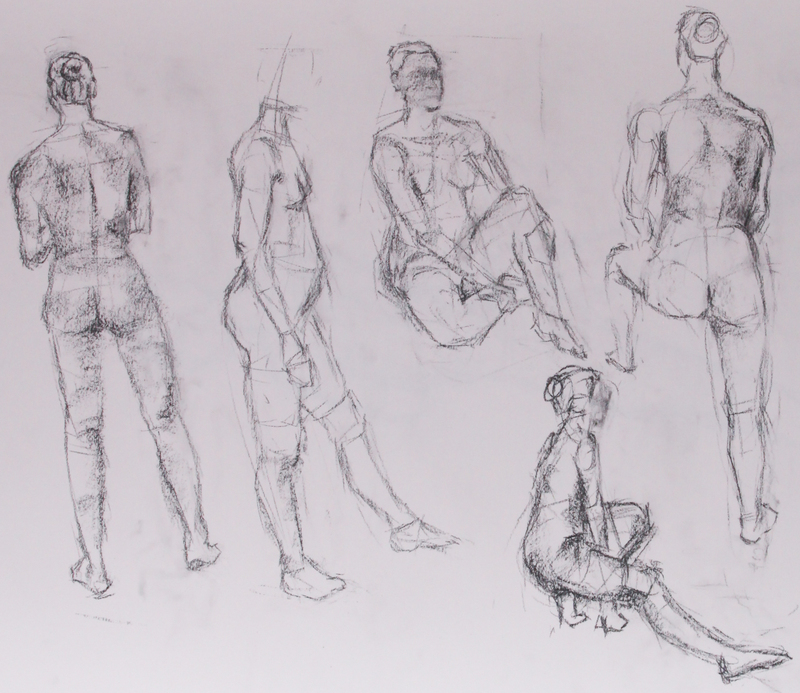 In these drawings you can see how I began to fully embrace my graphic drawing style. Lines on the outside, value on the inside. 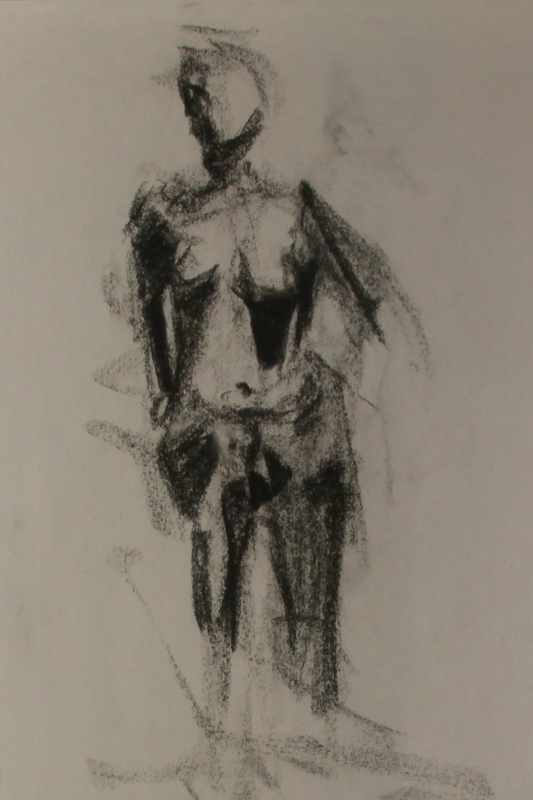 This drawing shows how I now think of the body in divisible segments. Though I like the style I had at this time, it could’ve benefited from more rounded edges. All the angles feel slightly unnatural. 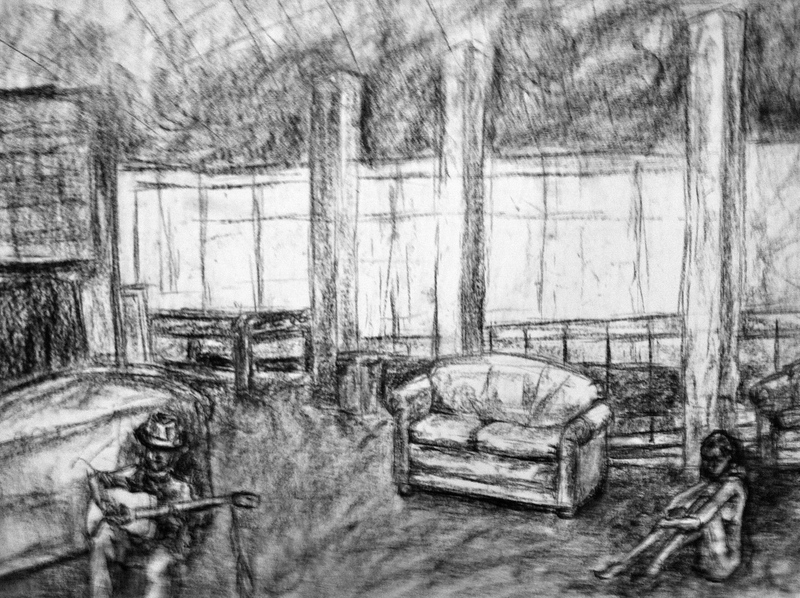 Like the cross-section assignment in Professor Fox’s class, here we had to sketch out lines and draw only what we saw within those lines. Sometimes I have to man up and show my mistakes. This is one ugly drawing though. Ooh. This drawing. Another favorite. Look at the “S” in that back. It’s got some nice curve to it. Though I might’ve elongated it too much. 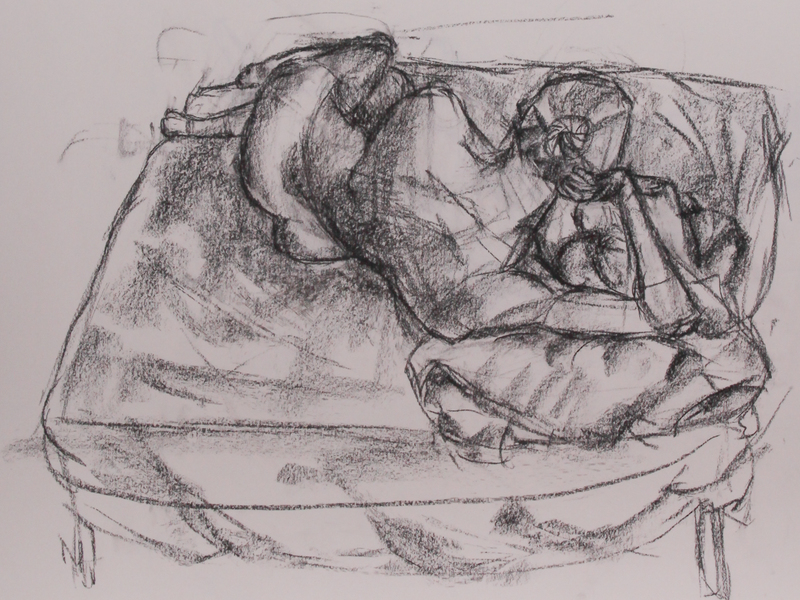 For homework we had to draw a figure in a scrunched position. 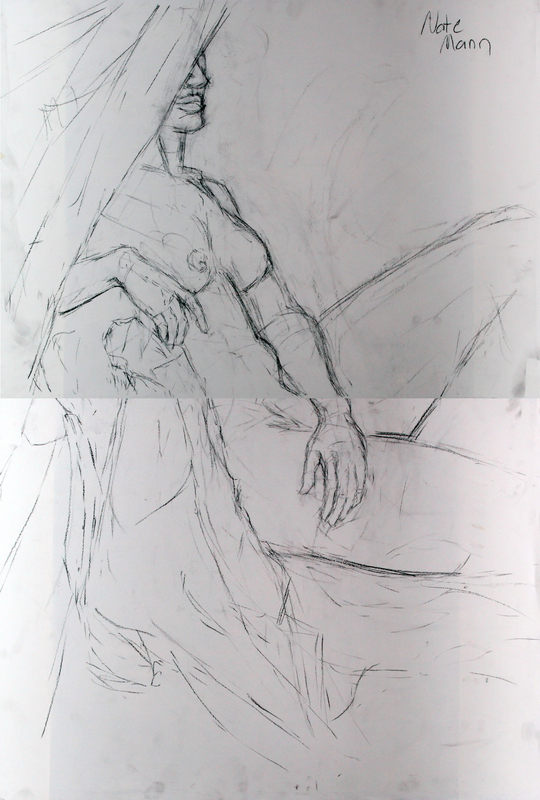 I found a reference on deviantart and used two sheets to bring the figure close to life size. My only gripe? The feet are too small. And I wouldn’t’ve noticed it if Professor Drumheller hadn’t pointed it out. Now it bugs me. At this point we began experimenting with ink. 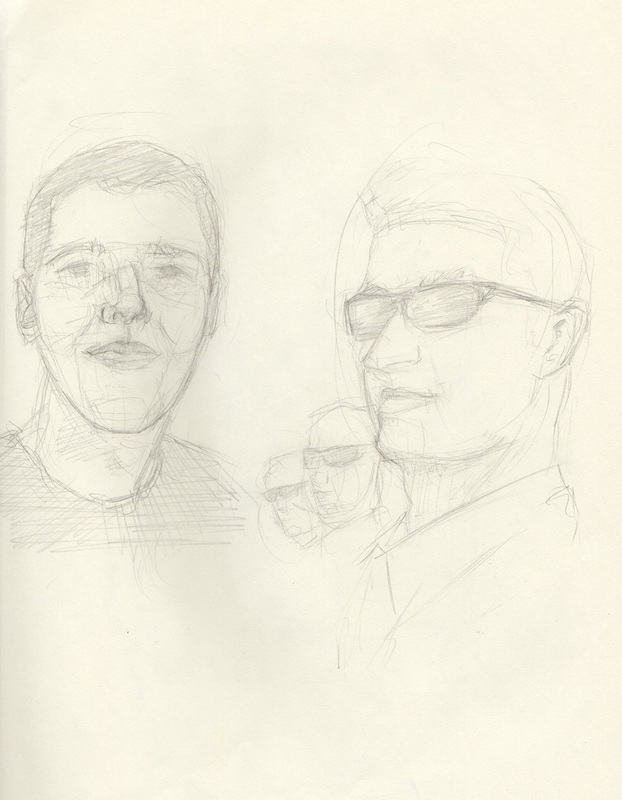 Ah, the double self-portrait. 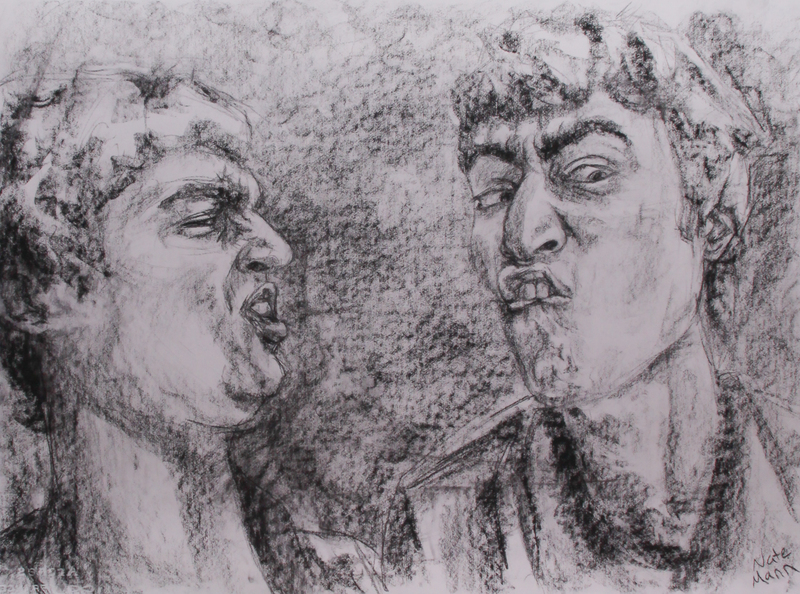 The assignment was to draw a severe facial expression. I drew two because I had so much fun. 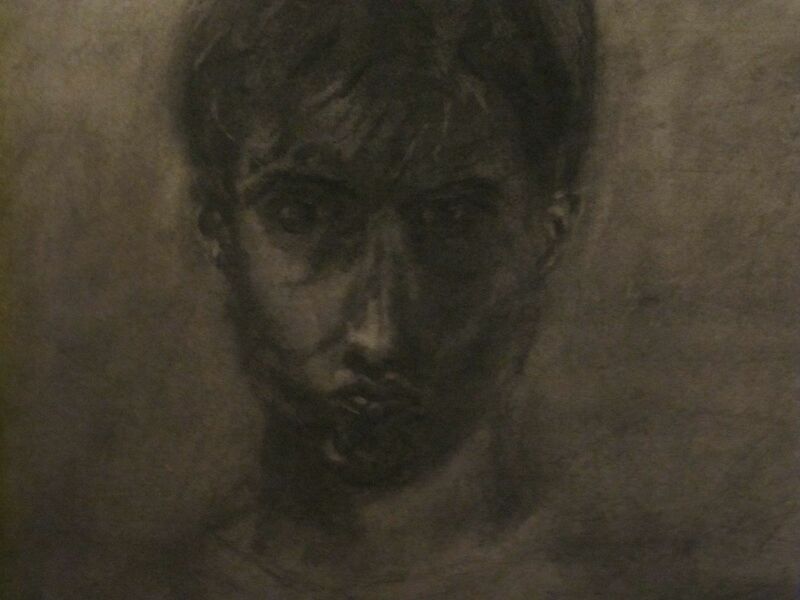 Compare this drawing with my self portraits in Intro to Drawing. While at UNH my drawing ability improved the most of all my skills. It was easy to see that. Each time I went to class I saw things differently. I got better at analyzing the subjects. I suppose you could say I developed an “artist’s eye.” Though that sounds cheesy. 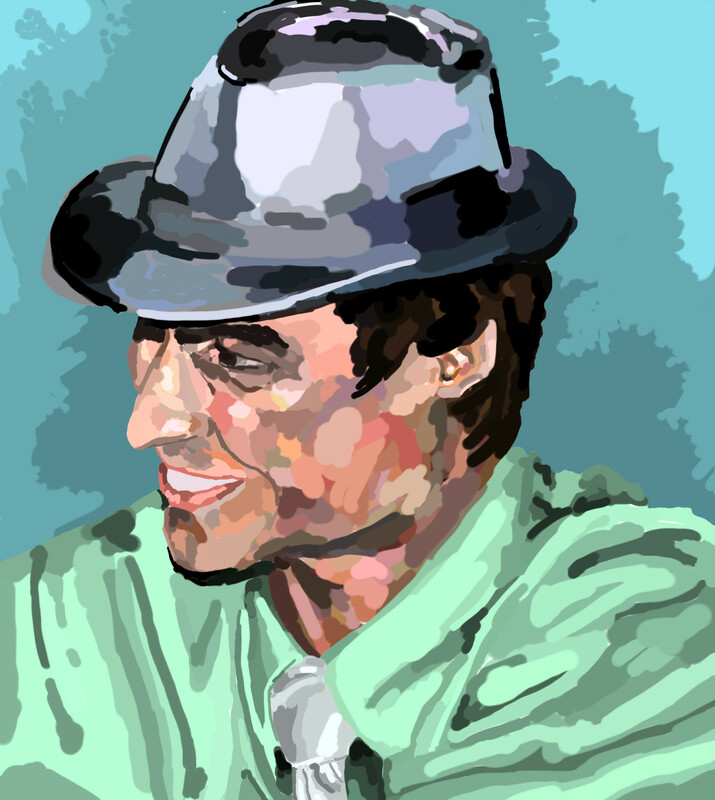 I improved in painting as well, however the improvements weren’t as noticeable. 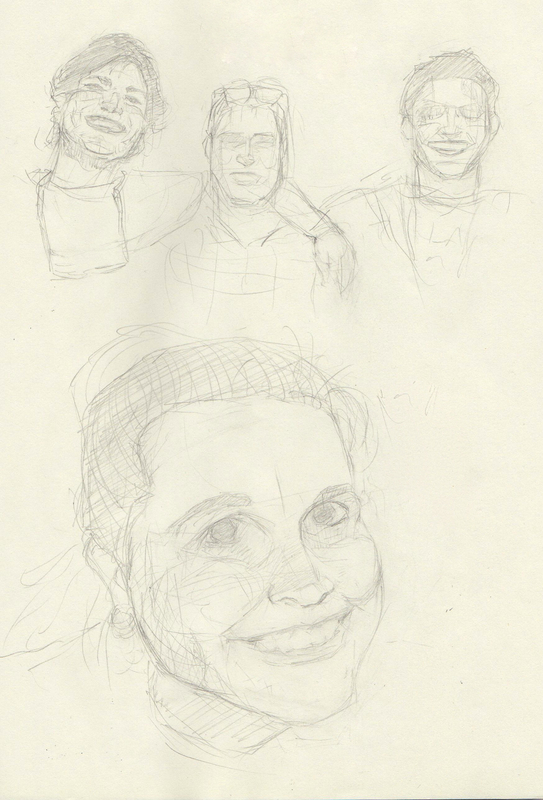 Right before starting the fall 2012 semester I did a quick self-portrait. 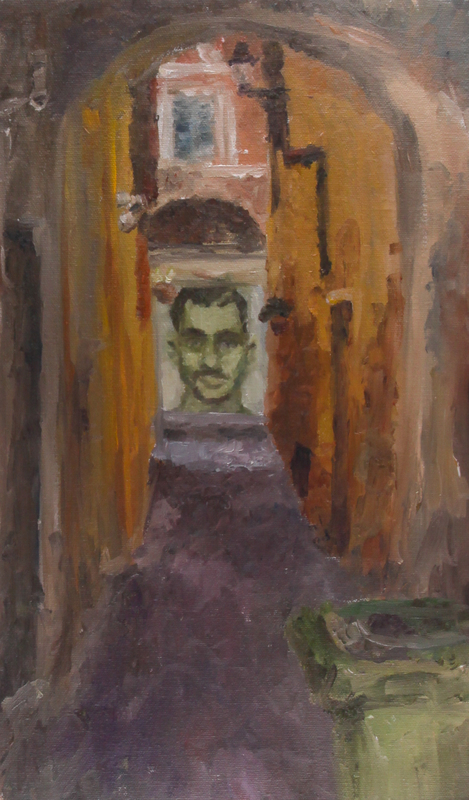 I’d been painting all summer in Italy but I hadn’t really painted a portrait in a while. I placed a large wall mirror in my lap and spent about four hours staring down into it. I should’ve included my shoulders in the composition. I look like I’m bodiless. Or like a worm. My color choice though, man, my color choice. It’s niiice. I don’t mind bragging about that. Look at the soft green reflected light on the right side. And the brown-red of the chin. I made some nice color choices with this. The perspective is pretty good too. That was hard to get. 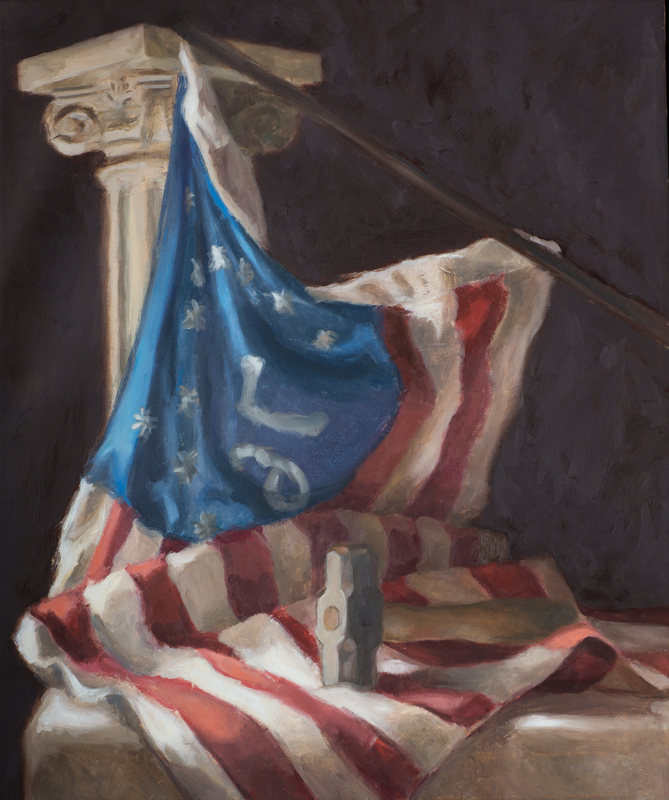 My professor for the first semester of Advanced Painting was Jennifer Moses. I’d never interacted with her before. Hadn’t even known she was a professor. 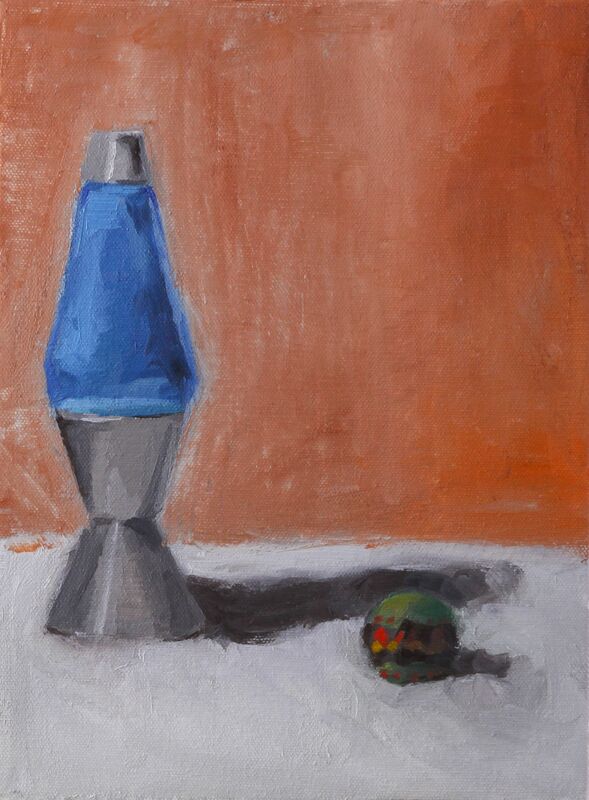 Her first homework assignment was this still life. I had to pump it out at night because I had no other time. 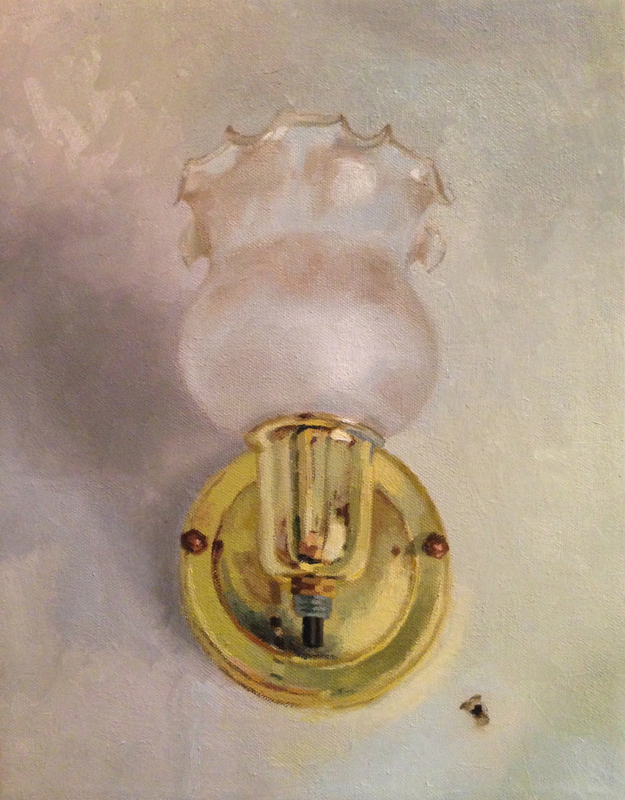 The harsh lamp light produced some thick shadows I enjoyed painting. It’s easier to make things realistic when the lights and the shadows are both evident. 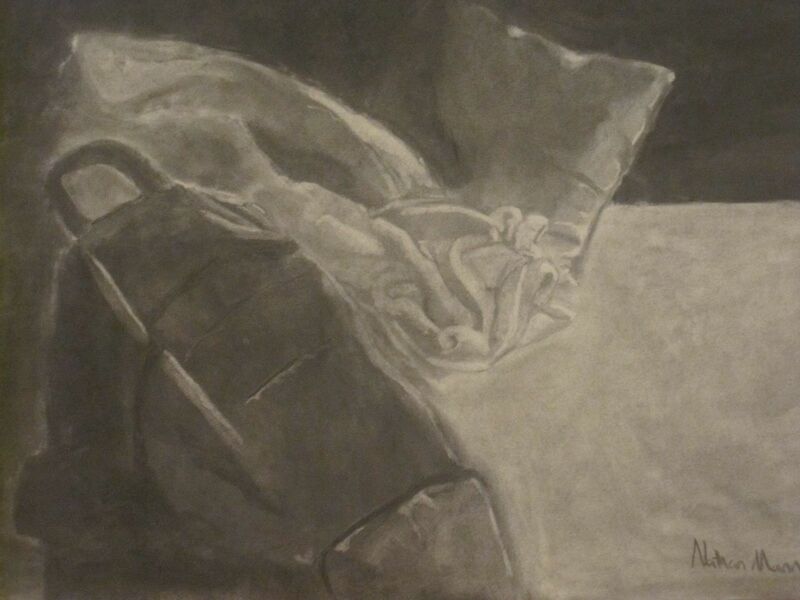 Second homework assignment was another still life. 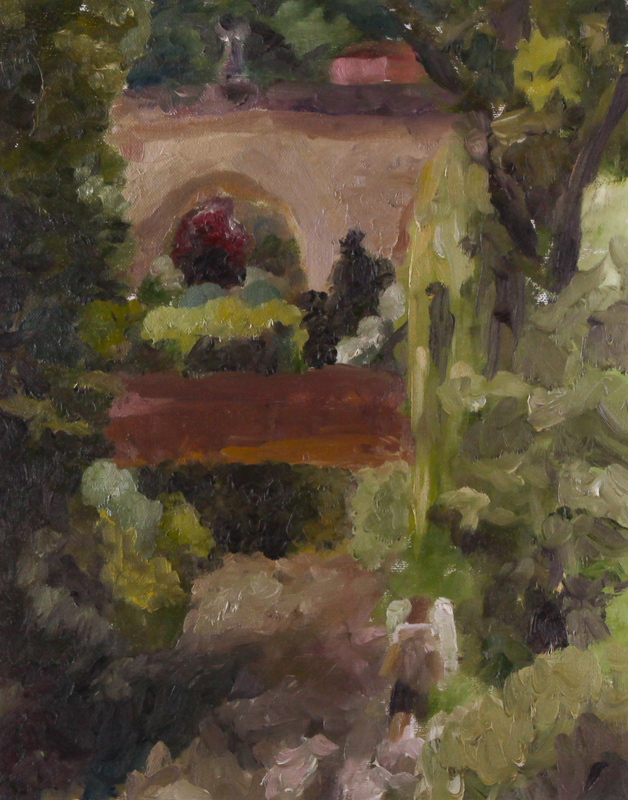 I pictured myself an impressionist at this point and used it as a personal excuse. “I don’t have to go into extreme detail. It’s impressionistic to stay vague.” I was so wrong about that. 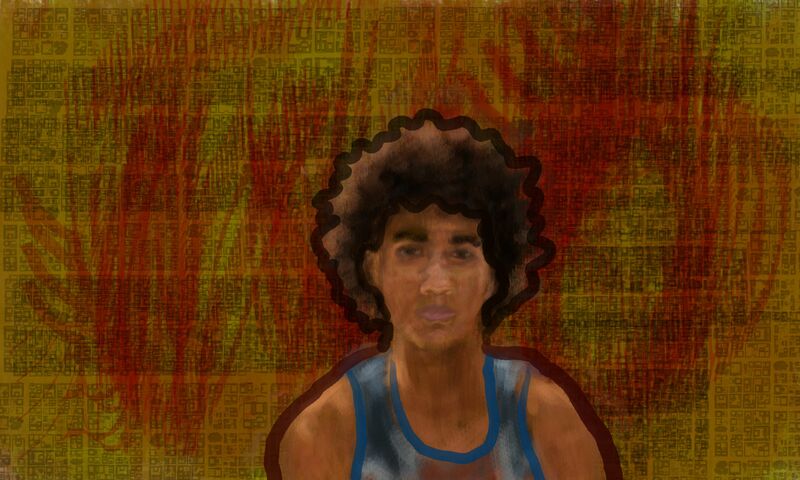 And it’s not that I was lazy, I just used impressionism as an excuse for my mistakes and inconsistencies. 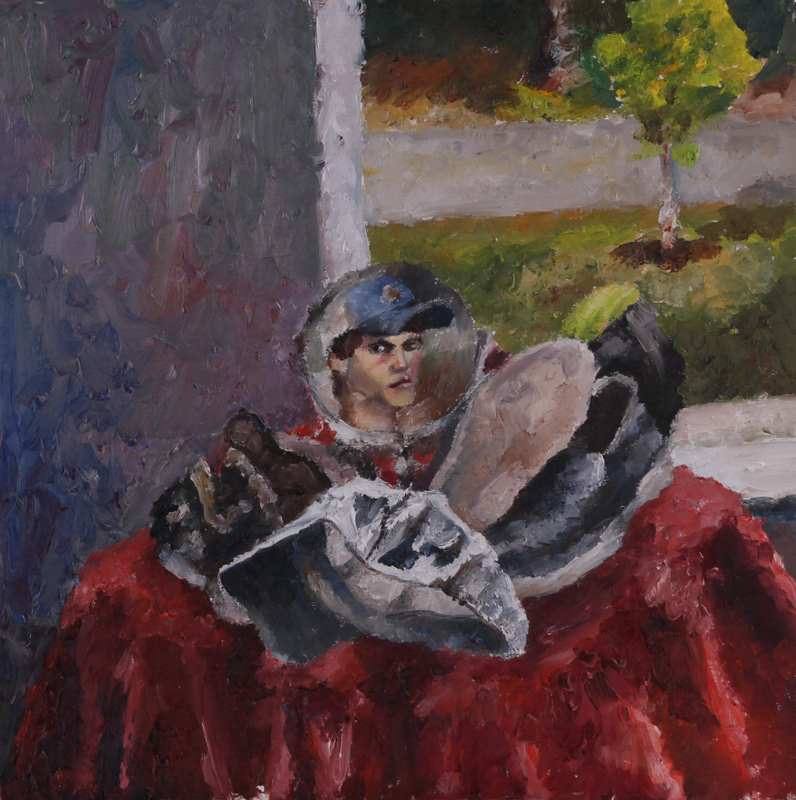 There are a lot of things I don’t like about this still life, but the main one is that the white hat in the foreground seems to hover. It has no shadow to pull it down and ground it. Also, that’s not the greatest self-portrait in the mirror. I look like I’m popping my jaw out and to the side. However, I do like the concept of the mirror in a pile of stuff. 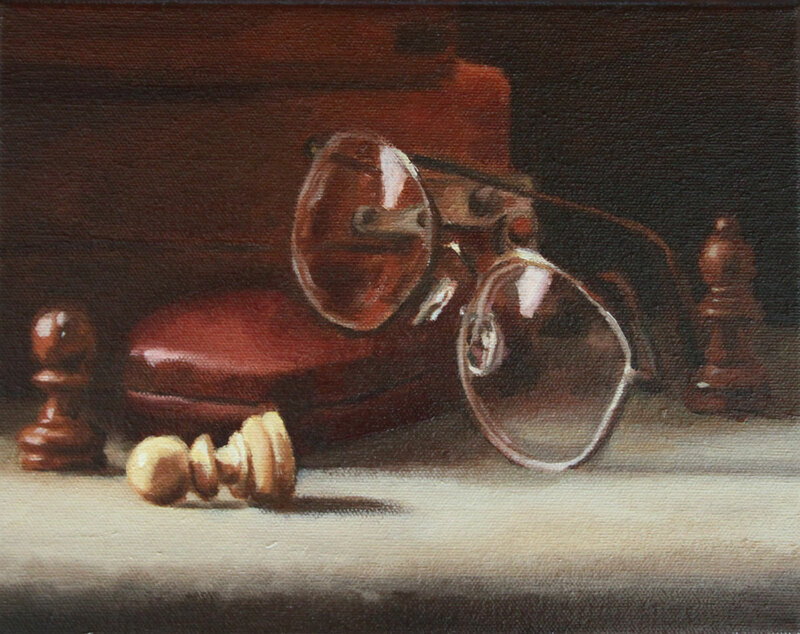 It elevates the composition from just a still-life. 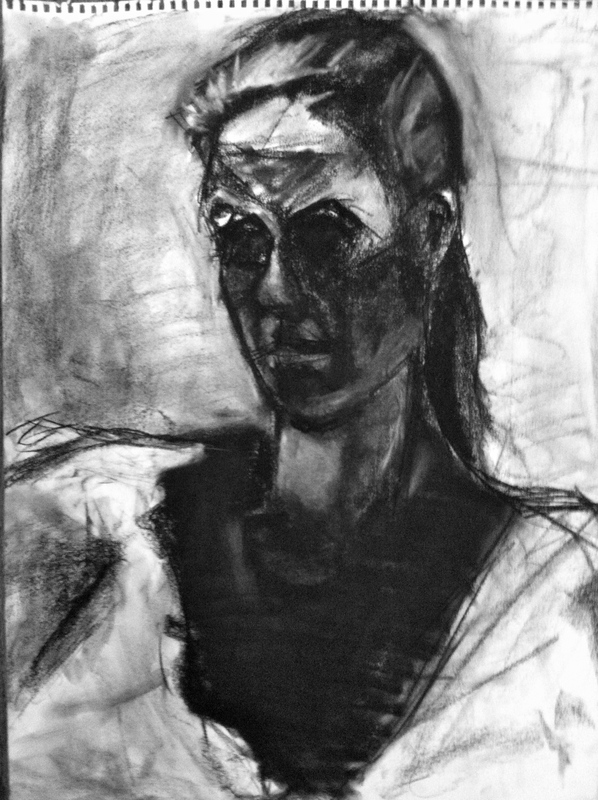 It adds portraiture and a human element to it. This painting and the next two were all done with the same setup, just different dates and models. I’m still not sure how I felt about that setup. 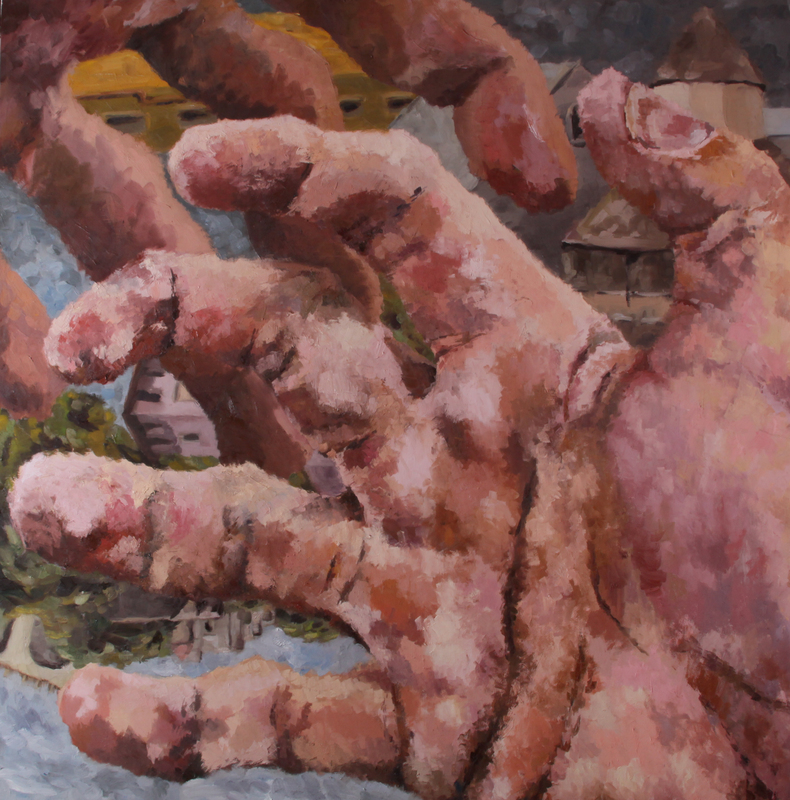 I remember being uncomfortable and unmotivated while working on these three paintings. 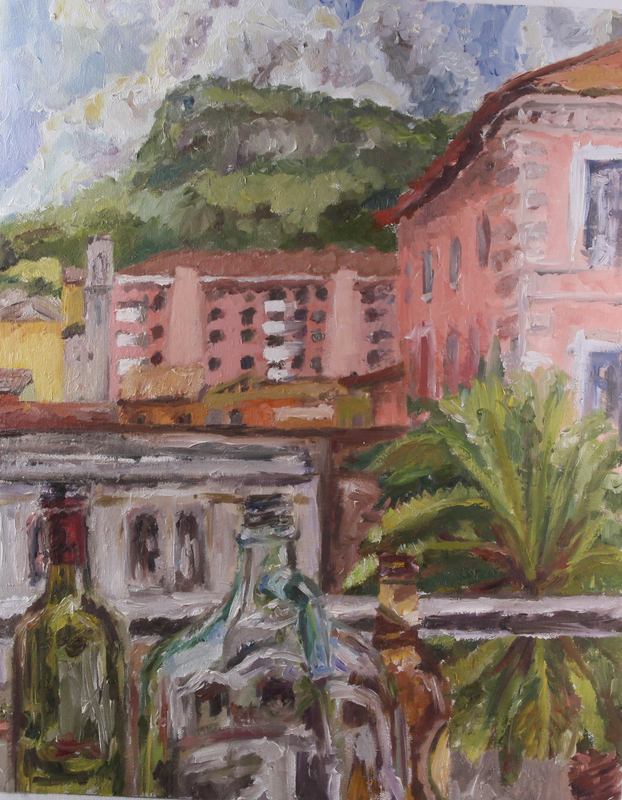 I loved painting the bottles on the windowsill in Italy, so when we were told to paint another still life for homework I revisited the same theme. 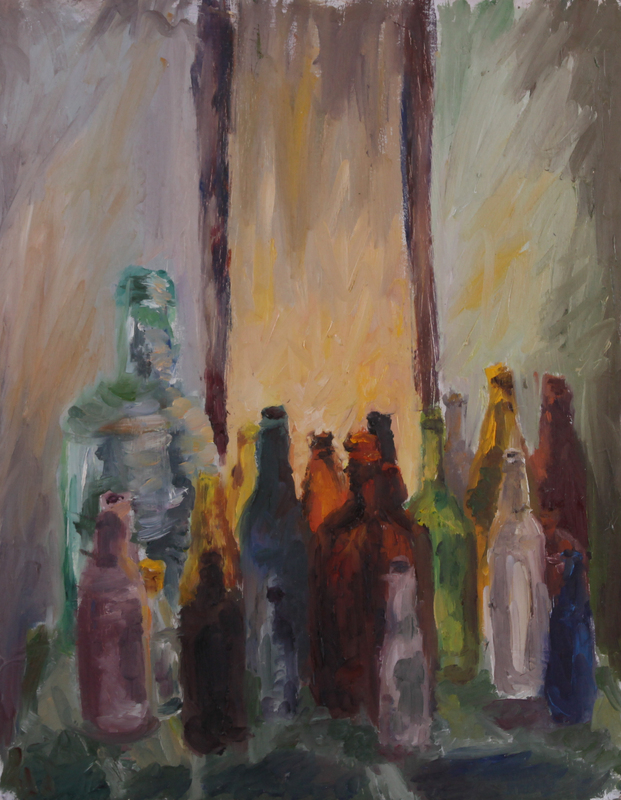 I placed the light behind the bottles, like I was painting a bar’s alcohol shelf. It illuminated a few bottles, but it did not have the glittering effect I’d hoped for. 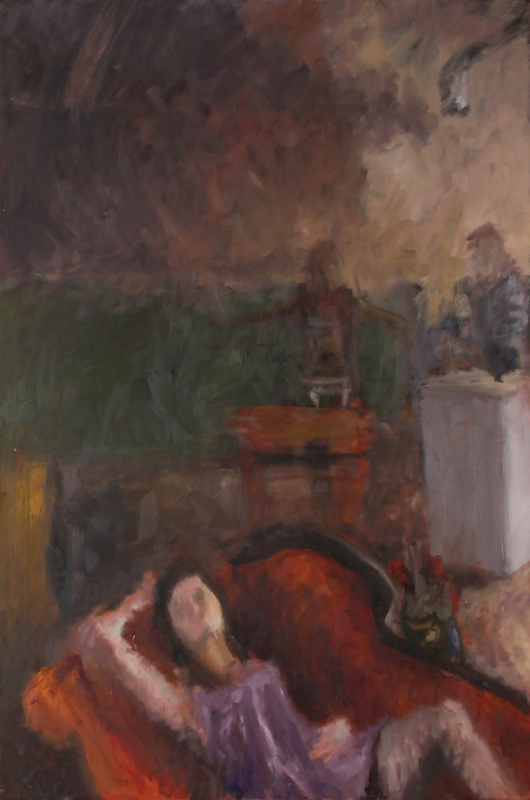 As I look back at all these paintings I keep saying I should revisit their themes. This is yet another painting I’d like to try over. 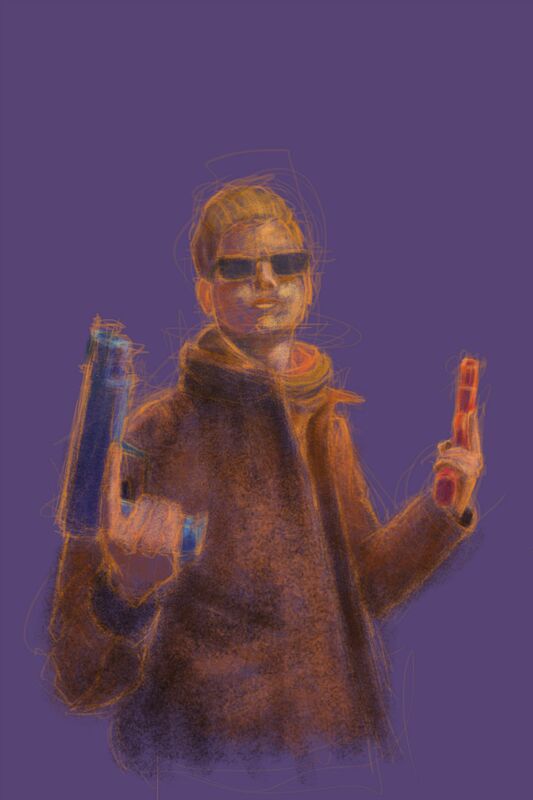 Tried to go for complementary colors on this homework assignment. I started painting the open Easter egg first and got really excited. I thought I was doing great. 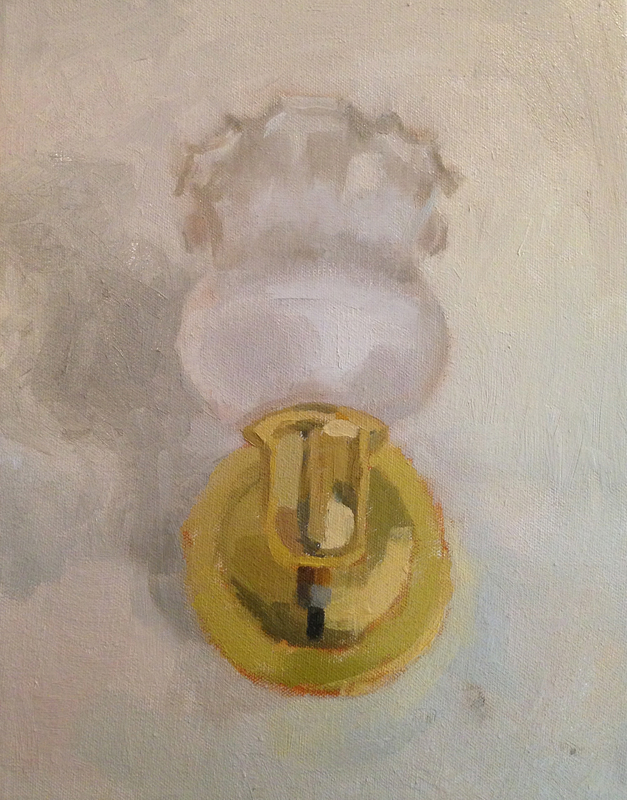 But as I worked out to the rest of the painting, my excitement dissolved. I lost my focus and my drive. You may have noticed a pattern. 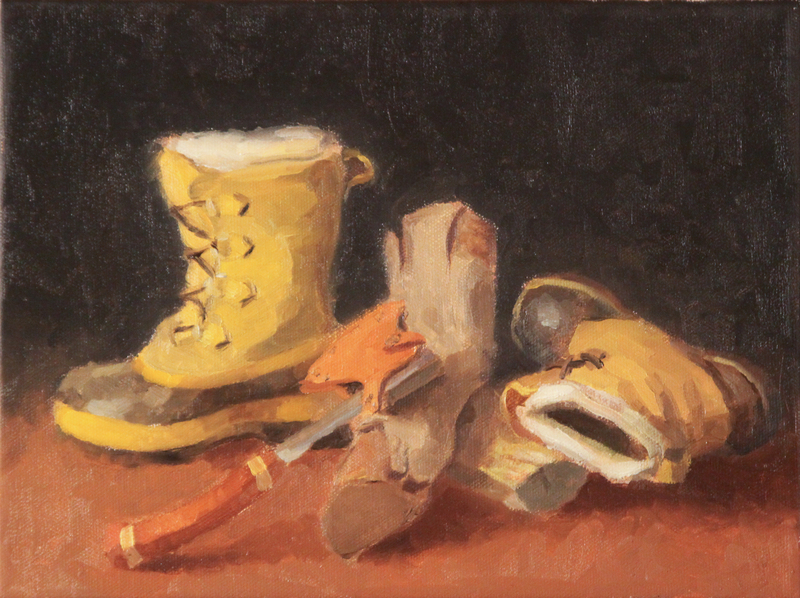 All the homework projects were still-lifes. I was very much bored with that pattern. I went home for the weekend and asked my mom for some help. She rekindled my enthusiasm by setting up a still-life for me. 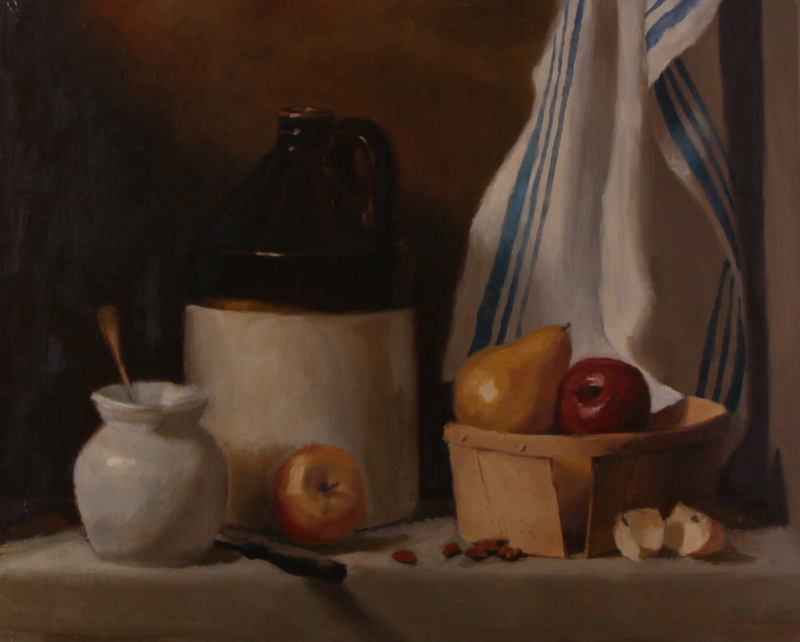 She has a knack for still-life composition. 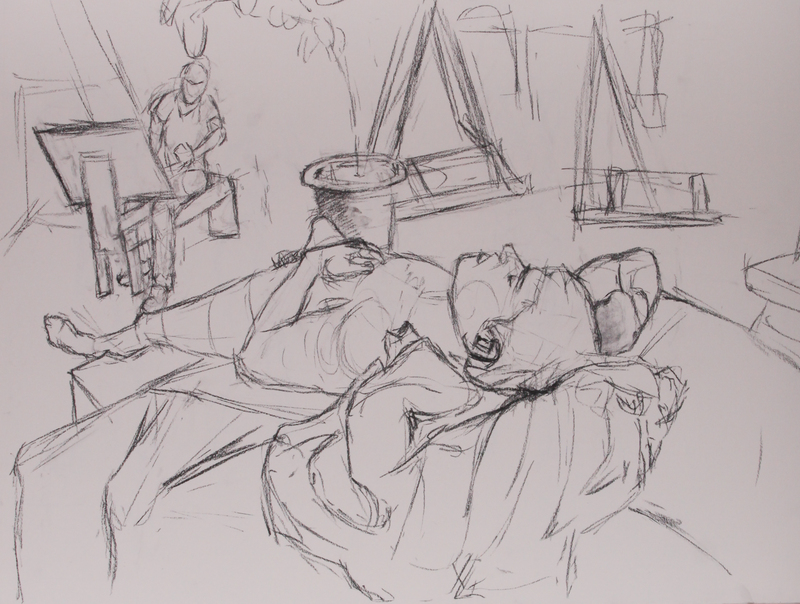 Unfortunately at the time I did not have a knack for transferring the composition to my canvas. Everything should have been moved to the right a little. Then there would be nothing disappearing off the left side. 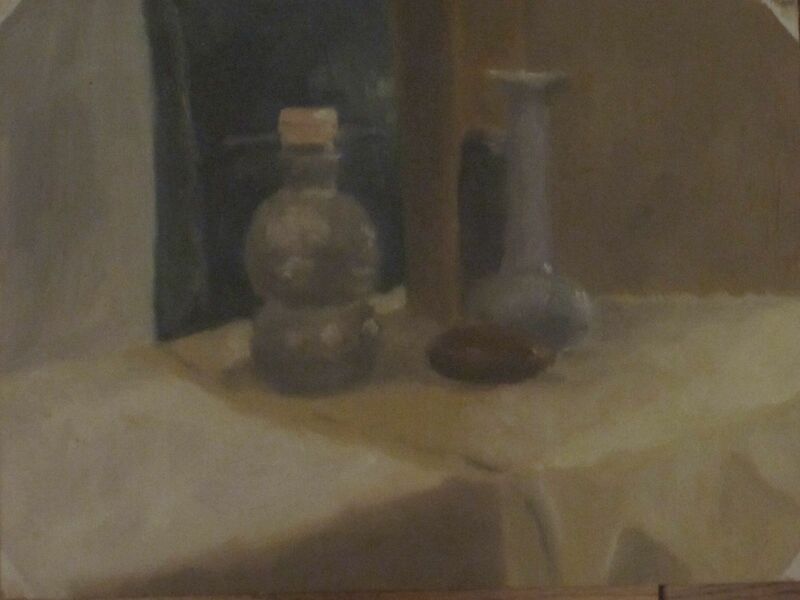 There was a huge benefit from going home and having my mom help with the still life. I was able to use some of her old brushes. I selected a few flat and bright brushes, which changed the way I applied paint. My strokes became more square. This was one of the first paintings where I toned the surface before working on it. Because everything in the setup was earthy, it felt like I was forming the objects and people out of the muddy background mist. A multi-week in-class setup I designed myself. It deals with thoughts on manhood. 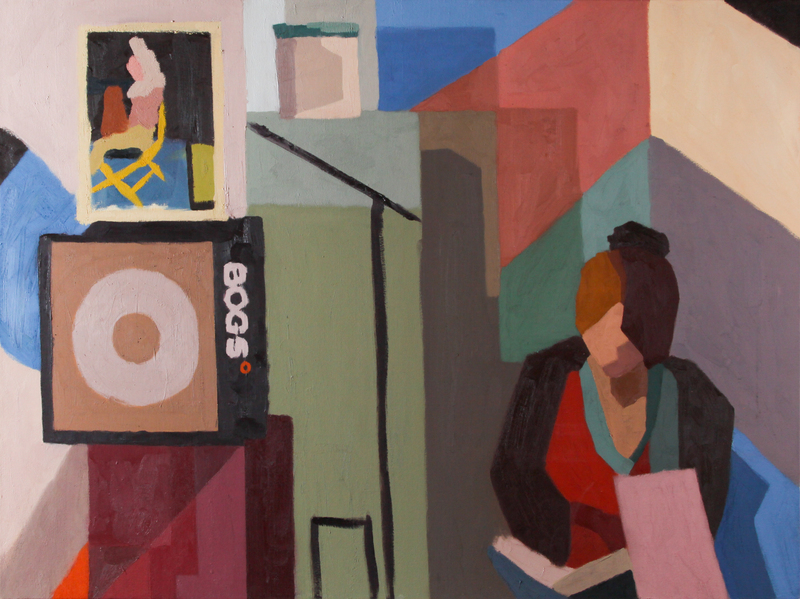 This painting and the next were supposed to be a diptych. As I worked on them, well, they separated. They had the same model, but they were no longer connected. Can you guess what I enjoyed painting the most in this painting? The lamp. It’s hilarious looking at it now. 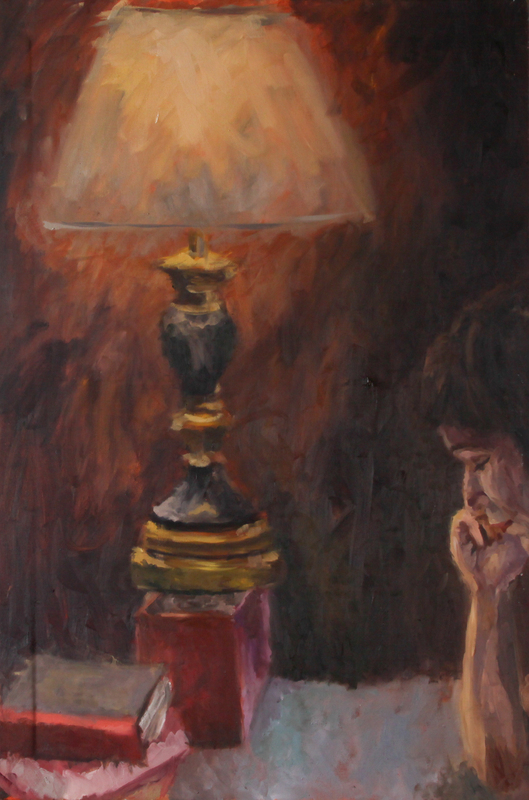 The figure is barely on the canvas and the lamp is the real center of attention. It stands in a black void, illuminating everything beneath. It takes up the majority of the canvas. It’s my subject. 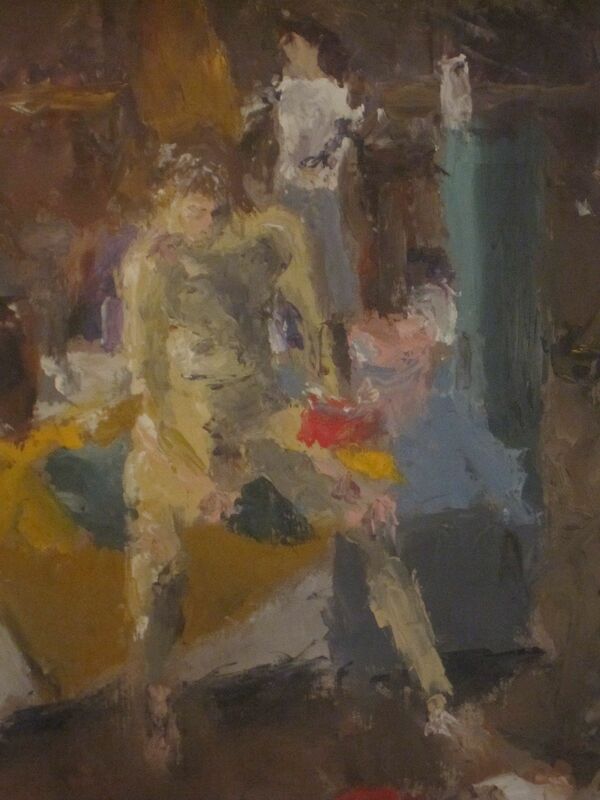 And it’s funny because the figure is normally the subject and focus of a painting. In a way, this pokes fun at that convention. But not on purpose. I just liked painting the lamp. 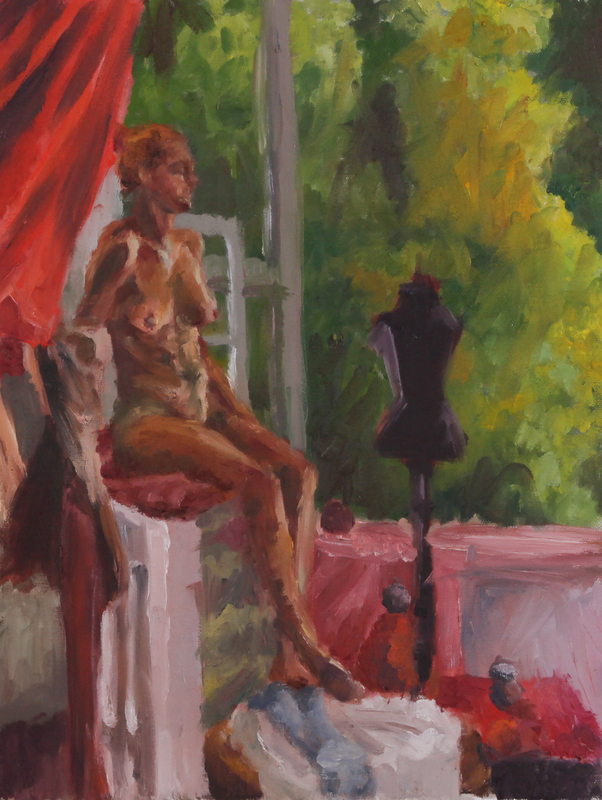 Before you continue below, know that the next three paintings have depictions of me naked. 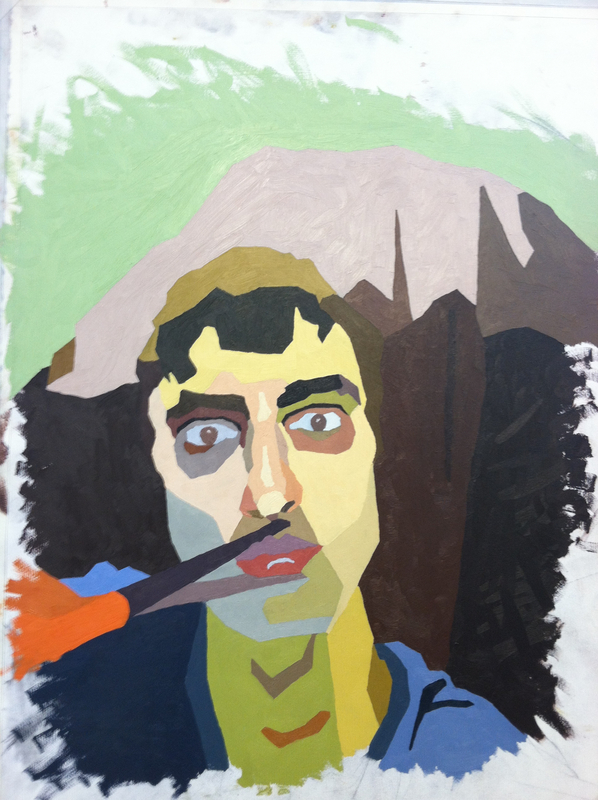 So if you know me, and you’re sensitive to things of that nature, you might wanna skip down to Advanced Painting 2013. Note: These photos have been removed since I’m soon to become an educator. Our final project had to be a three piece series. That was the only requirement. I weighed my options for a while and settled on a topic I knew well: The Bible. 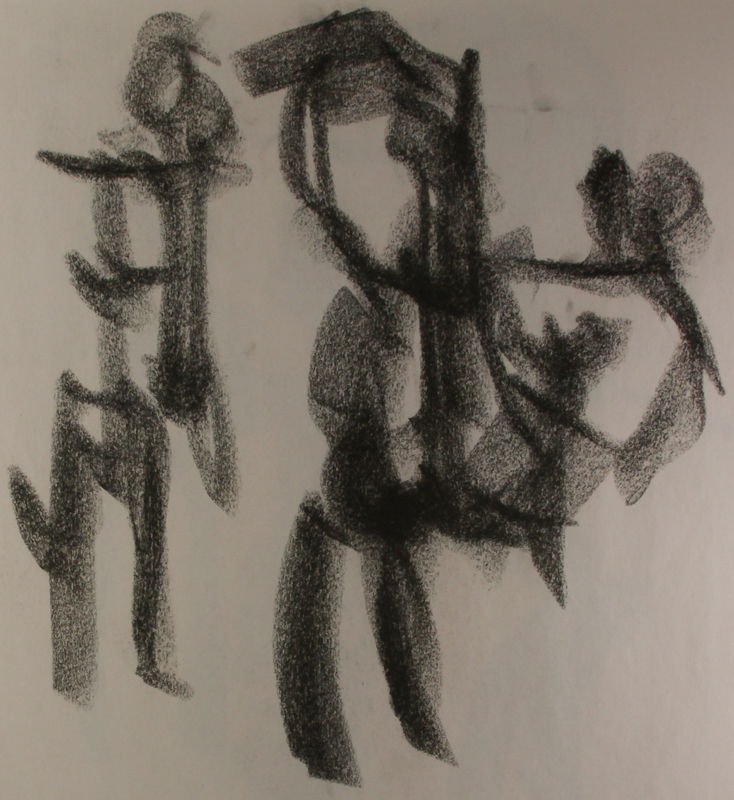 This first painting was of Cain and Abel. But there’s a twist. I’m in it. Twice. Why? Well, I wanted to be the narrators bringing the viewer into the scene. I wanted to get the viewer wondering. And maybe I was asking the viewer who was to blame. Then the viewer progresses to this painting and the narrators are suddenly a part of the scene. There’s Abraham, getting ready to sacrifice Isaac, and the narrators aren’t removed from the situation. They are reacting with emotion. Finally, we come to the last painting: The Judgement of Solomon. Now the narrators are active participants. They are arguing over the “babe.” They can no longer ask who is to blame. They are the problem. I painted these three pieces in two flurried weeks. The second and third paintings were even painted on back to back nights. I was obviously rushed. You can see how I left much of The Judgement of Solomon unfinished. 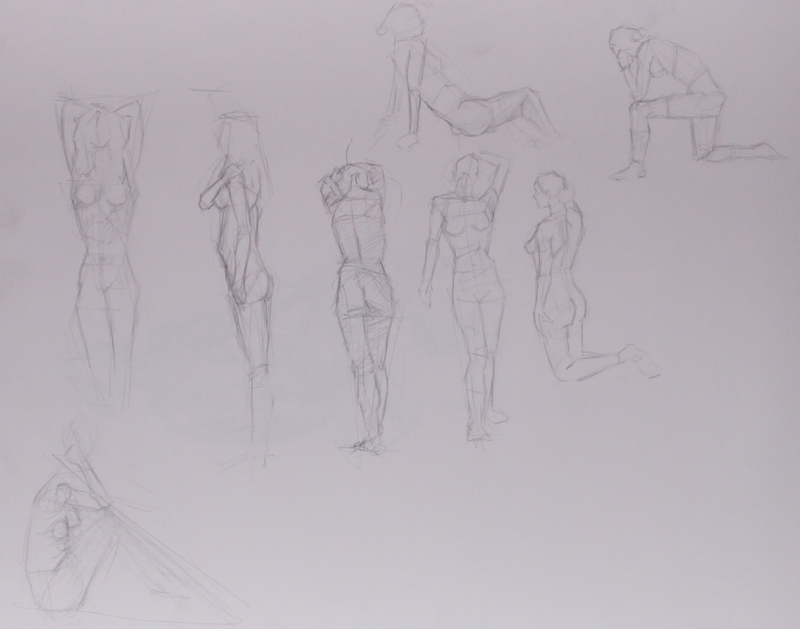 But I executed my idea and I got some serious figure practice from it. 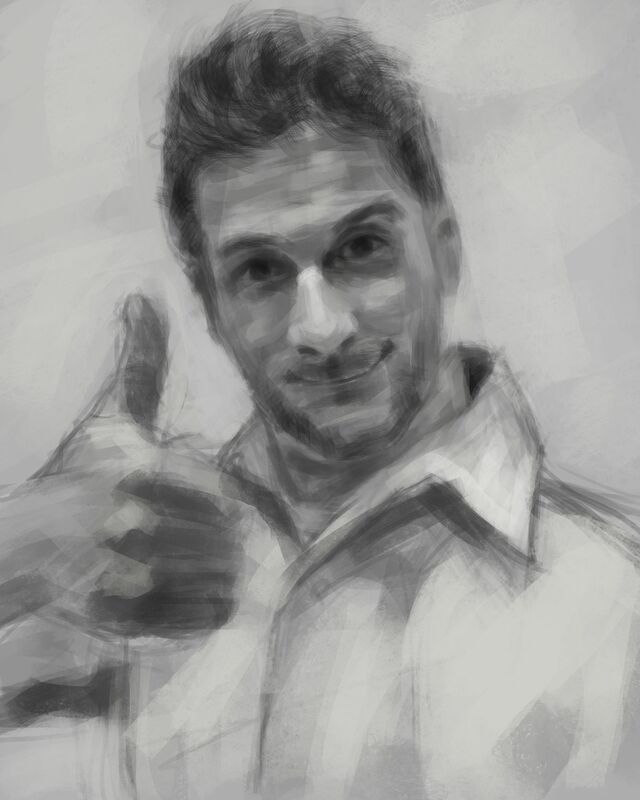 It’s one thing to paint from a model. It’s another to model and then paint yourself. 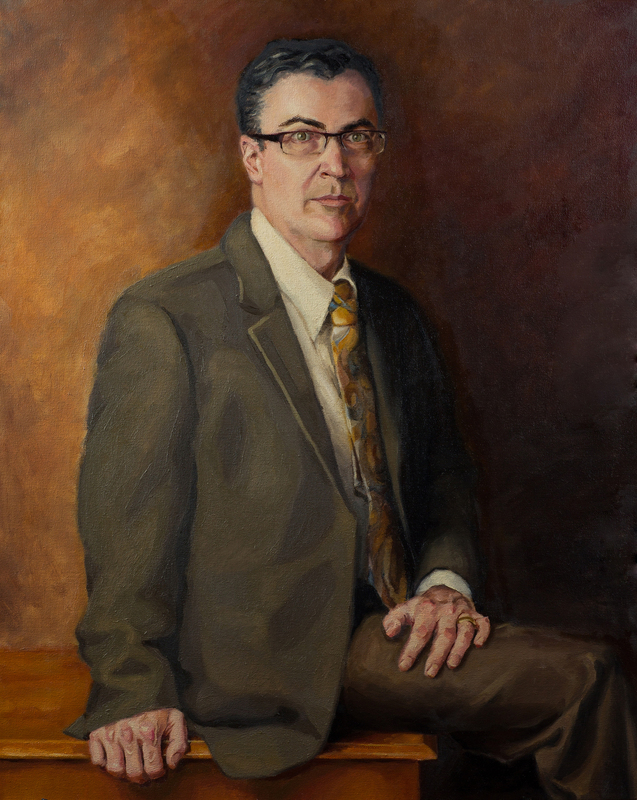 I began my UNH painting career with Professor Craig Hood, and I ended it with him as well. It’d been three years since I’d taken a class with him and I was excited. I think the figure turned out nicely, but I’m not convinced by the teal blanket. 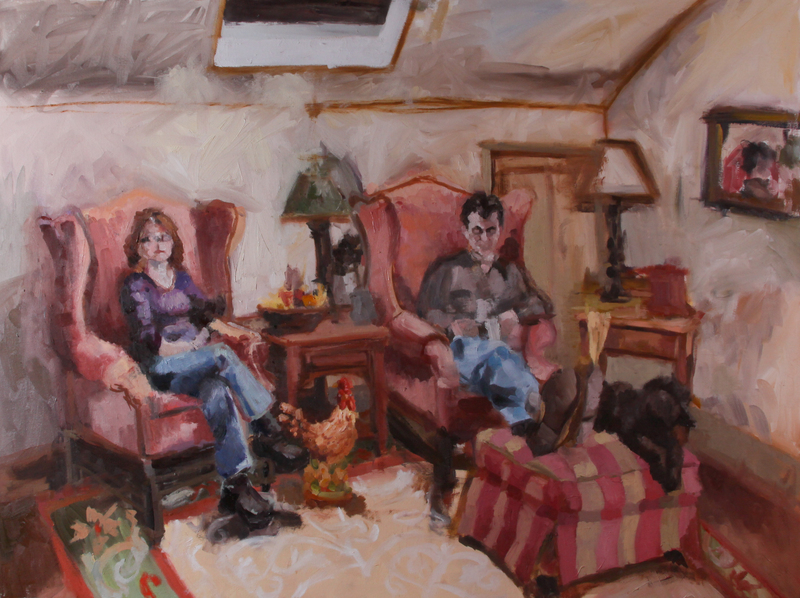 This was a multi-session painting focused on large shapes. I particularly like the BOGS brand logo. 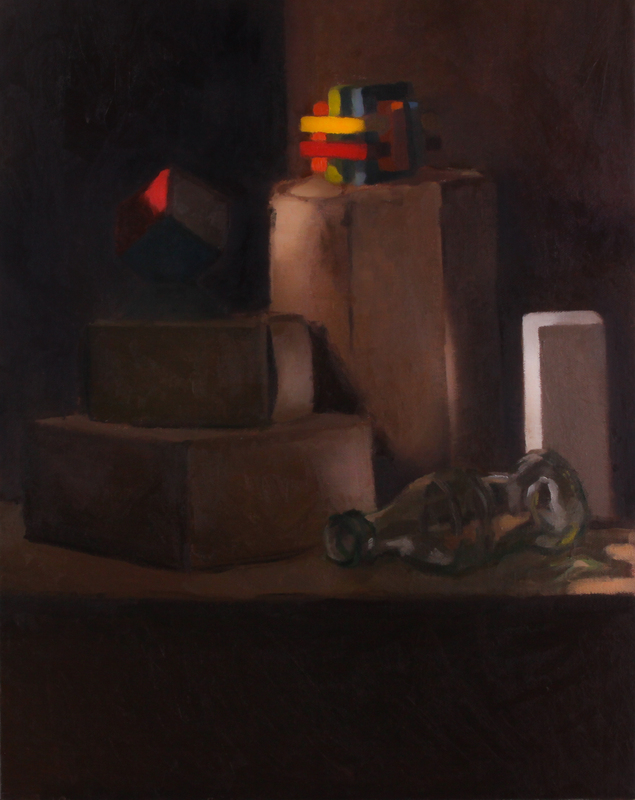 …and the last still life as an undergrad. A portrait assignment. I chose my parents. 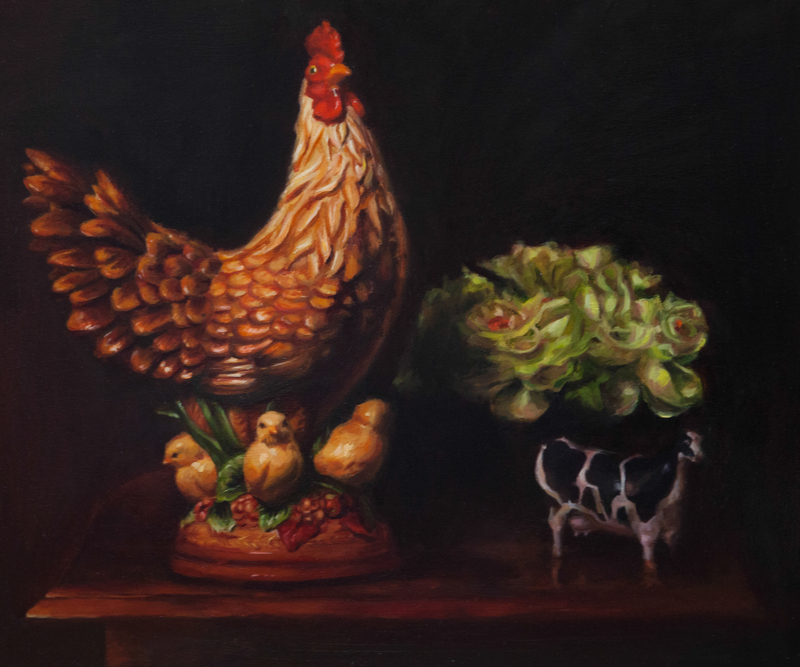 You may notice that the chicken statue next to my mom’s feet was the subject of one of my other blog posts. And the final project. My last hoo-rah. Sorry for the lack of words in these last few descriptions. I want you to take these paintings on your own. I don’t want to influence your mind with words. 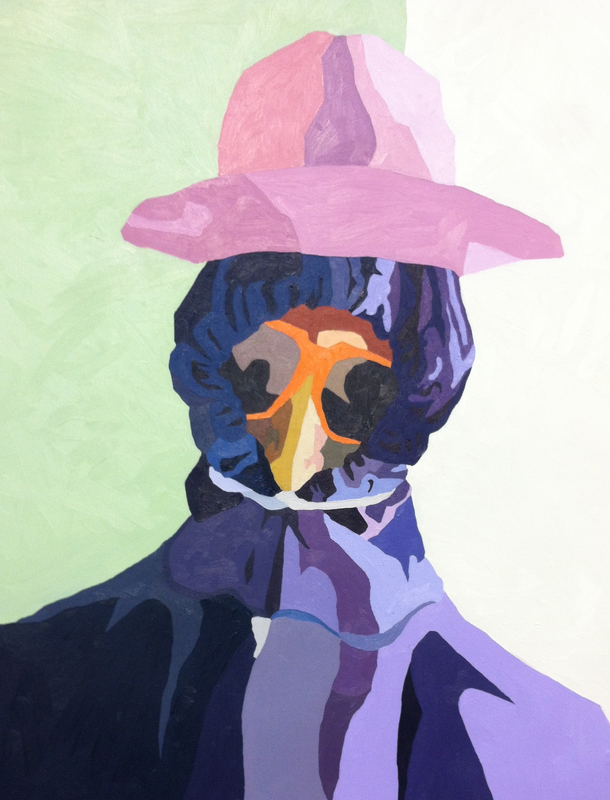 Look at the paintings from my last semester. Compare them to the paintings I made earlier in college. See how far I progressed? Now take a look at all the blog posts I’ve made since graduating. 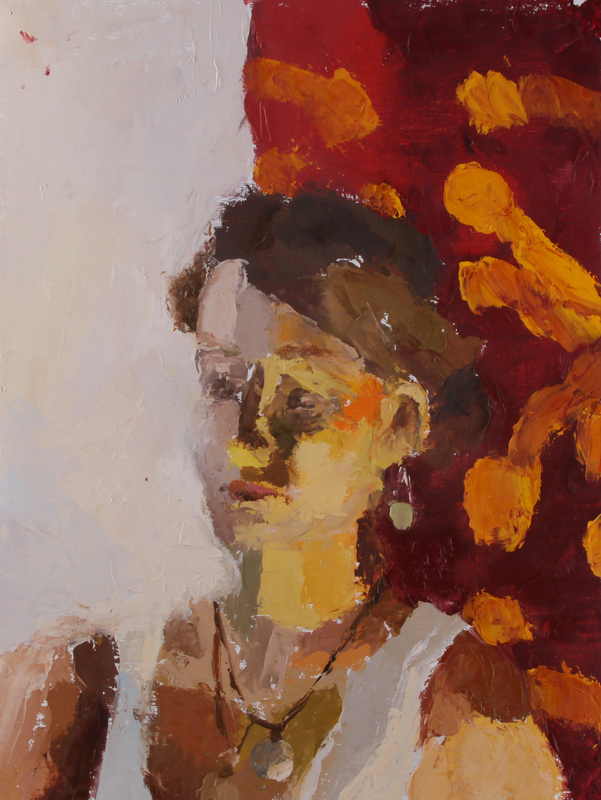 This painting and the next came from a workshop with the Pulidos. Read about it here. Taking everything I learned at the workshop, I started my own still life at home. More info. This was a gift for my girlfriend’s brother. More info. 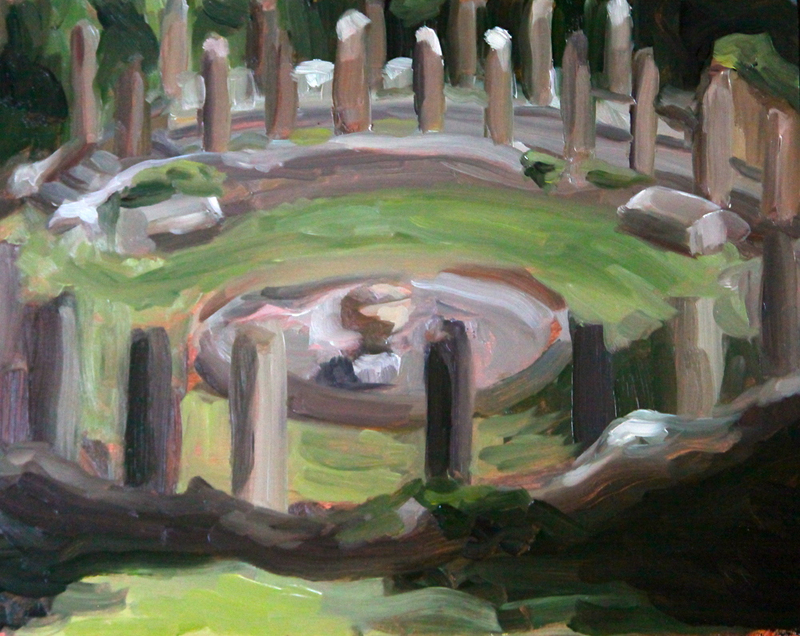 Painted at the Crane Estate in Massachusetts. More info. The chicken statue. In all its glory. Also accompanied by a fat cow. My dad again. Looking a little spiffier. 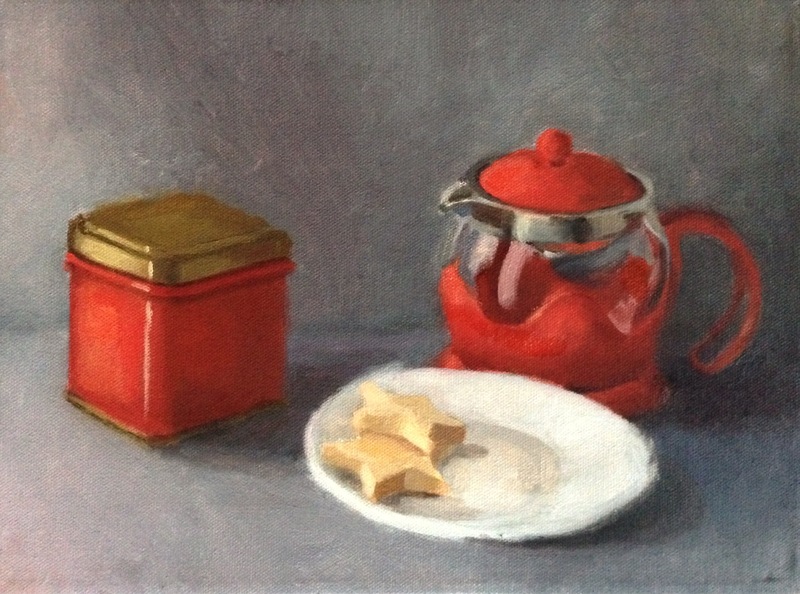 The red teapot. Not to mention some star shaped shortbread cookies. This was the start of a long relationship between reddit and drawing. More info. 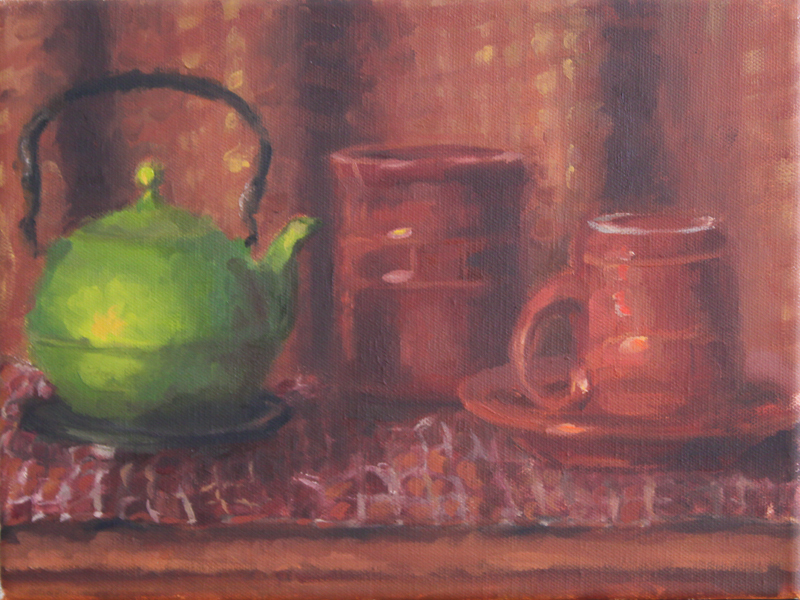 The green teapot. 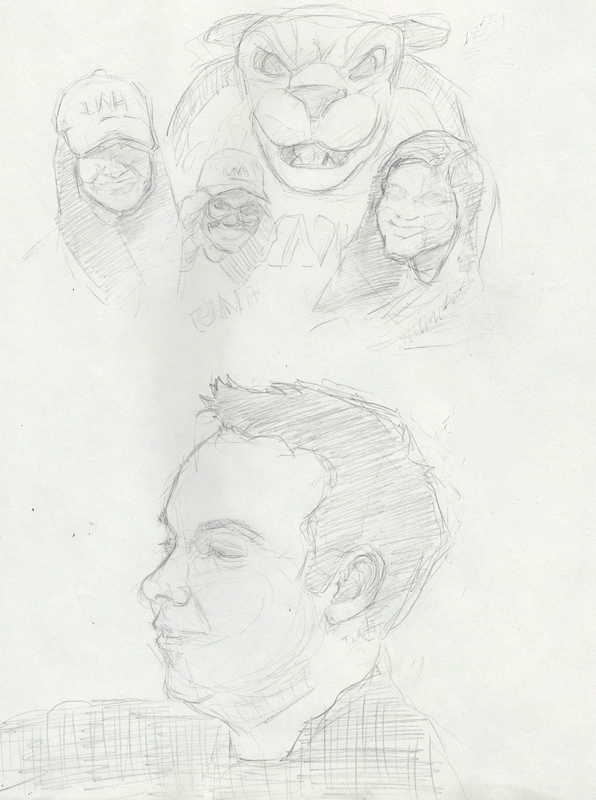 The next seven drawings can be found through that link as well. 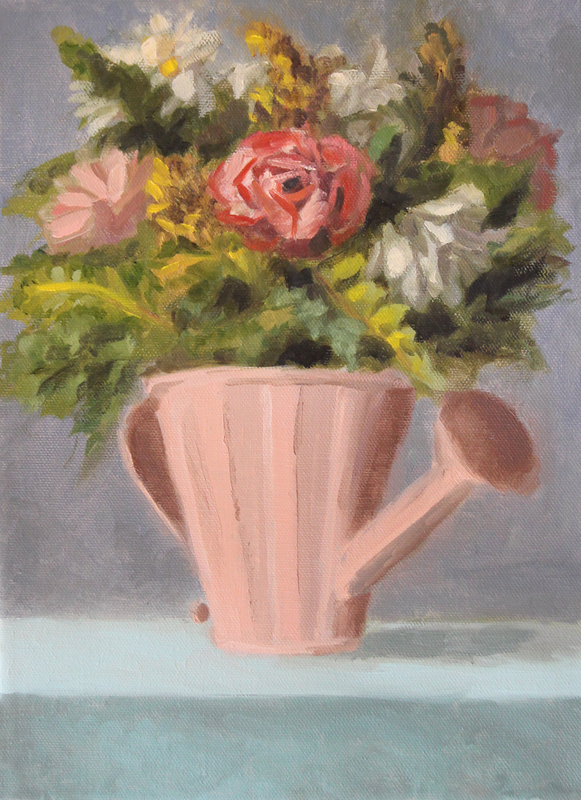 Flower still-life. The next 7 pictures are through this link as well. 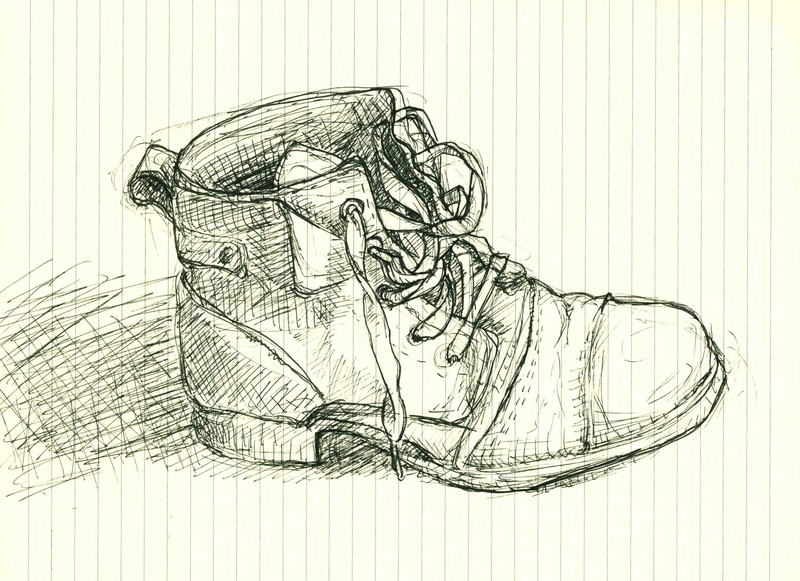 The boots. Next four paintings are through this link too. Flashlights in a sea of cloth. Facebook portraits. 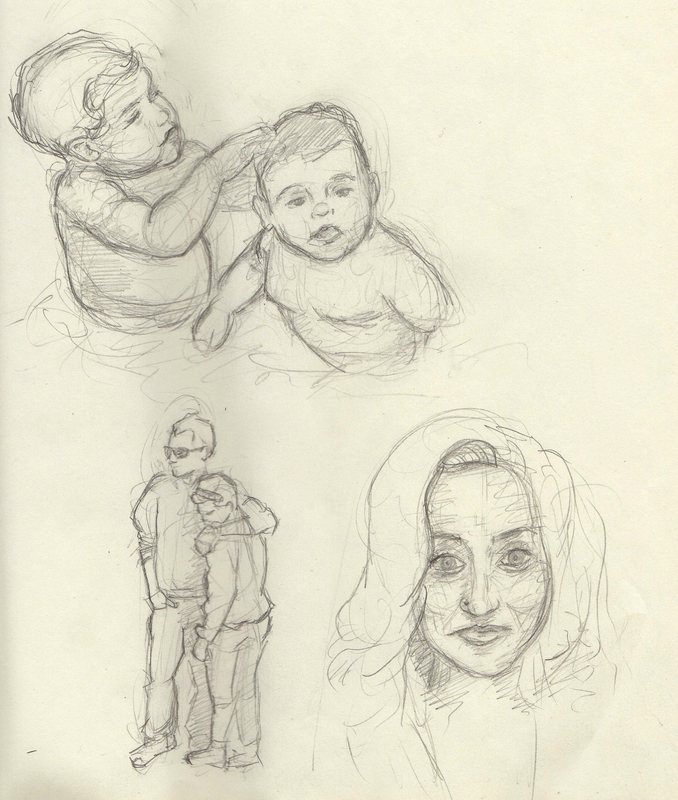 Next four drawings in this link too. More info on this and the next five drawings can be found here. The Bennington Flag. 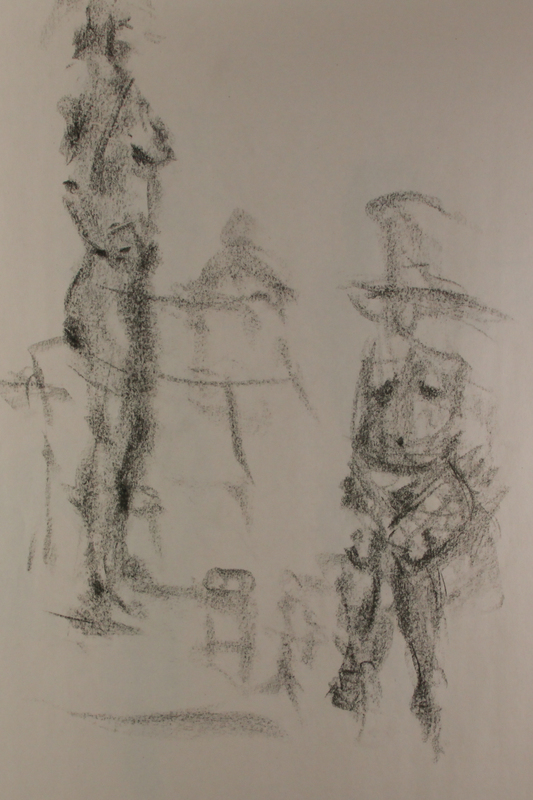 Accompanied by the following five drawings. Bunnies in the spring. It was a gift for my girlfriend. Info on this drawing and the next can be found here. Yet another Facebook portrait session. My girlfriend. 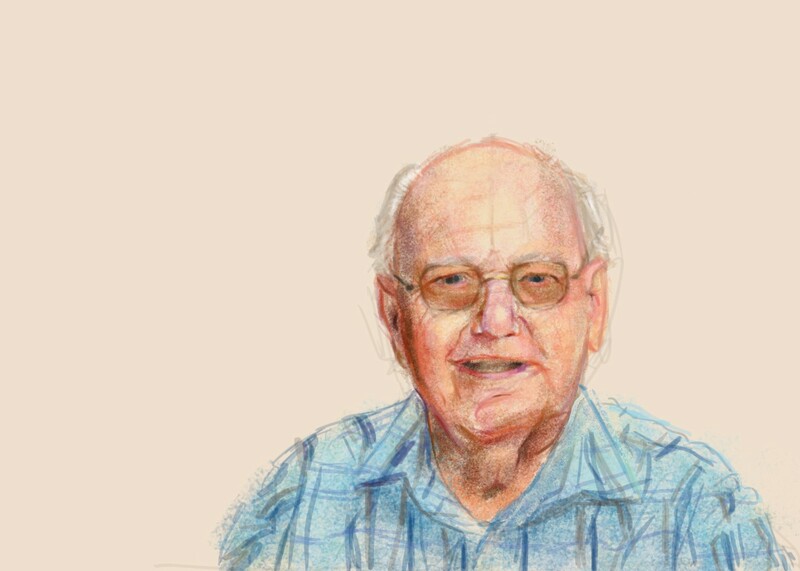 And my first watercolor portrait. 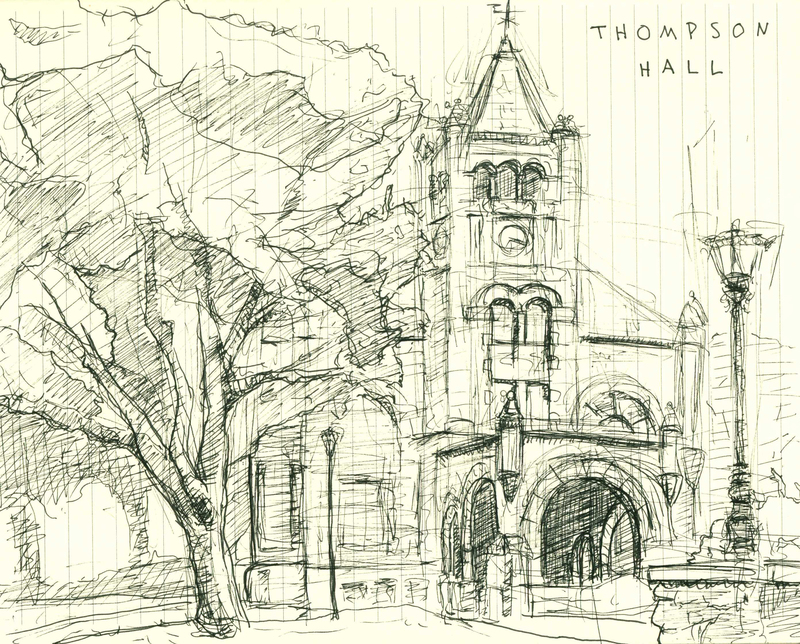 Thompson Hall. 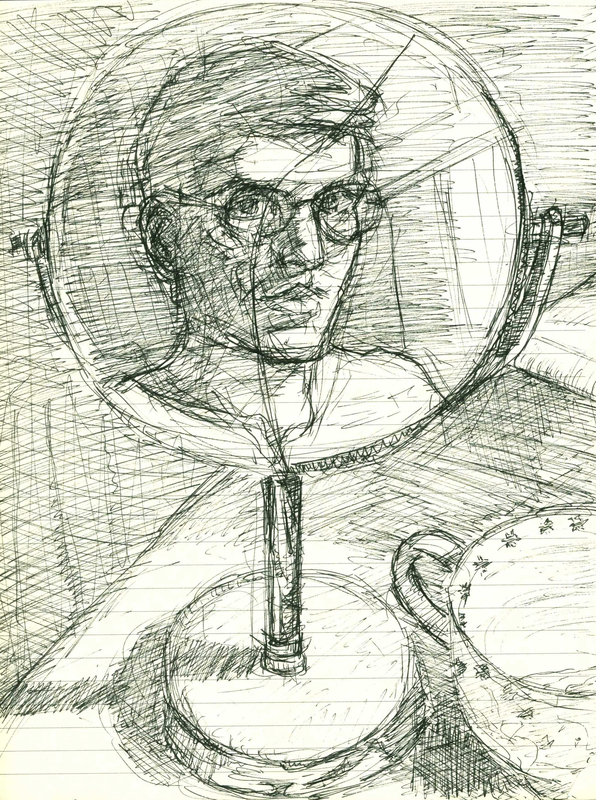 More info on the self-portrait below in that link as well. And here we are. Back at the present. Next blog post I’ll discuss my thoughts and feelings on this recap. I’m a little worn out right now. I’m back at the University of New Hampshire! I’m working towards a Master’s degree in Secondary Education, so I’ll be here for two years. Then I’ll be teaching English to kids in high school. Hopefully. We’ll see how that goes. For now the summer is over and I’m able to focus a little more on art. 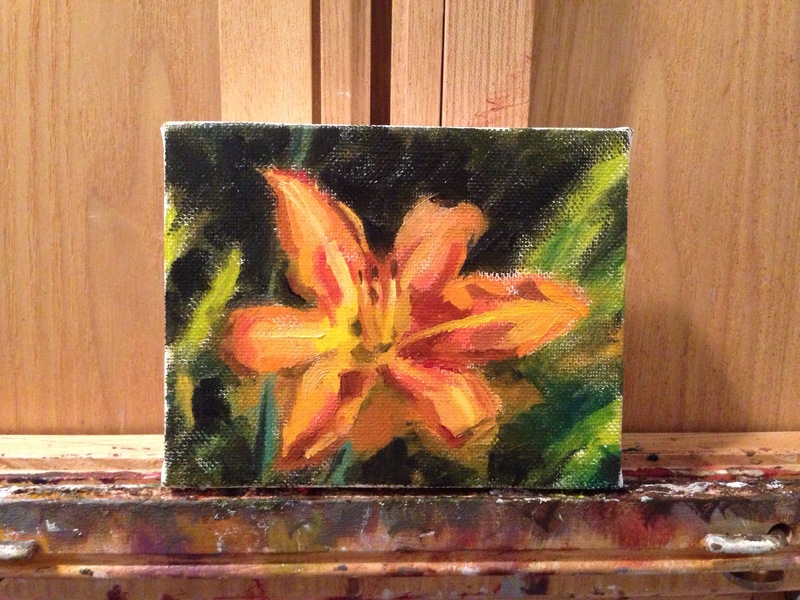 About a month ago my girlfriend’s aunt commissioned me to do a painting of her day lilies. I said yes. 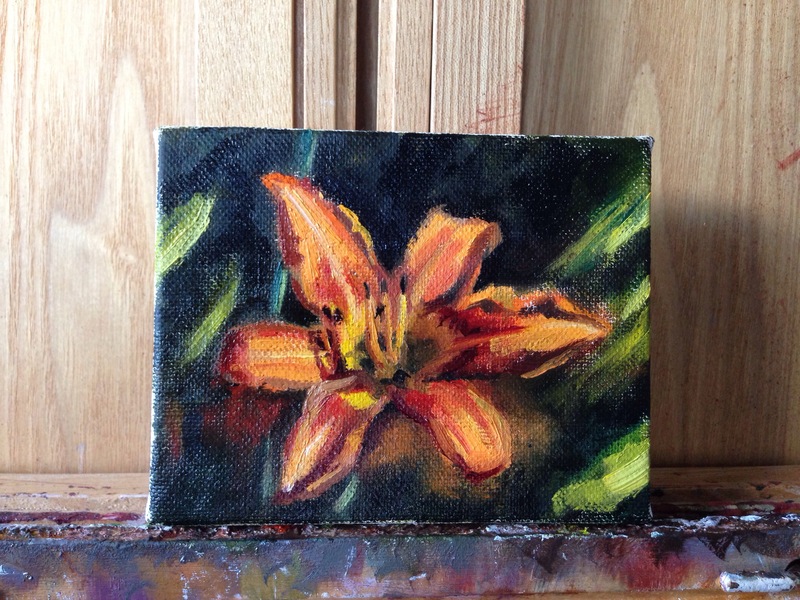 Even though I’ve only done one painting of flowers. This one. 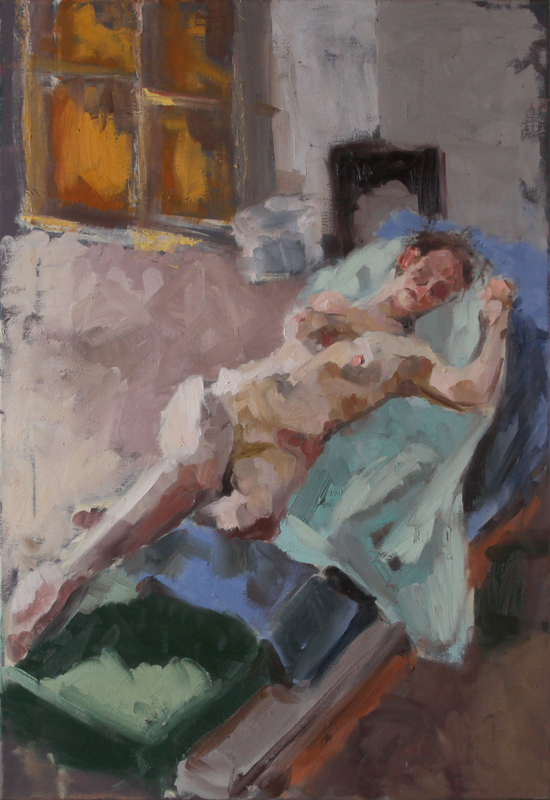 I enjoyed that painting and liked the idea of revisiting a subject I’m not normally drawn to. 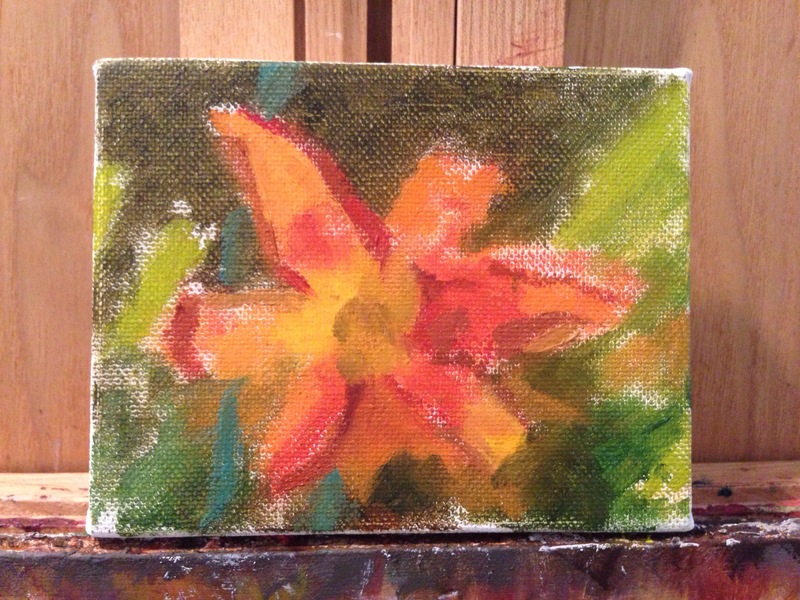 Figuring out what flower to paint was a bit of a process. My girlfriend took a bunch of photographs of her aunt’s plants, her aunt selected which photo she liked best, and then I worked from that file to create the painting. Did I mention it had to be small? 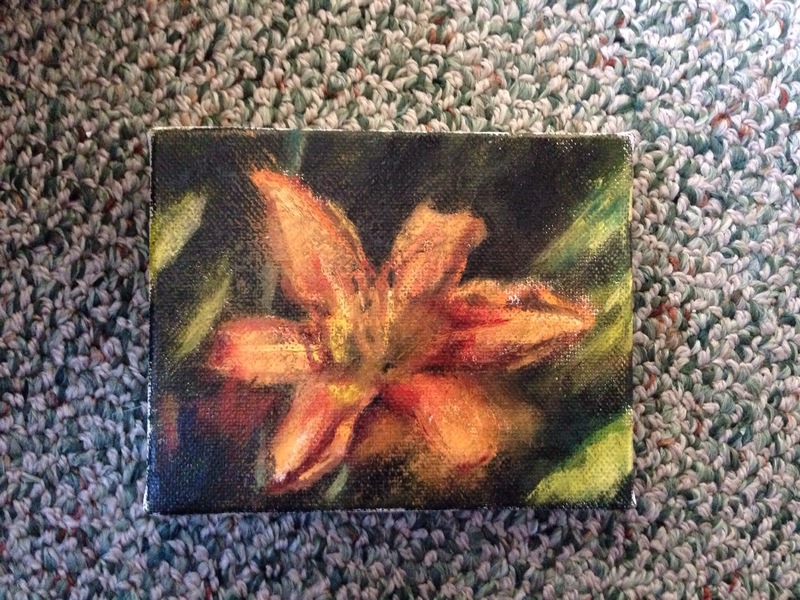 I wound up working on a 5″x7″ canvas. It felt like painting on a penny. Before I begin talking about every step, I’d like to note that this is the first studio painting I’ve done in my new apartment. Since I don’t have any furniture yet, I sat in a bean bag, lowered my easel all the way, and put my palette, brushes, and brush cleaner on a short box. I wish someone had snapped a picture of me and the setup. It was ridiculous. Surprisingly though, it wasn’t too hard to work that way. The only issue I had was that my knees got a little cramped. Oh well. Don’t make excuses, make art. I’m sure that’s a quote from someone. I used a medium sized round brush to just lay out paint at the start. Almost immediately I filled the canvas and had to downsize my brush. Also, sorry for the photo quality. I was into the painting and so I didn’t spend much time trying to make the progress photos perfect. One day I’ll have a gorgeous studio that will be seamlessly integrated with technology and my progress pics will be excellent. One day. That’s what I was told in my Intro to Painting class. Don’t only paint from photographs. That’s what I was told in a later class. And I understand the logic of both statements. Teachers want new students to learn from life. 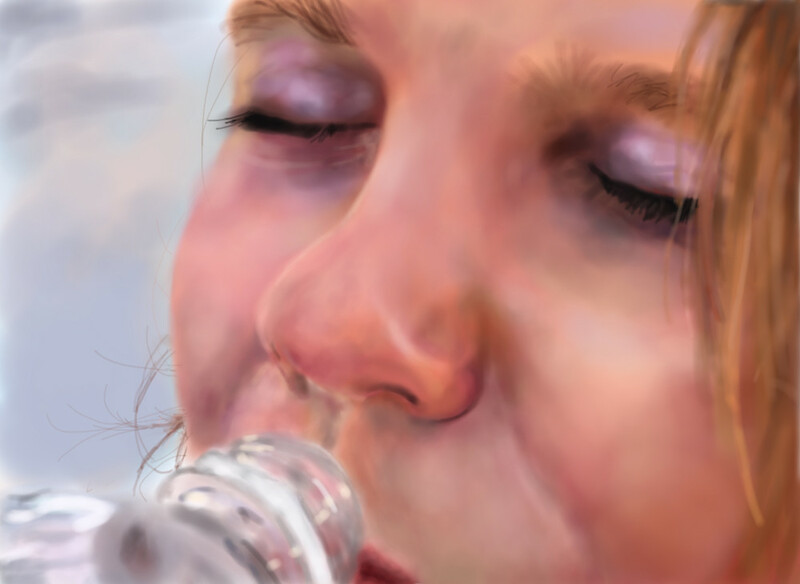 Bad habits are formed when painting from photographs. 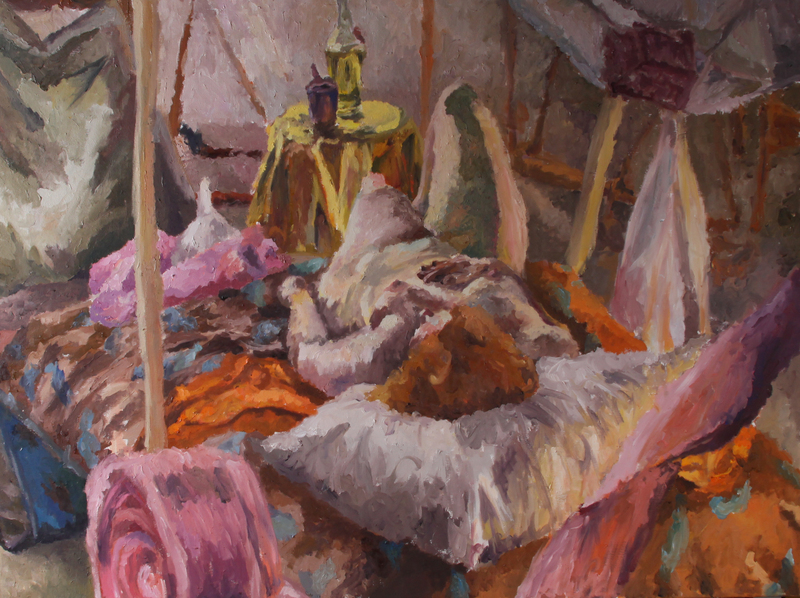 Paintings done without a life reference often come out overworked and stale. But the statement was changed once we sharpened our skills and understood painting concepts more. Excellent painting can be done from photographs as long as the artist knows how to use the photo (sometimes when I write on here I feel like I’m just quoting my teachers). I had to make sure I wasn’t putting in every detail that the photo showed. In the early stages I made sure to keep the background sloppy and hazy. The human eye cannot bring everything into focus like a camera can. I kept that fact in my mind. I like to work blocky. Block after block of paint until I have it laid all out and the lights and darks are defined. 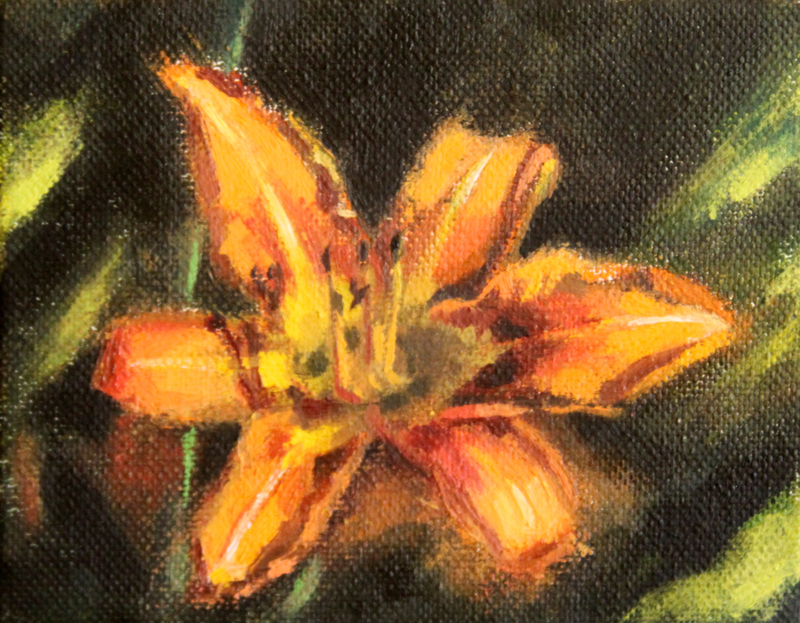 Though in this painting the main dark was the background and there were only subtle light differences in the flower itself. I like this progress shot. This stage had a lot of life to it. 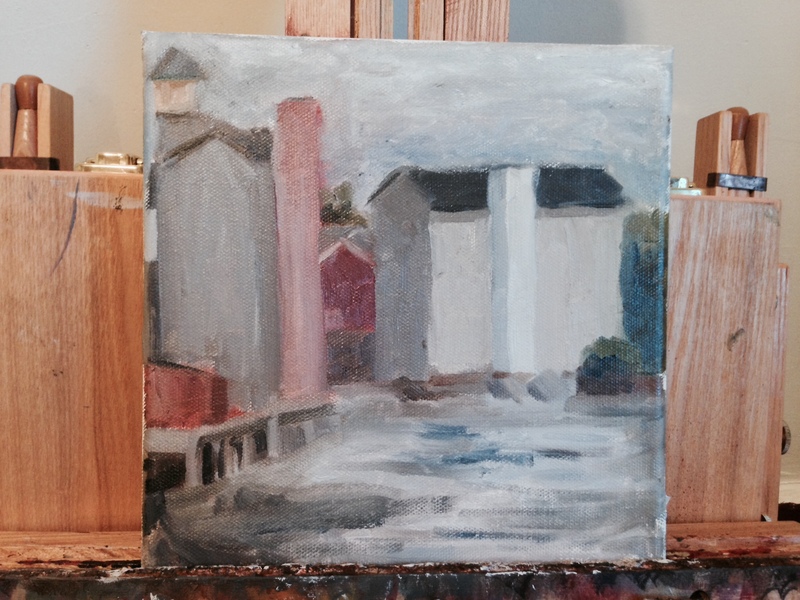 It felt like a cute, quick painting that had been done in plein air. 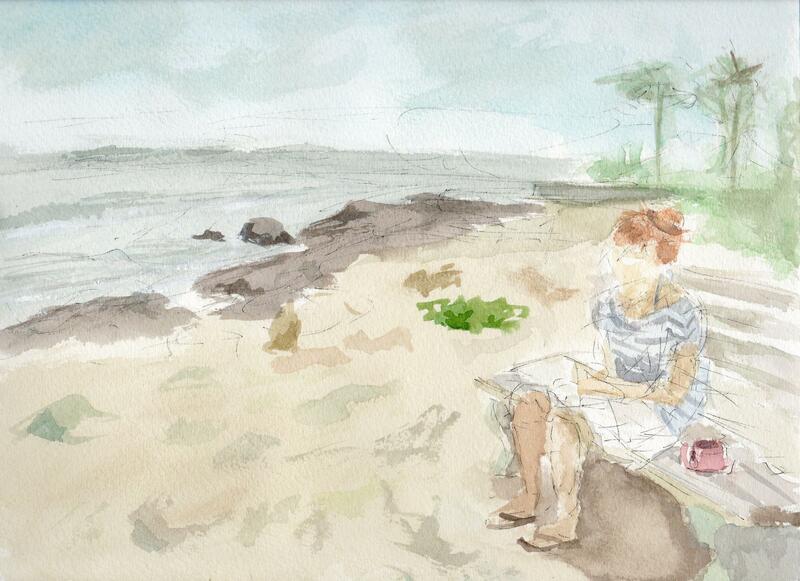 Speaking of which, I’ve been a little obsessed with the Plein Air magazine recently. It is absolutely brimming with a variety of pieces each month. Well. Oops. I overworked it. You can just feel it in this photo. 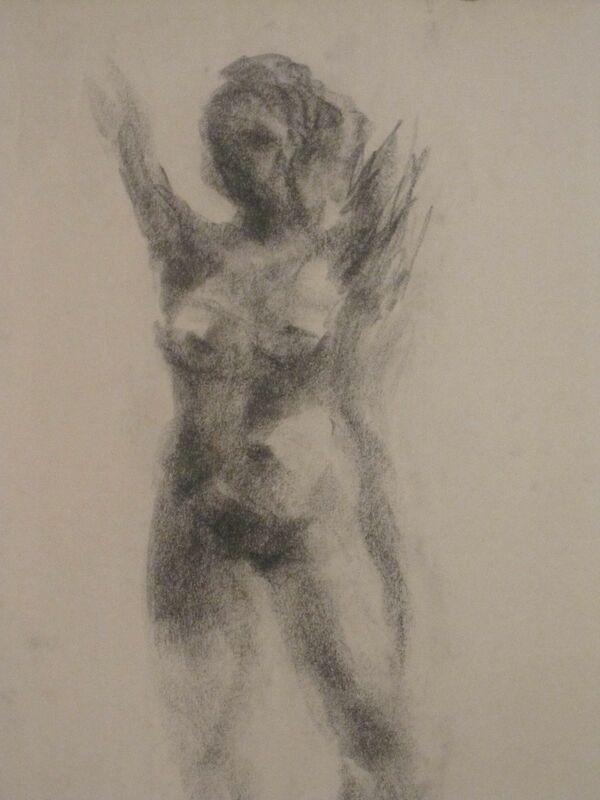 It was far too stiff and had none of the fluidity of the last rendition. I picked up the knife and started scraping. This is what I was left with. Not too bad, actually. It has a great softness to it. I would’ve left it here if it had been a personal painting. But commissions are different. After scraping everything down, I struggled. 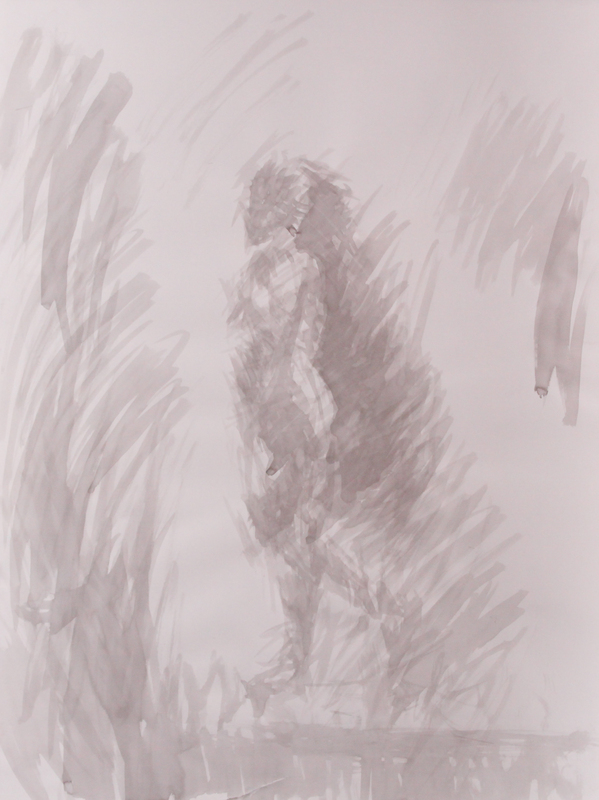 The paints muddied up and I had to end the session. You can see my lights also got pasty from the use of too much white. On the last session I worked primarily with heavily saturated colors. I wanted to breathe life back into the piece. It had grown dull since its wonderful start. I tried to work with a careless attitude and paint freely. 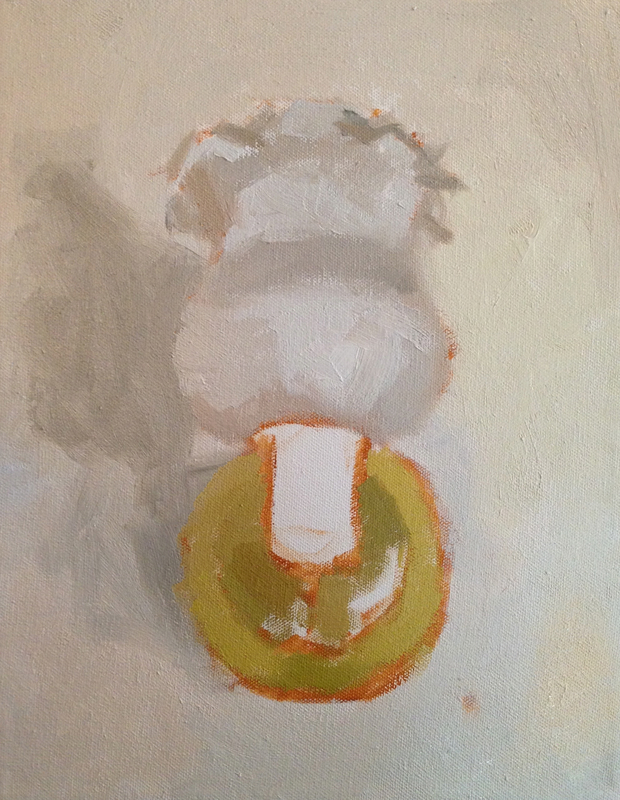 I concentrated less on exact strokes of paint. Well, until the very end when it was necessary to wrap everything up. I wish I had been able to bring this painting back to my parents’ house and photograph it properly. The photo I took at my apartment does not do it justice. Of course, that is the complaint of many artists when they photograph their work. 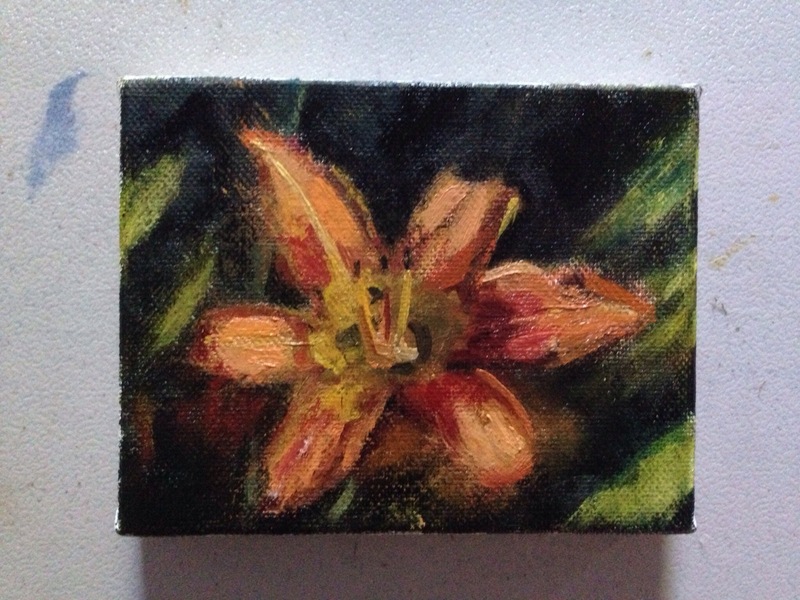 I’m interested in painting more small flower portraits. There was something intimate about the whole process. I have one large wall in my apartment that is bare of paintings. I’ve been trying to figure out a series I can paint to hang on it. 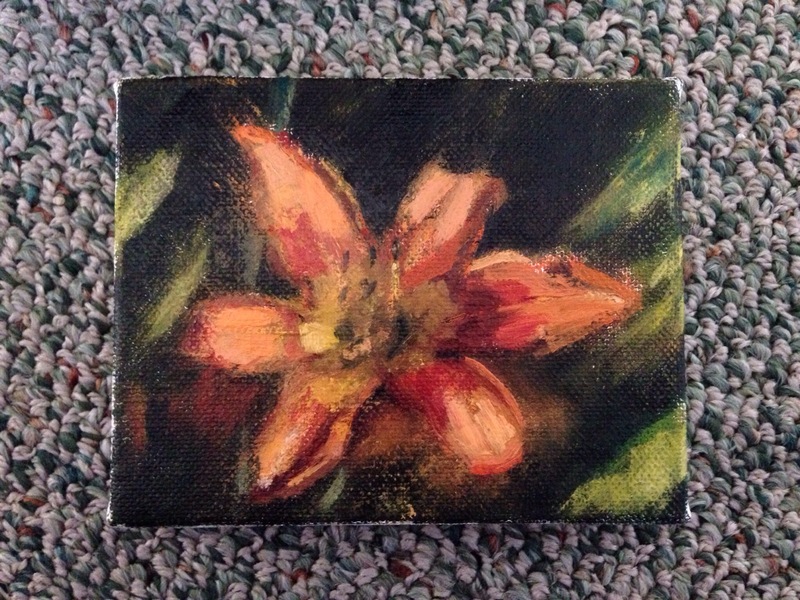 I’m not sure if fifty small flower paintings would work in the space, but I wanna try for fifty and I wanna see how it looks. Though I’m always full of ideas. We’ll see if it pans out. 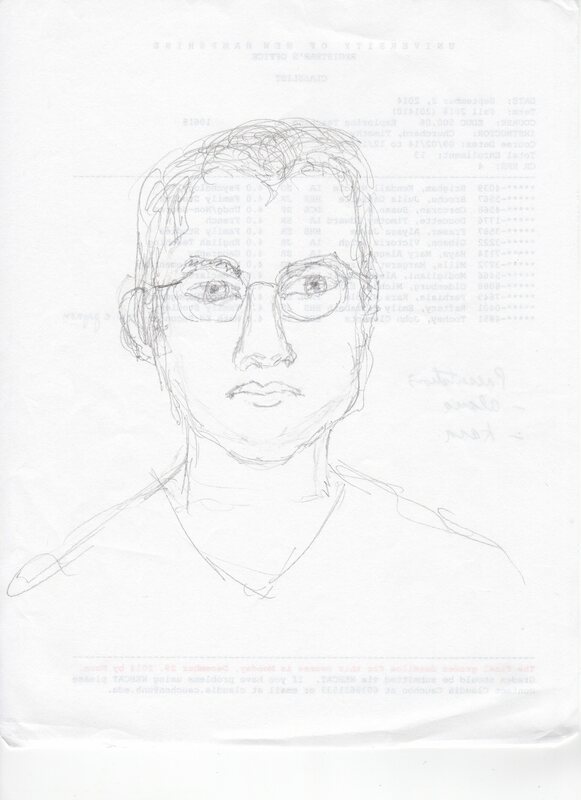 Finally, I’d like to share a portrait from one of my new professors. He teaches UNH’s version of an Intro to Education class, but has degrees in several different fields. One of them being a Bachelor’s in Studio Arts from UNH. Anyway, he’s having us do personal presentations throughout the semester and he demonstrated what they should be like by talking about his passion for art. 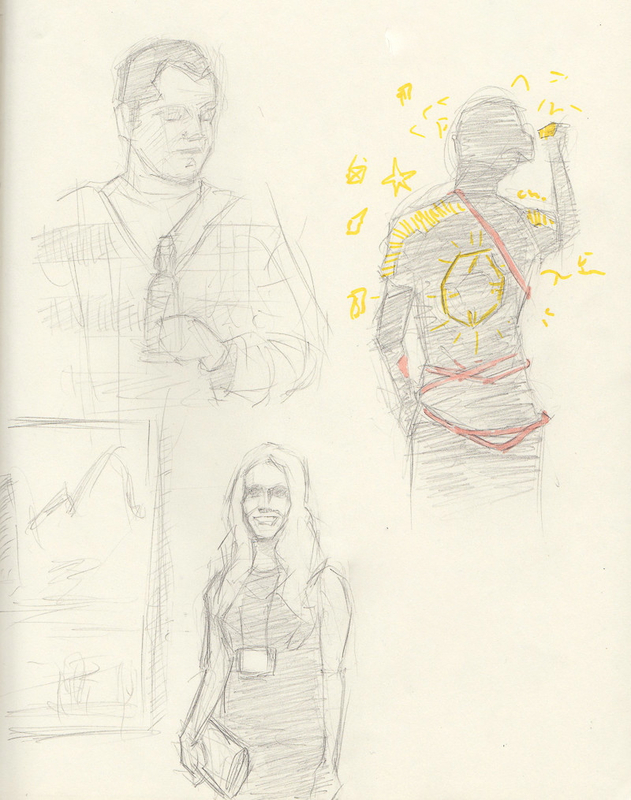 To start the presentation he had us pair up and draw another classmate. 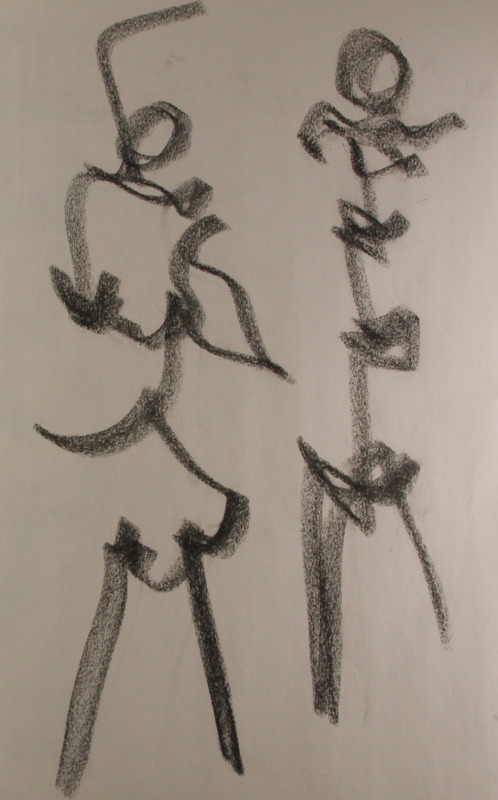 Because we have an odd number of students he paired up with me and we each received about five minutes to draw. I posed first. 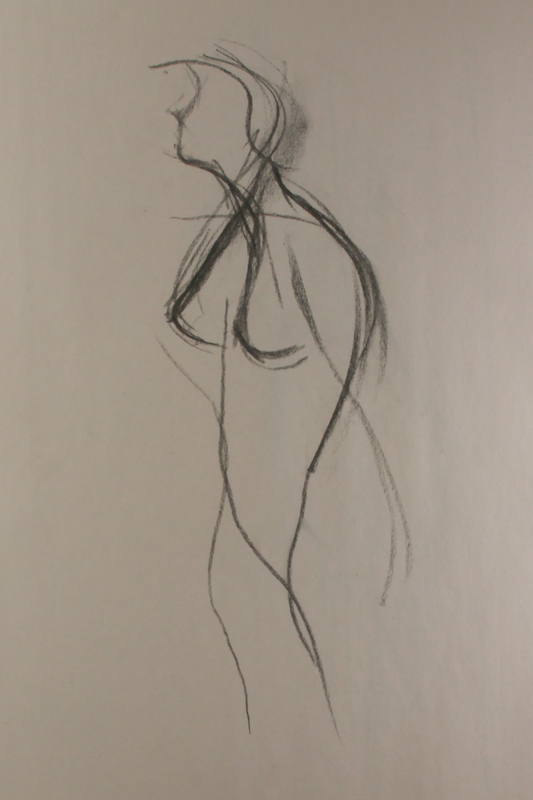 I really enjoy the looseness of the line. 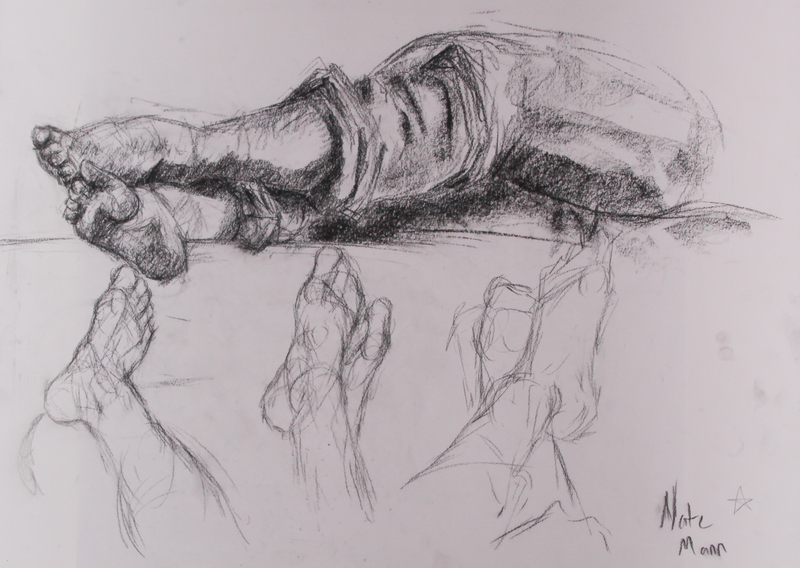 It’s refreshing to see myself drawn by someone else’s hand. 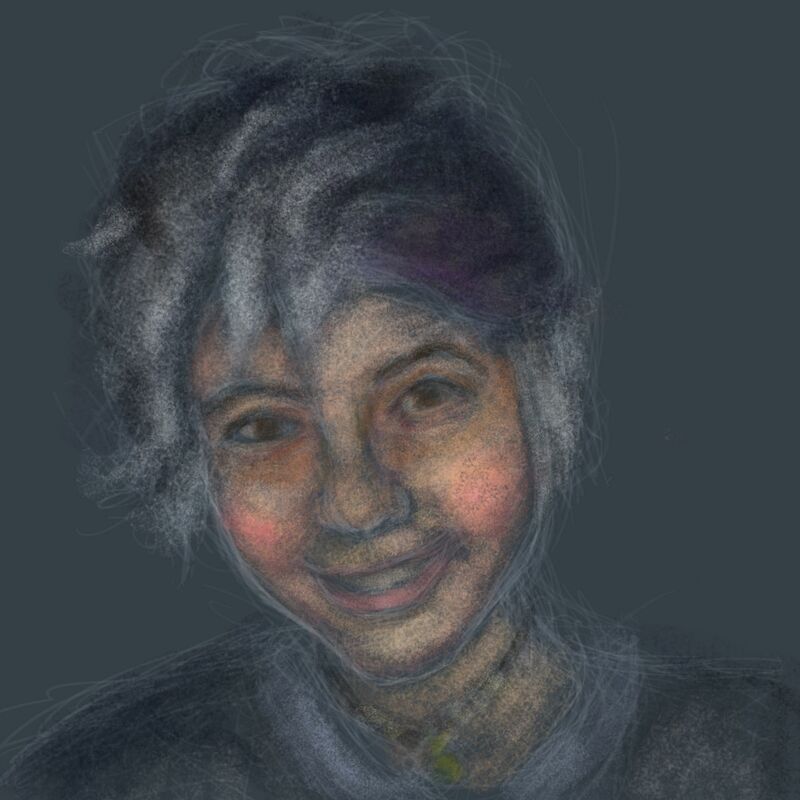 It makes me want to start a project where I have tons of people draw me. Though maybe that’s a bit narcissistic. 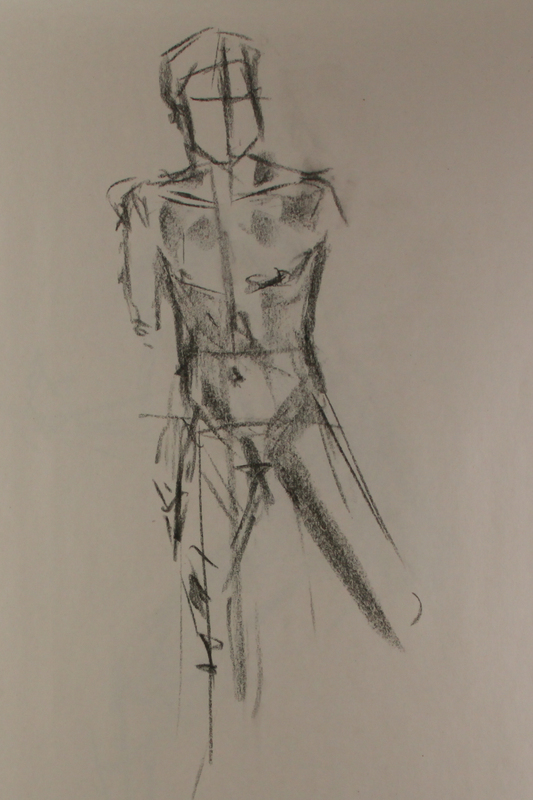 Unfortunately, I did not get a chance to photograph the sketch I did of him. We exchanged drawings and I didn’t think to record my own work. Once again I went north this past weekend and visited the White Mountains. We met up with my girlfriend’s cousin, who is hiking the Appalachian Trail, and camped out Saturday night. 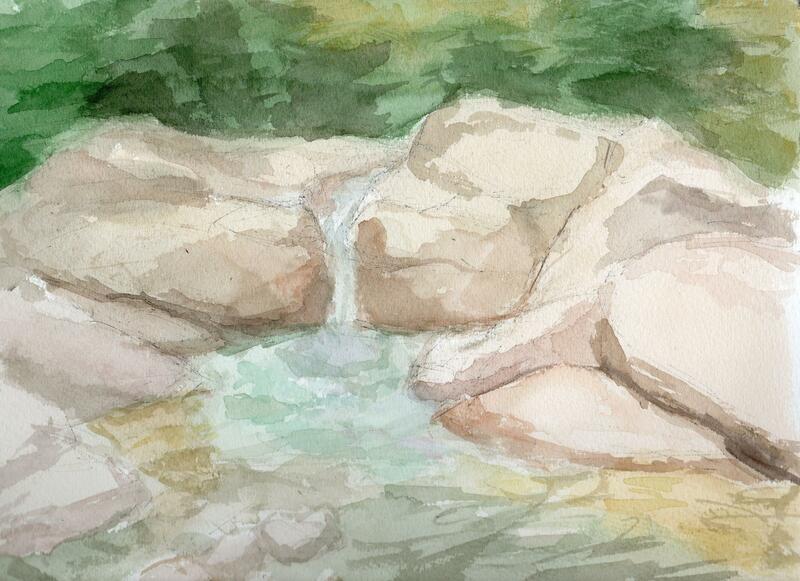 But during the day Saturday we went to a river and I set myself up to do a watercolor. And then we got some bad joo joo. One person in our party locked the keys in the trunk of one car, so then we only had my CRV. And then my girlfriend’s future brother-in-law fell into the river and broke his toe. Except we weren’t sure if it was broken or sprained, so we hopped in my car and drove around looking for medical attention. Eventually we found some EMTs who looked at it and directed us to Plymouth Hospital. Turned out that he broke it pretty good. 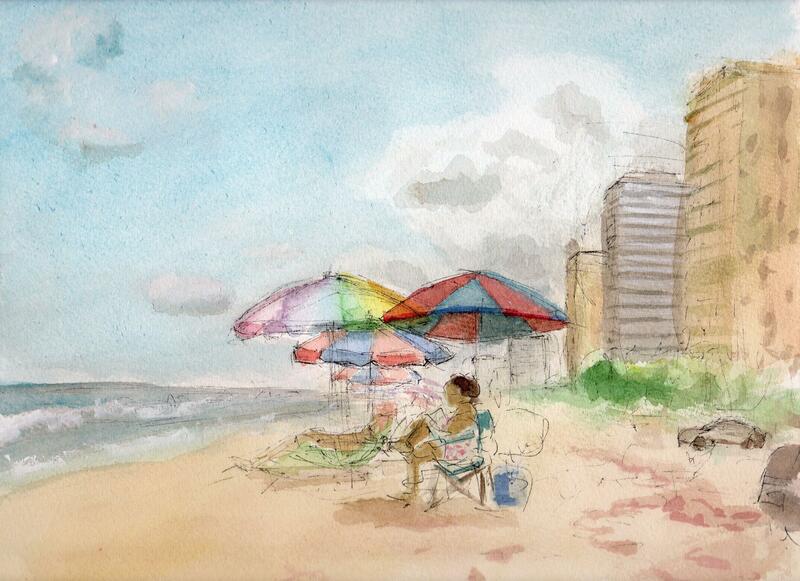 So I was unable to do a plein air painting, but that’s okay! 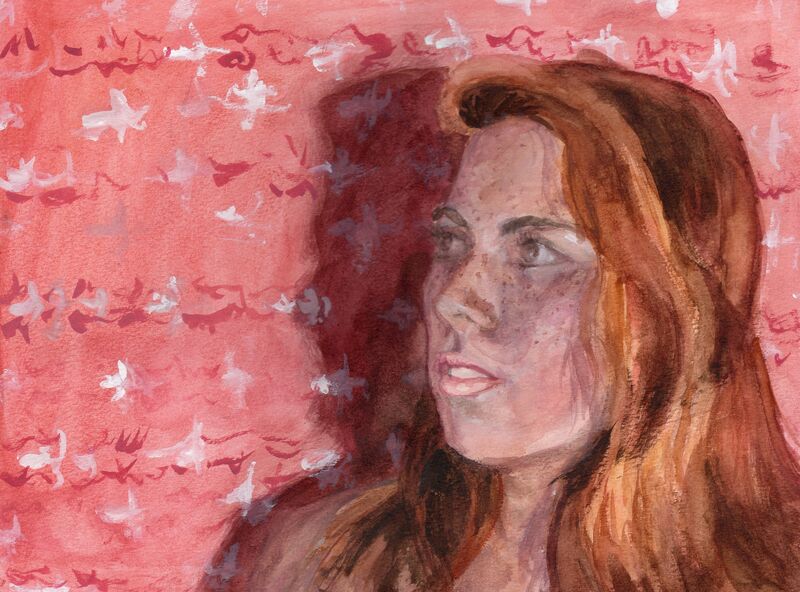 Because I’ve spent some time doing a watercolor of my girlfriend. I feel eh about this. 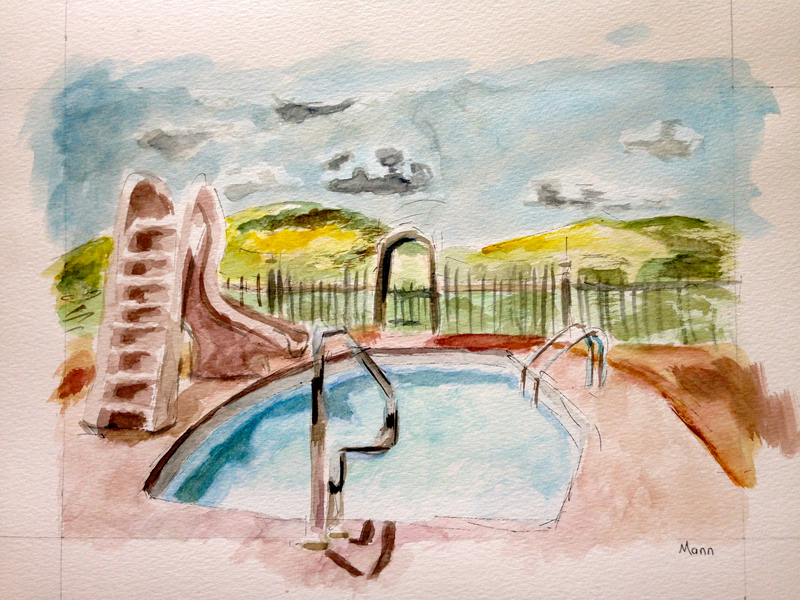 From the start I made sure to push the watercolors in new directions. 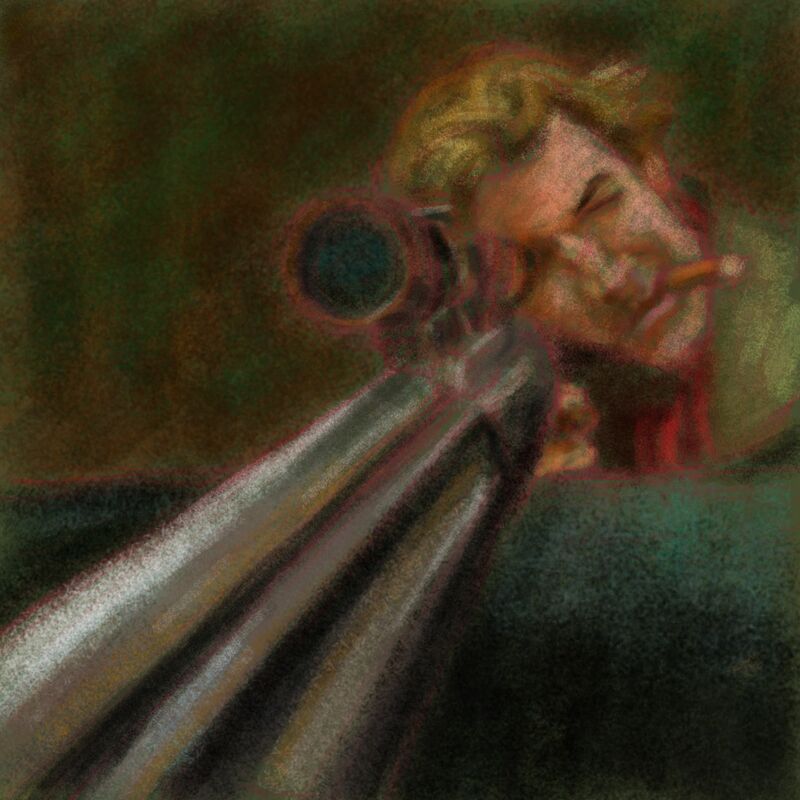 I went deeper and stronger with the color and only used a quick pencil sketch as a guide. So while I’m not too happy, I think I did benefit from the practice. The background did come out how I envisioned it though. So that’s good. It is finally my girlfriend’s birthday! She’s seen her painting, so now I can share it here. I’m gonna start posting the final version at both the beginning and the end from now on. Hopefully that will help show the development better. I’ve been telling my girlfriend that I will paint her a picture ever since we started dating. A year and a half later and I’ve finally gotten around to it. 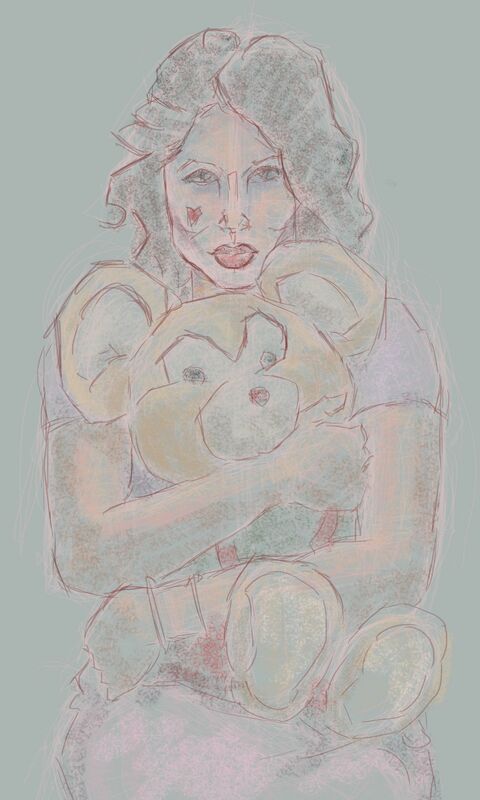 She really likes bunnies, so I went with that as my subject matter. 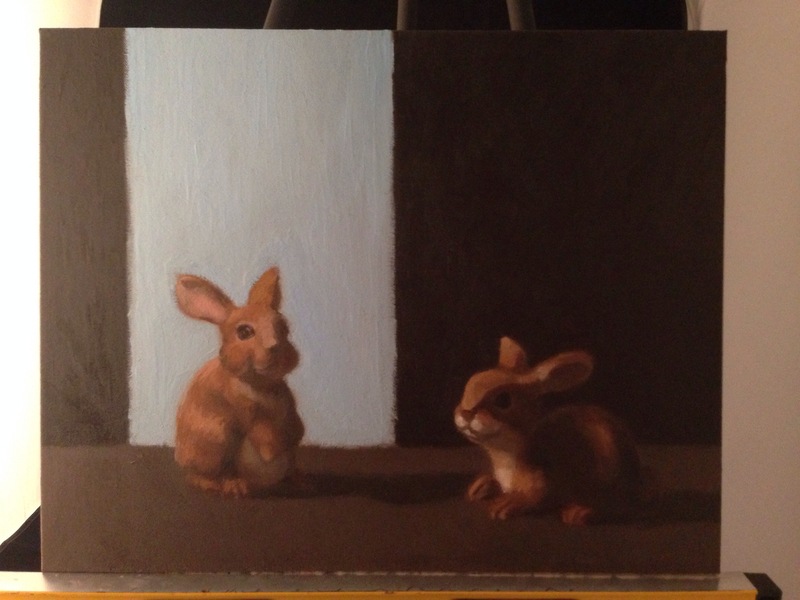 When I first placed the bunnies on the table, I knew that I was going to need some verticality in the painting to break up the monotonous and solid background. 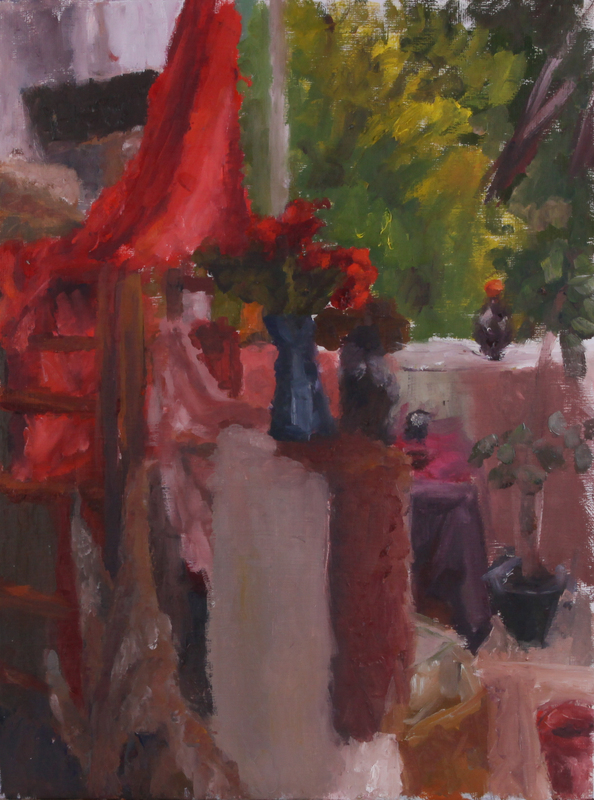 I hung up a blue cloth as my solution and it helped add a flash of color to the painting as well. 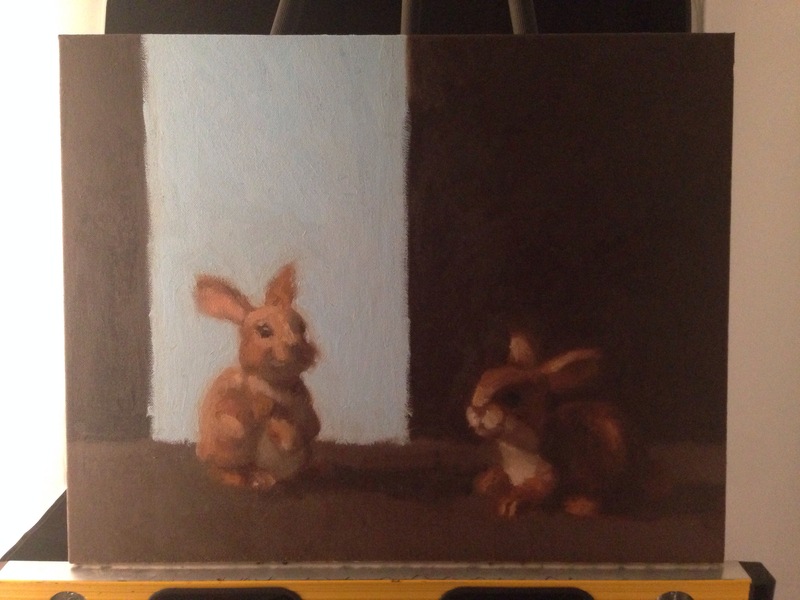 The bunnies were very fun to paint. 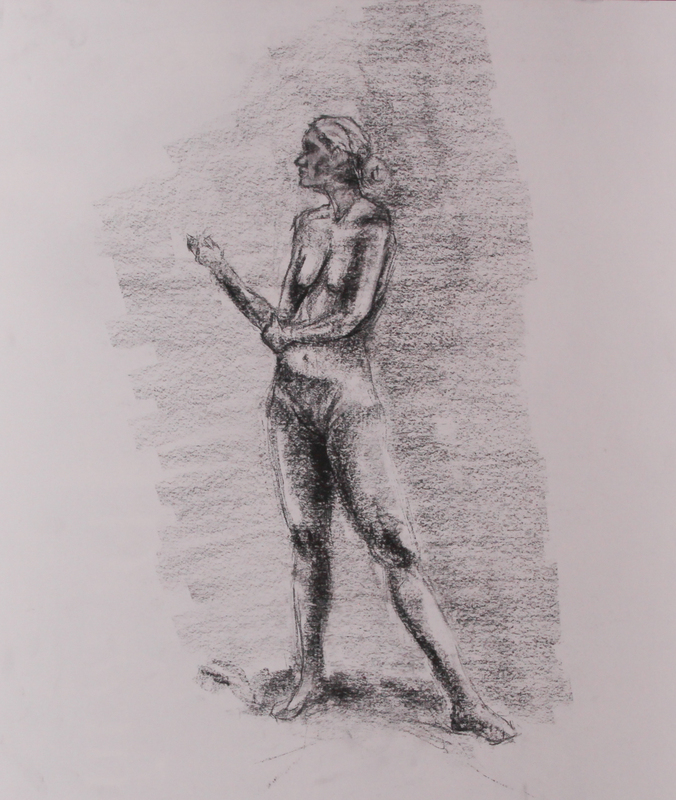 I felt like a sculptor as I worked away at their large, clay-like forms. Session by session I whittled the brown masses down until I had the proper shapes. Occasionally, I had to enlarge areas of paint (mainly on the back of the lefthand bunny, where I fiddled with its posture), but most of the time my painting was a subtractive process. Since seeing John Singer Sargent’s watercolor exhibit at the Museum of Fine Arts, I have kept one thing in my mind: paint the darks thin and the lights thick. That is how Sargent achieved the amazing depth in his paintings. I tried to mimic that concept in the righthand bunny. The only perspectival issue I ran into centered around the shape of the eyes. I had to constantly readjust them. 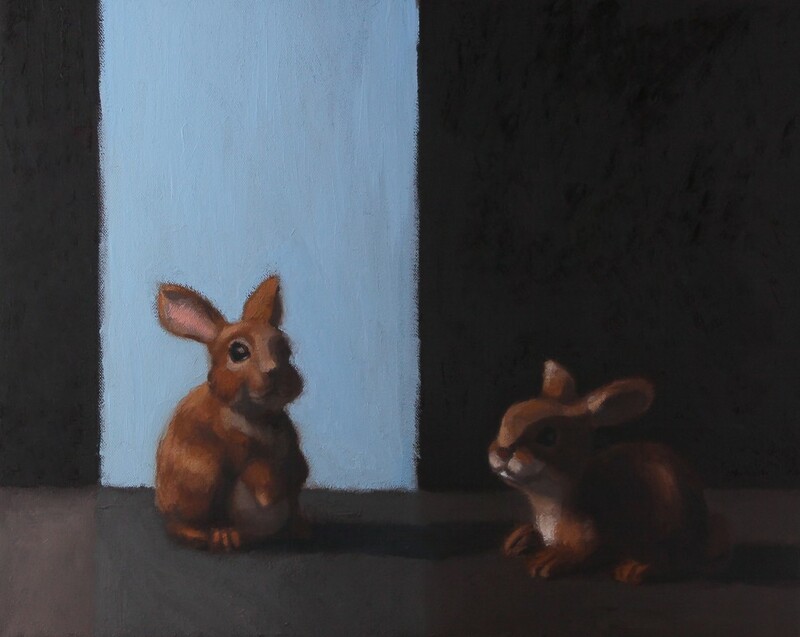 At first I thought the in-light eye on the lefthand bunny was wide and almond shaped, but I realized that the perspective was actually squishing the two corners of the eye together. It took some serious visual measuring for me to get the eye right. I kept adjusting it up to the last session. Since I had an entire week to work on the 16″x20″ painting, I decided to give it a little bit more of a finished look than I usually do. 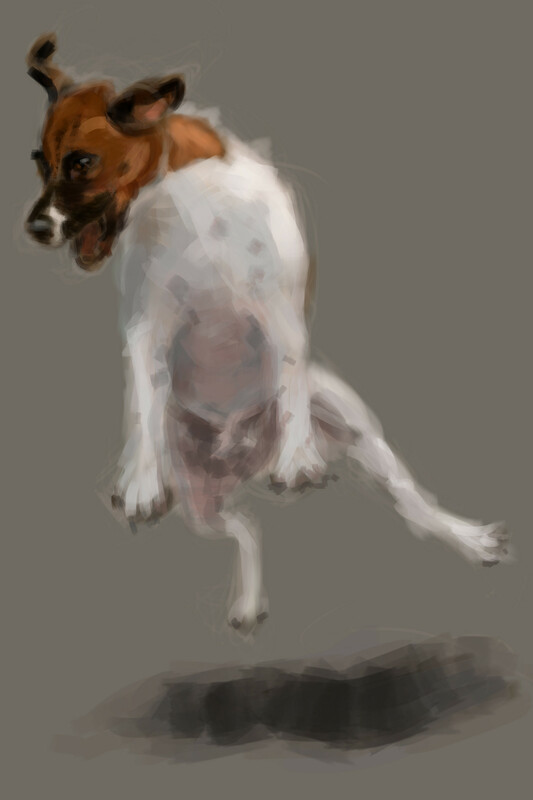 I smoothed down a little of the looseness. The last thing I did was add a slight blue reflection on the ground plane. Though this did not exist in real life, I felt the painting benefitted from it. That’s about it for this update. 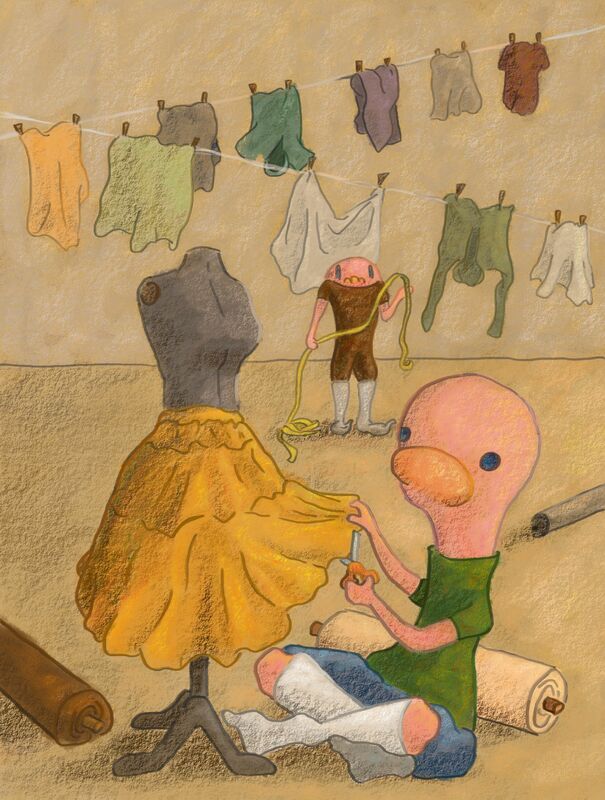 I’m still working on the children’s book and I’m almost done illustrating the first 10 pages. 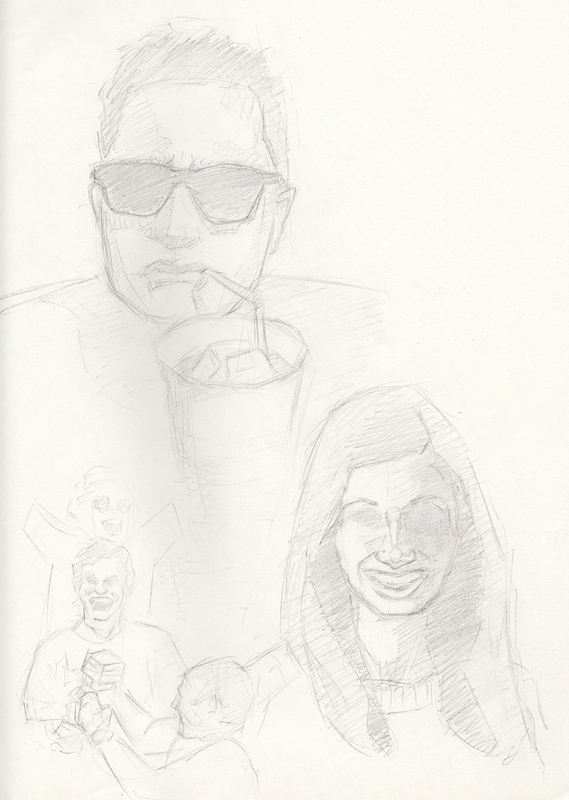 Also, I’m still drawing friends on facebook. I’ll update next week with some of those drawings. I’ve been spending a lot of time on my children’s book. 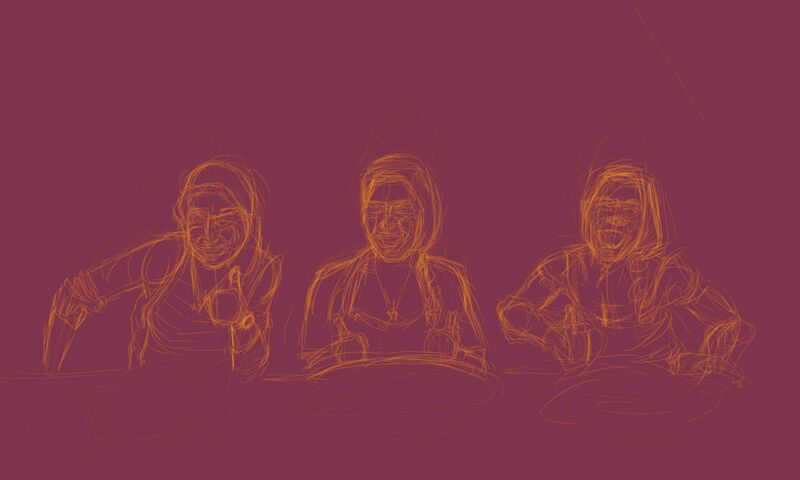 I finished plotting all the sketches and I’m now working on the final illustrations. It’s time to make the push and get this book finished. Unfortunately, it takes me about 8-10 hours to illustrate each page. So if I’m able to finish 3-4 pages a week, then I should be able to have the book done before the end of summer. And while I want to get the book finished, I don’t want to neglect painting. I’m torn between dedicating time to my paints and dedicating time to my tablet and Photoshop. 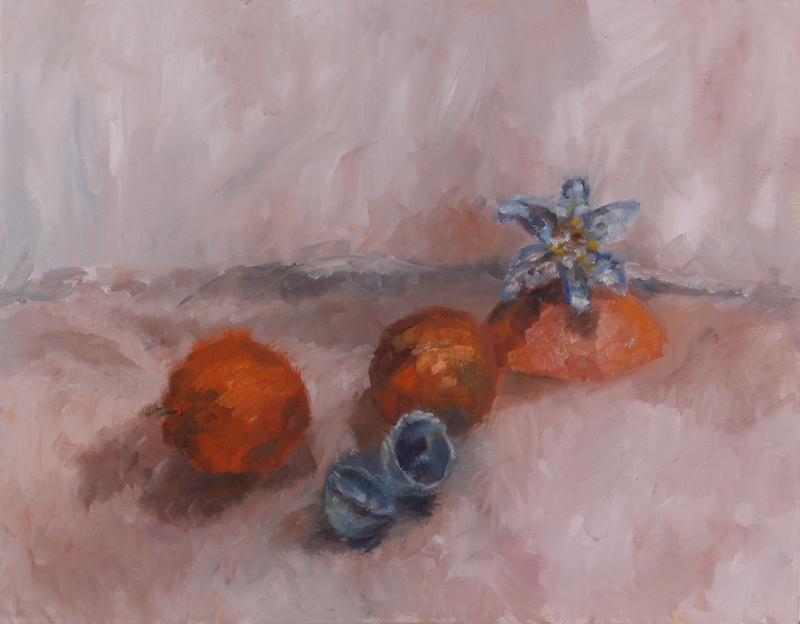 This week I was able to get a quick 9″x12″ still life painted as well as work on my book. Hopefully, all my weeks from here on out can be that balanced. 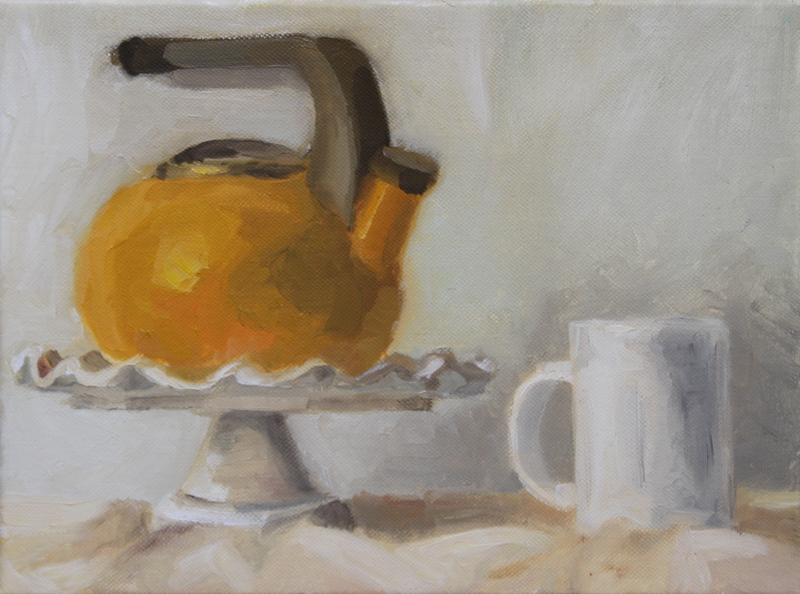 Like most of my recent still life paintings, this one has been brewing in my mind for months. The groovtacular lava lamp is a lovely shape and I’ve tried to work it into previous setups. It just doesn’t seem to want to go. I’m not even satisfied with it in this painting. The lamp almost NEEDS some other object that echoes or accents its shape. The hacky sack doesn’t seem to exactly work. Oh well. I only spent 4 hours on this, so I consider it just a sketch. I’ll have to revisit the lamp in another manner. I think once I finish all the pages I will have to go back and make them more unified. My technique seems to evolve from page to page. That’s just the learning process.